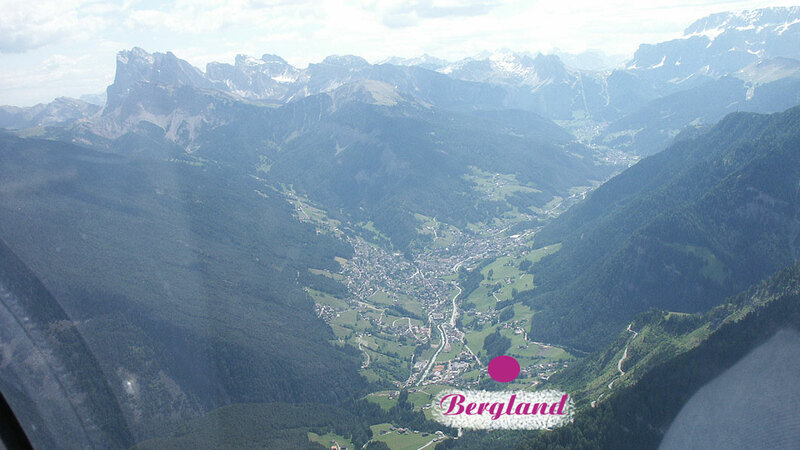 Val Gardena is located in the heart of the Dolomites, which are world-wide known for their vertical rock faces and the breathtaking views. Because of their uniqueness and extraordinary beauty, the UNESCO added these mountains to their list of the most beautiful and valuable landscapes of the world. They became a world natural heritage site on 26th June 2009. The valley is part of the Autonomous Province of Bolzano – South Tyrol, which lies in the very north of the Italian Republic. South Tyrol borders in the south to the Italian Autonomous Province of Trento, in the southeast to the Italian Region Veneto, in the north to Austria, in the northwest to Switzerland and in the west to the Italian Region Lombardy. During history, this area stood under various reigns until it was annexed to Italy in 1920. 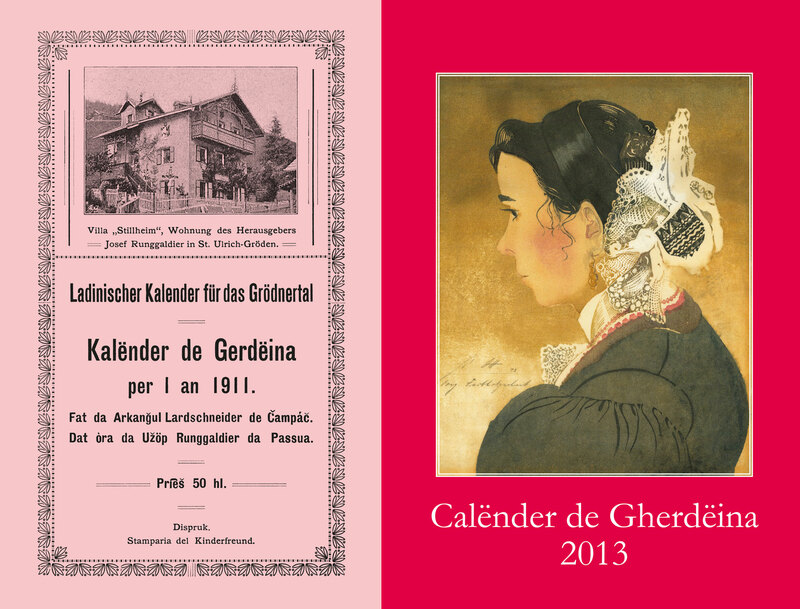 Before this date, it belonged to Tyrol, then part of Austro-Hungary. Thus, still nowadays, the majority of the people in South Tyrol speaks German. 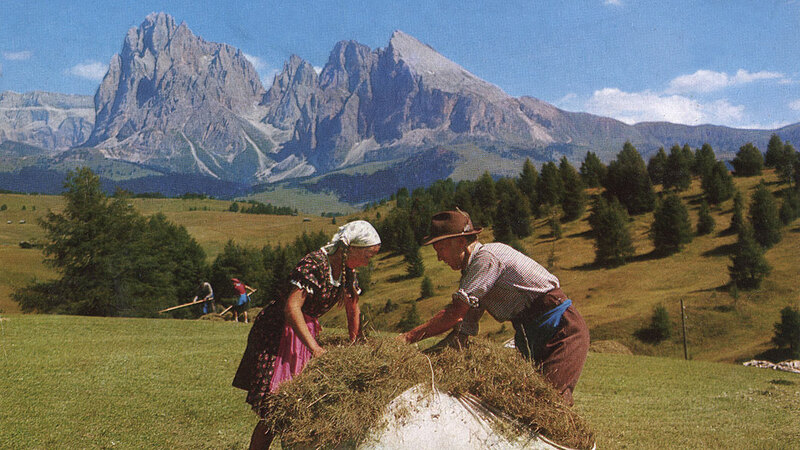 Not only the linguistic diversity but also the special South Tyrolean culture have contributed 1972 to the recognition of the Statute of Autonomy by the Italian Republic. 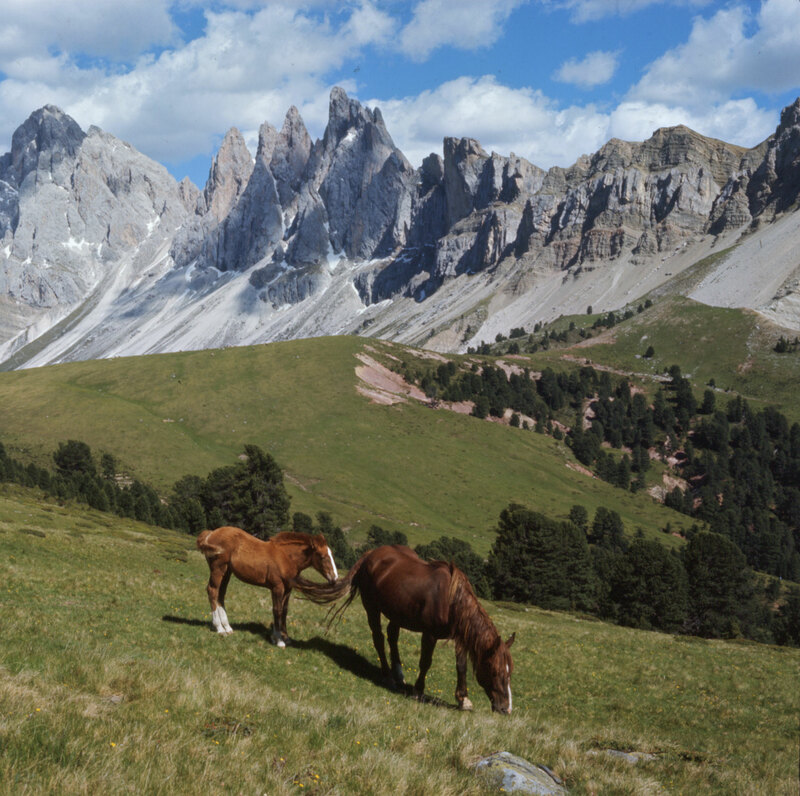 South Tyrol is considered an enviable autonomy model sought for by quite a few minority groups. This model is based on the peaceful coexistence of three different language groups: the Italian, the German and the Ladin one. 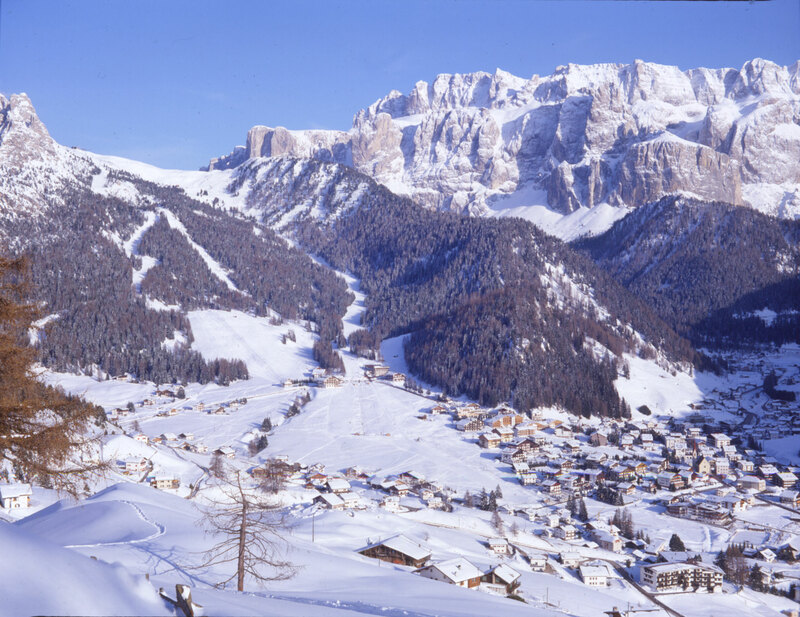 Ladin is spoken in all five valleys around the Sella Group: in Val Gardena, in Val Badia, in Val di Fassa, in Ampezzo and in Livinallongo. 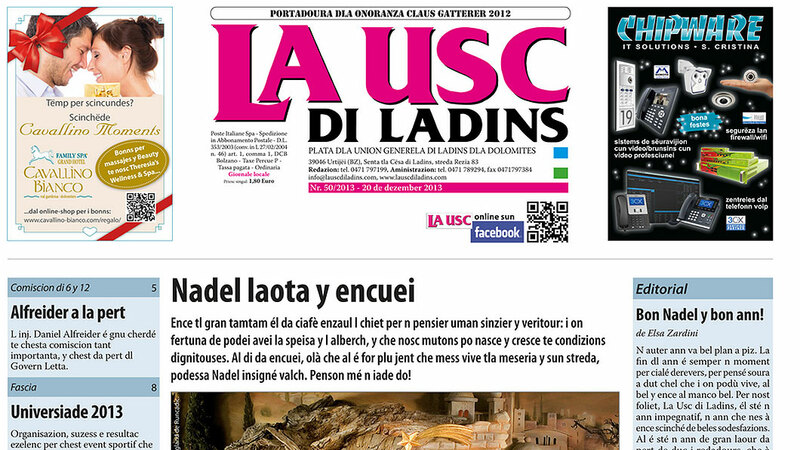 Ladin is a Romance language. It originated through the fusion of the Rhaetic language with the Latin one, which around 15 BC spread in the Alps through the Roman conquerors. Up until a few centuries ago, this Rhaeto-Romance language was spoken in a big area of the Alps. In the course of years, it almost completely disappeared because of the influence of the German language from the north and the Italian one from the south. Besides the Ladin areas in the Dolomites, there are two more Rhaeto-Romance linguistic enclaves: one is to be found in the Grisons in Switzerland and the other one in the Italian Autonomous Region Friuli-Venezia Giulia. 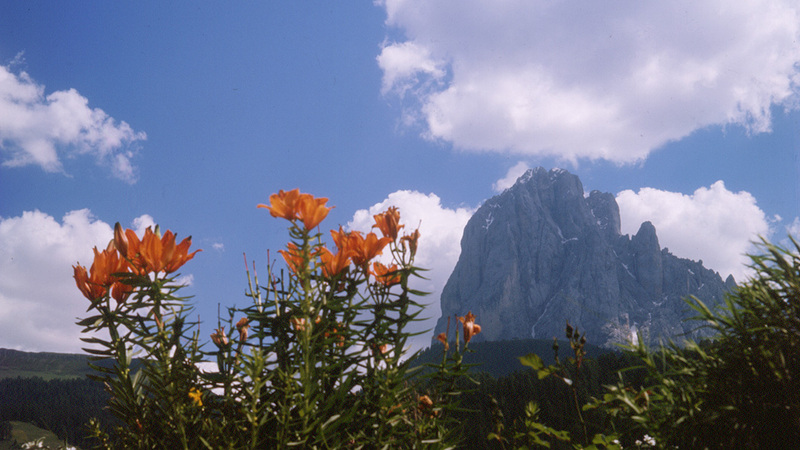 The majority of the people of Val Gardena (about 85-90 %) speaks Ladin as well as German and Italian. This is, among other things, promoted through a multilingual school system: the pupils are in contact with the three languages, used also as medium of teaching, from the very first day on. 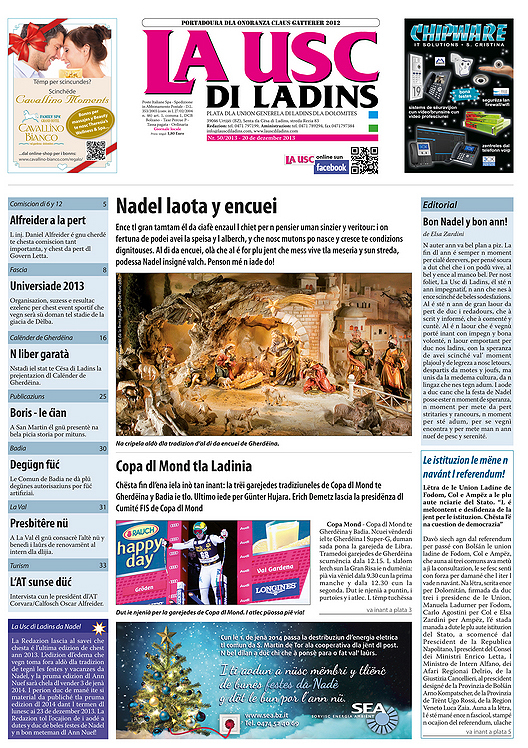 In addition, there are several cultural institutions which promote the research, the use and the dissemination of the Ladin language editing newspapers as well as television and radio programmes, composing and collecting literature and dictionaries and organizing concerts, expositions and other events. Hence, the valley is officially trilingual. This can also be seen looking at the place names listed always in all three languages. 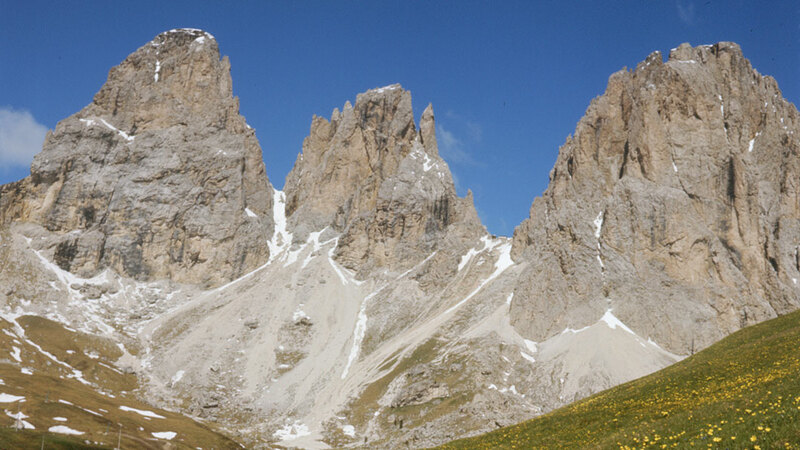 The first human settlements in Val Gardena date back to the prehistory. Some findings like arrowheads, needles and other tools, which were found at the foot of the Sella Group, are proof of an early settlement of this area around 6000 BC. It is probable that the objects belong to wandering hunters, who stayed in the valley in the summer months in search of food. 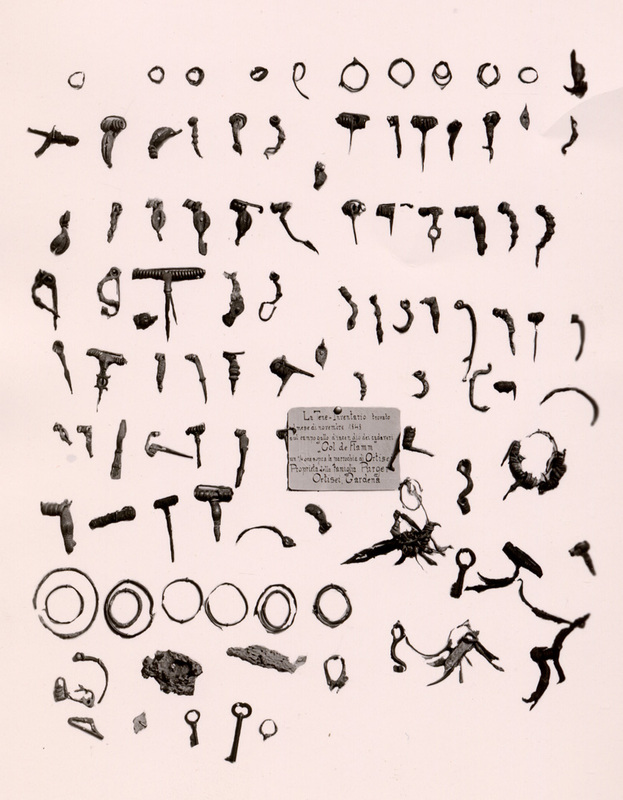 Other important findings come from the Col de Flam above Ortisei: the iron axes, fibulae of bronze, jewellery, Gallic swords and various tools are dated back to 400 BC. 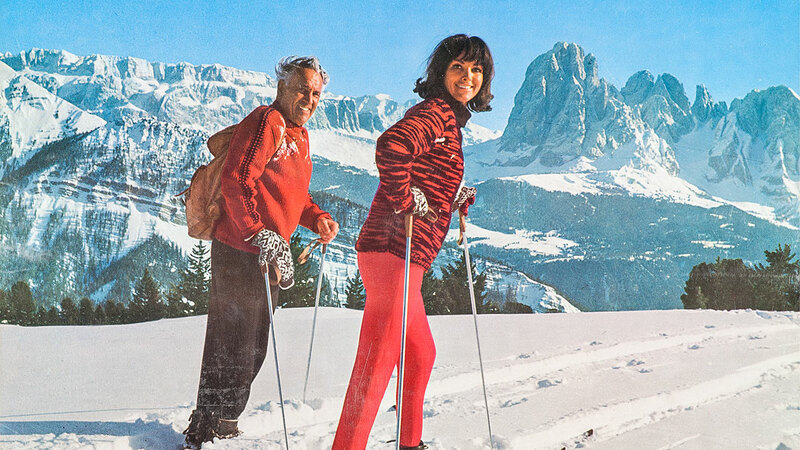 The first sedentary people in Val Gardena are the Rhaetics. In 15 BC the Roman general Drusus conquers the alpine areas and pushes the Rhaetic people back into the valleys which are difficult to access. The origin of this people is still not certain: maybe they were small groups of Ligurians, Illyrian Veneti, Etruscans, Gauls and Nordic people who were named so by the Romans. 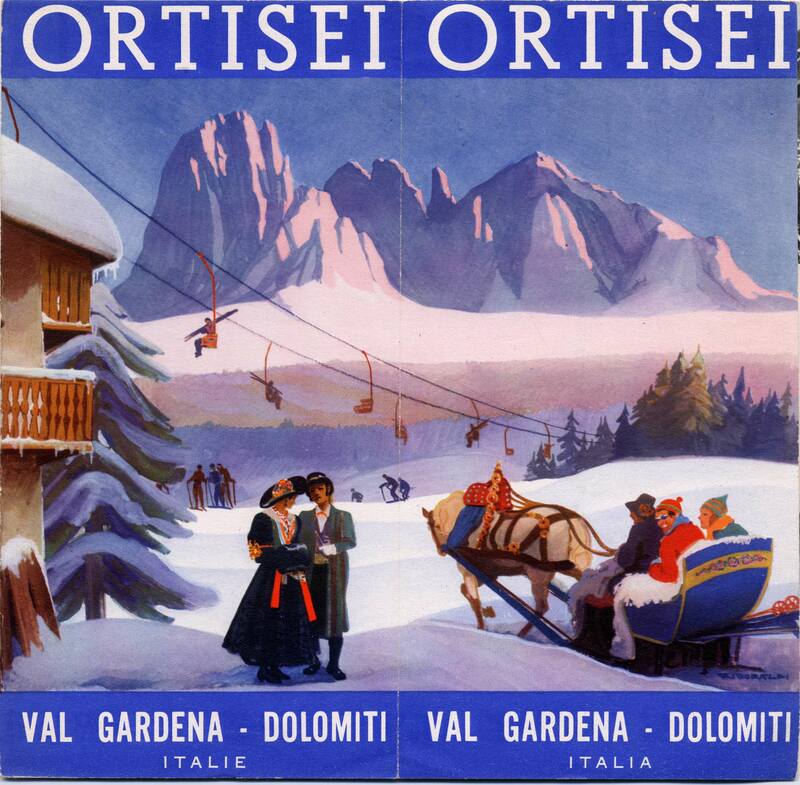 The name of Val Gardena originates from the Latin “forestum ad Gredine” meaning “woodland in Val Gardena”. 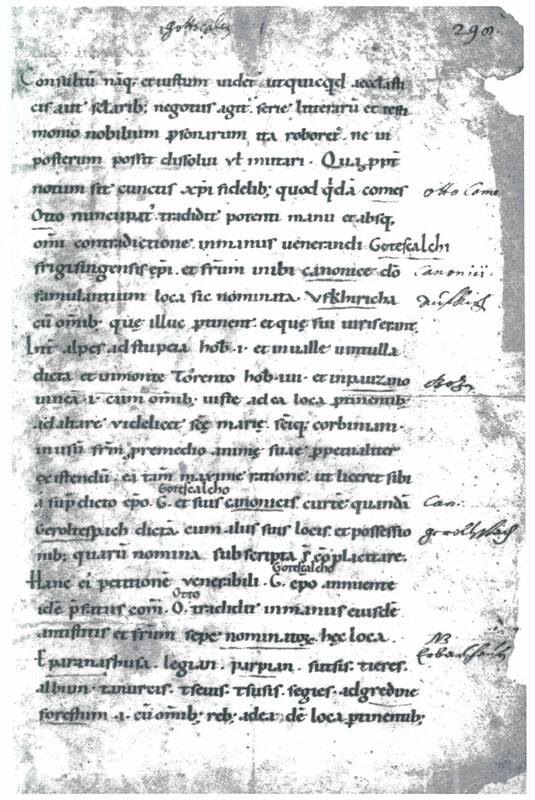 This designation is to be found in a document of 999 AD, which certifies the handing over of this area by Count Otto von Andechs to Bishop Gottschalk of Freising. The reason of this donation is very interesting: as in those days it was believed that in 1000 AD the world would end, those who disposed over possessions donated a part of them to the Church in the hope of being rewarded in the afterlife. 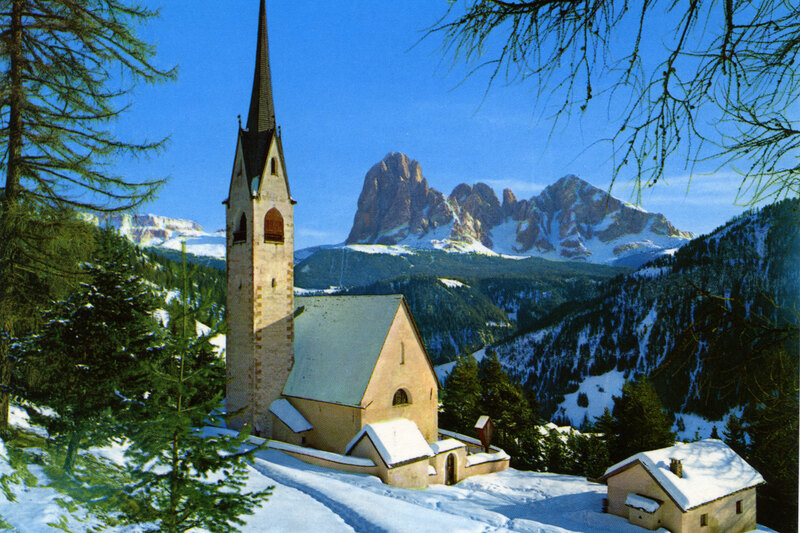 Val Gardena is a tributary valley of Valle Isarco and extends from east to west for 25 km. 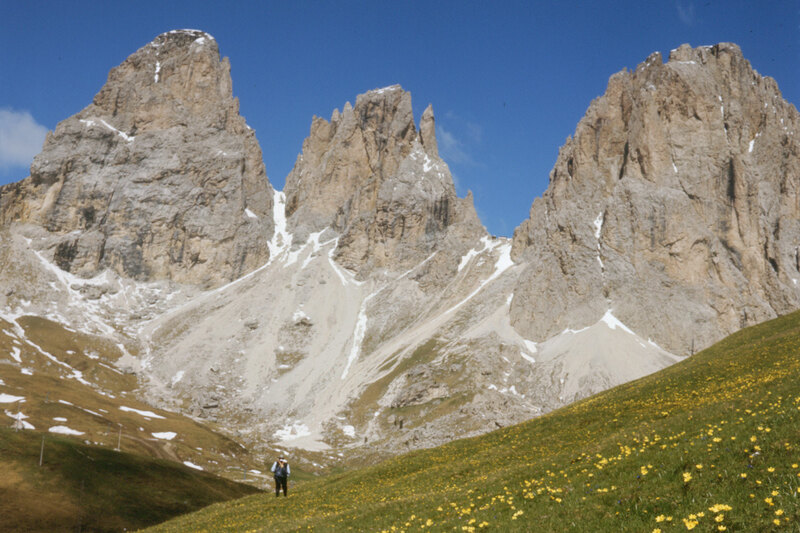 The valley lies at an altitude ranging from 2244 m at the Passo Sella to 471 m in Ponte Gardena. 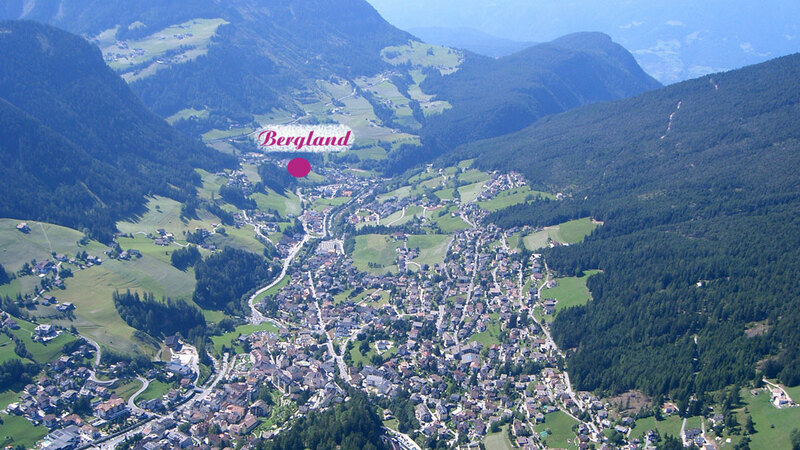 In Pontives there is the German-Ladin linguistic boundary and the actual beginning of Val Gardena. 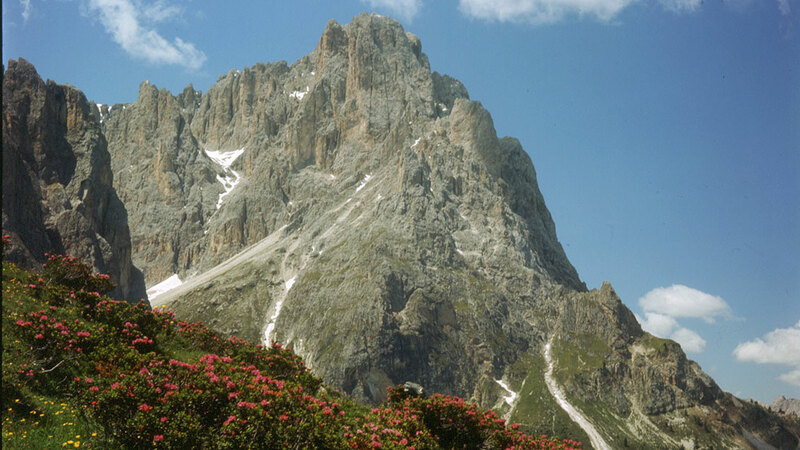 Through the whole valley runs the Rio Gardena (German Grödner Bach, Ladin Derjon), which rises at the Passo Sella and joins the Isarco in Ponte Gardena. 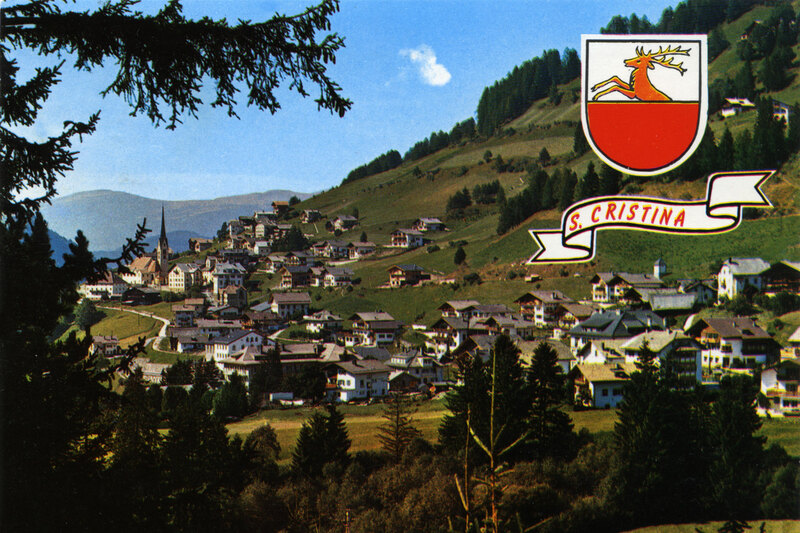 Val Gardena comprises three municipalities: Ortisei (German St. Ulrich, Ladin Urtijëi), S. Cristina (German St. Christina, Ladin S. Crestina) and Selva Gardena (German Wolkenstein, Ladin Sëlva). 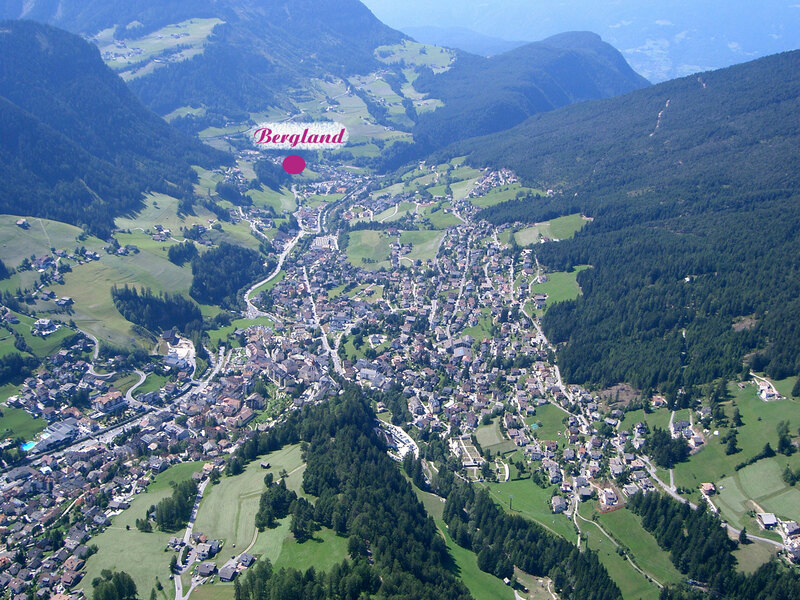 The localities Bulla (German Pufels, Ladin Bula), Roncadizza (German Runggaditsch, Ladin Runcadic) and Oltretorrente (German Überwasser, Ladin Sureghes) belong geographically and linguistically to Val Gardena but were annexed long ago to the municipality of Castelrotto (German Kastelruth, Ladin Ciastel). 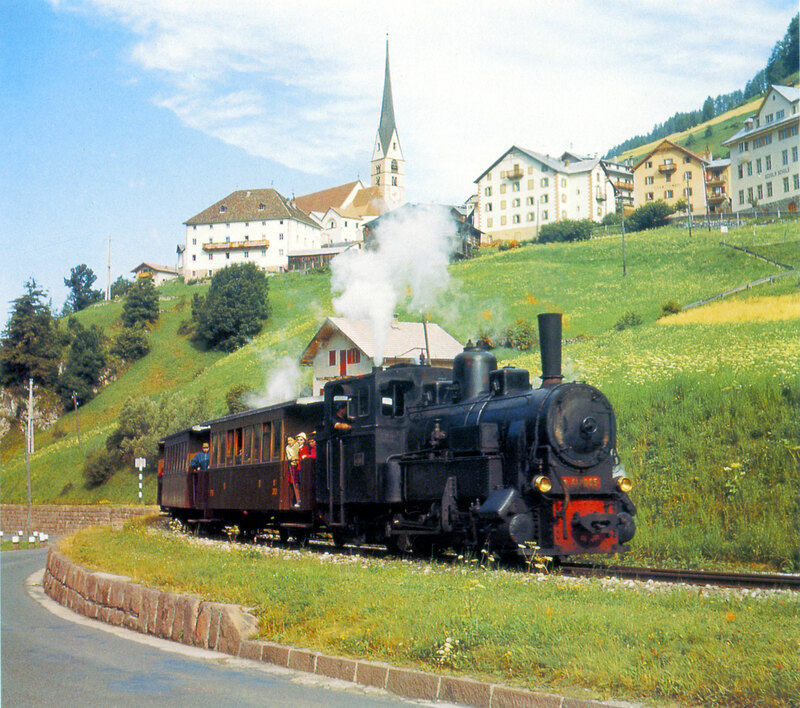 Ortisei is the main village of the valley and has approximately 6000 inhabitants. 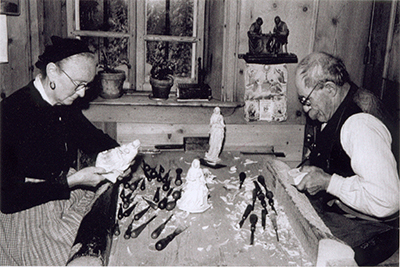 The village can look back on a long and intensive history in the trade with wooden handicraft products and boasts four important churches: the medieval St. Jacob’s church, the St. Anthony’s church on the same-named square, the St. Anne’s cemetery church and the parish church consecrated to St. Ulderico. Because of the steady population growth, the main church, that is to say the parish church erected in 1342, was completely rebuilt in 1793 thanks to the magnanimity of the wealthy locals. 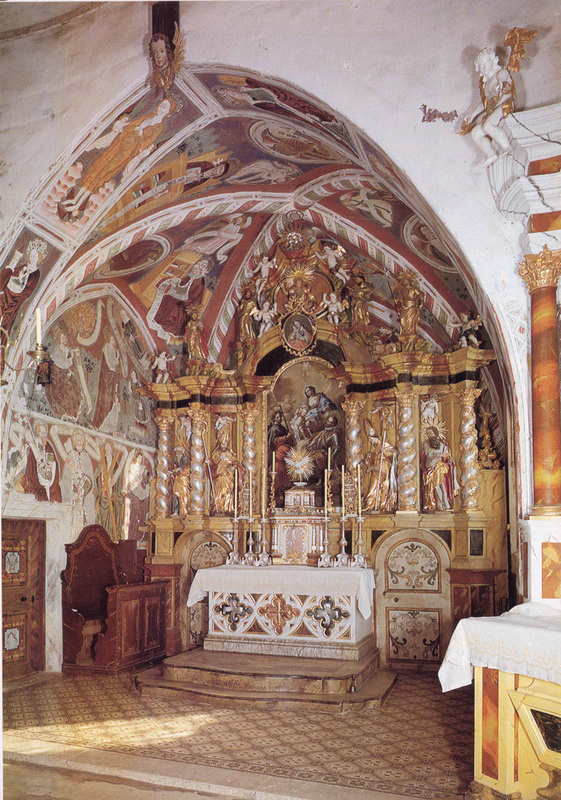 The church was enriched with furnishings and ornaments made by the best artists and artisans of the valley. 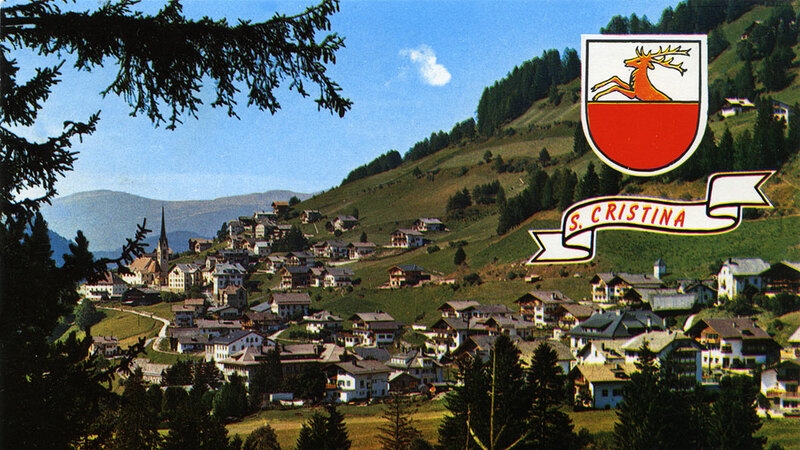 S. Cristina lies in the geographical middle of the valley and has only approximately 1900 inhabitants, thus being the least populated municipality of the valley. 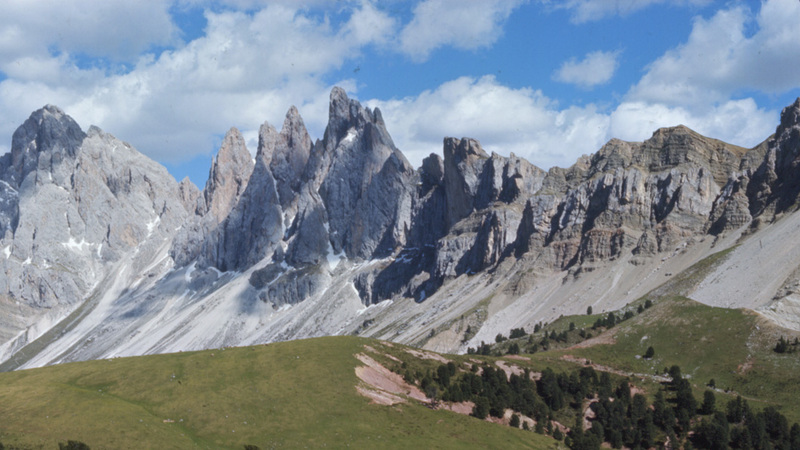 It is located right in front of the symbol of Val Gardena, the majestic Sassolungo (3181 m), which is climbed by many mountaineers every year. With the construction of a bypass in 2009, it was possible to take away the traffic from the village centre. Since then, the locals and the numerous tourists enjoy a much quieter and more pleasant life in the centre. Selva Gardena is situated at 1563 m and has about 2600 inhabitants. 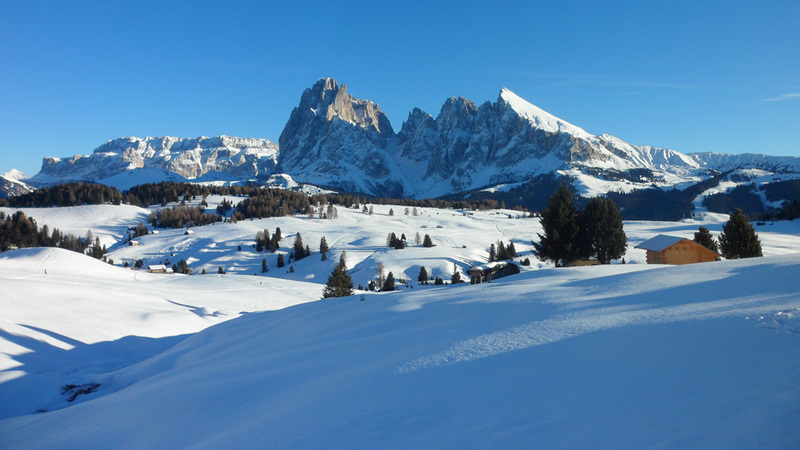 From the village, one can admire the Sella Group, the Sassolungo and the Puez. 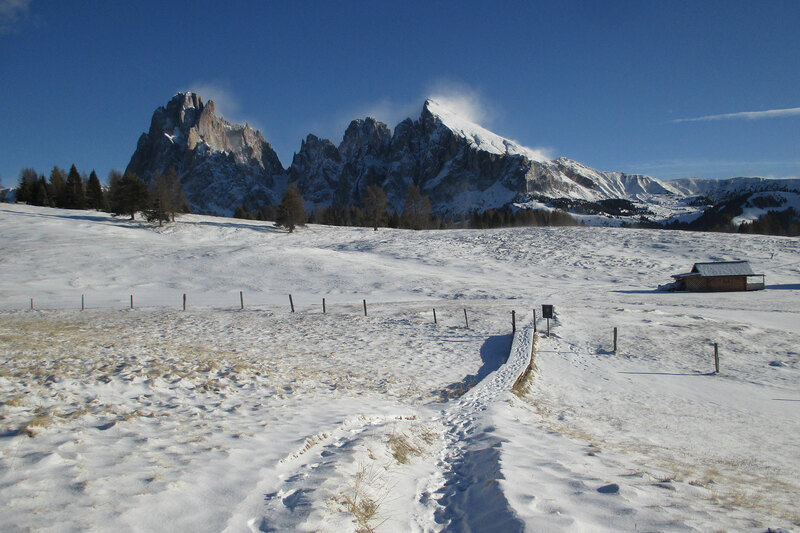 It borders in the east on the mountain passes which enable to drive round the Sella Group and to reach two more Ladin valleys: the Val Badia crossing the Passo Gardena and the Val di Fassa crossing the Passo Sella. 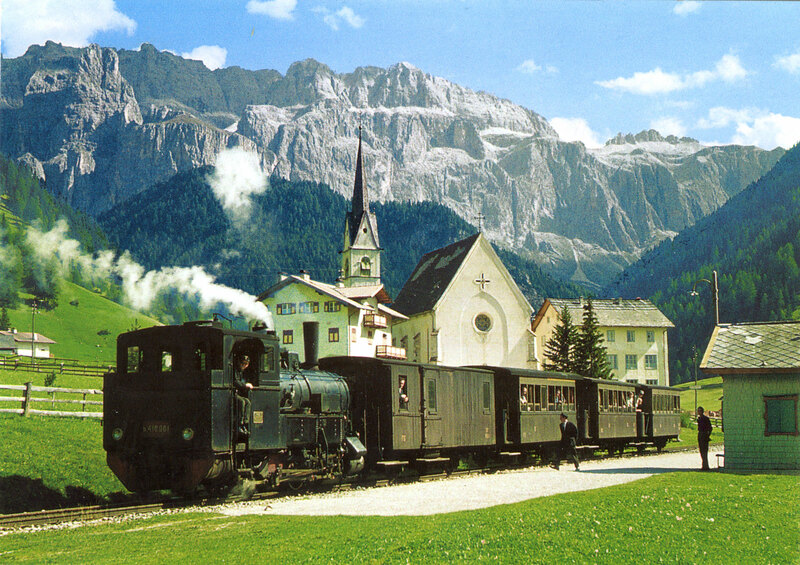 Selva Gardena is one of the most popular holiday destinations in winter as well as in summer. 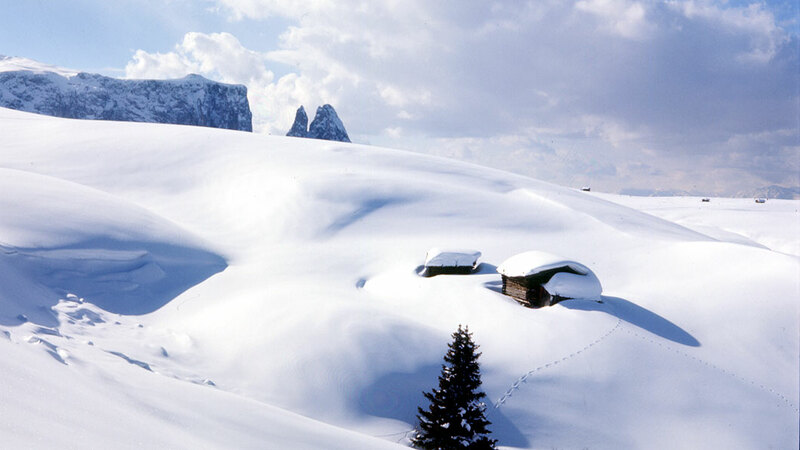 Despite the altitude, the climate in Val Gardena is relatively mild thanks to the influence of the moderate climate of Valle Isarco. The sunniest month is July: the highest temperatures measured are around 25°C. The valley is though well-protected from oppressiveness, which is to be found in some of the lower situated valleys. The warmest summer months are July and August. The autumn is normally milder than the spring. The months November and December are moderately cold with little precipitation. The winter is characterized by abundant snowfall as well as cold and dry but mainly sunny days. January is the coldest month of the year even if the snowfalls in February are undeniably stronger. As the valley opens only towards west, it is well-protected against the cold north winds. The mountains Seceda, Odle and Puez are natural barriers of the valley, in which foggy or windy days are very rare. 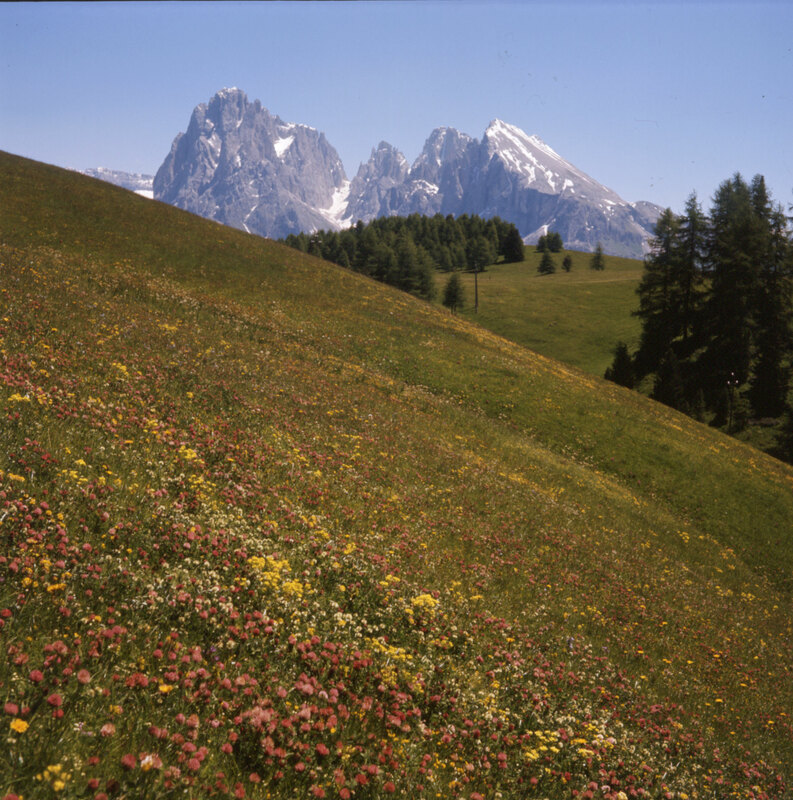 Nevertheless, the climatic disadvantages in the alpine regions should not be underestimated, as the spring starts considerably late and when, for example, in Ortisei the first trees are blooming, in Bolzano the first cherries can already be picked. 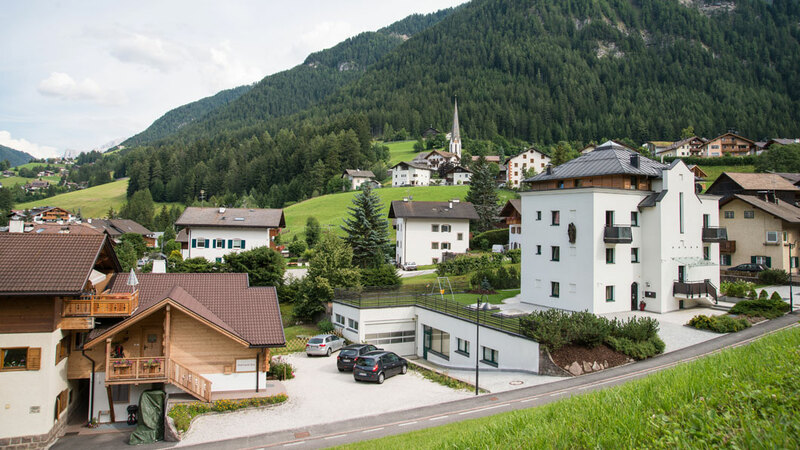 The houses are built in an area going from 1150 to 1700 m. Especially disadvantaged are those which are located on the shady side of the valley. 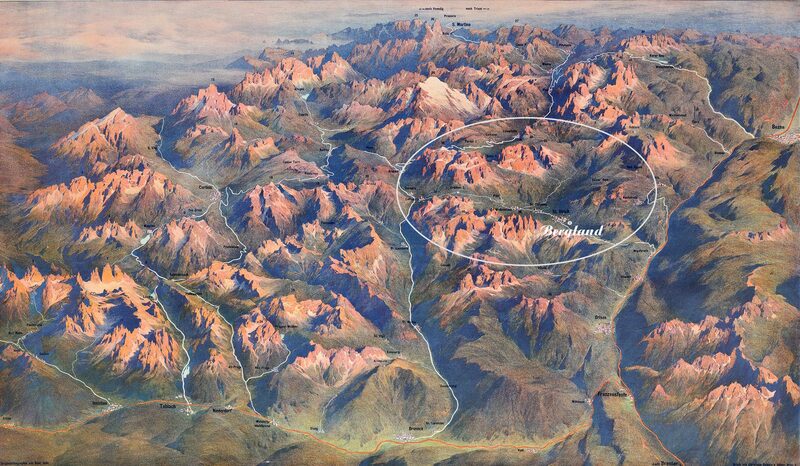 The location can therefore play a bigger role than the altitude. The climatic conditions of the valley are not suited for the cereal cropping such as wheat, rye, barley or oat. Therefore, the agricultural land is used almost exclusively as meadows or pastures. 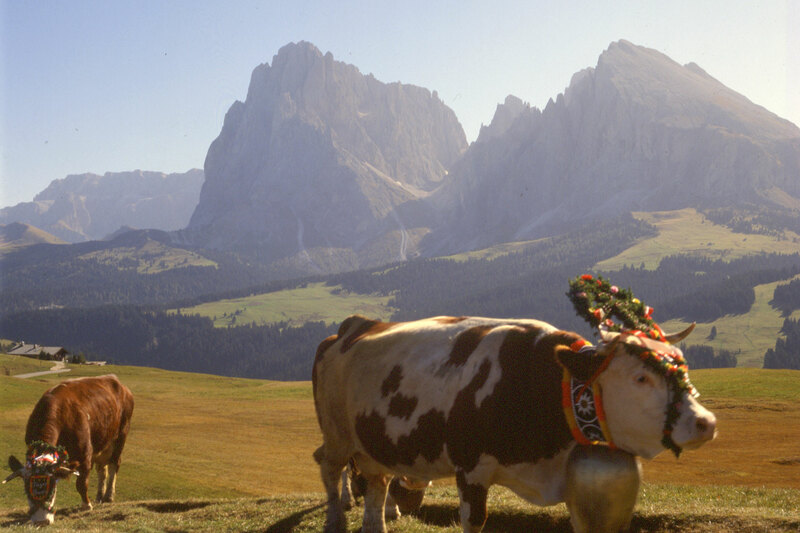 Val Gardena is more suited for livestock farming due to the excellent hay which is cut in the high mountain regions. 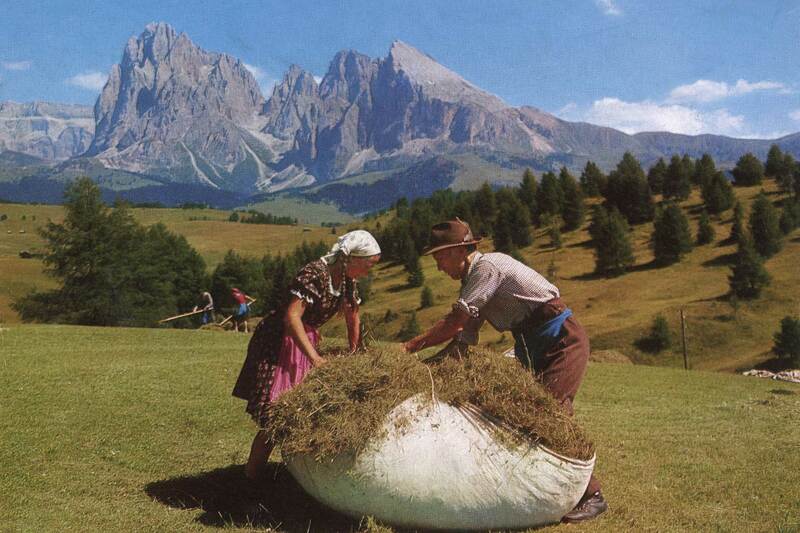 This hay is also used for the so-called “hay baths”, an activity spread above all on the Alpe di Siusi, Europe’s largest high plateau. 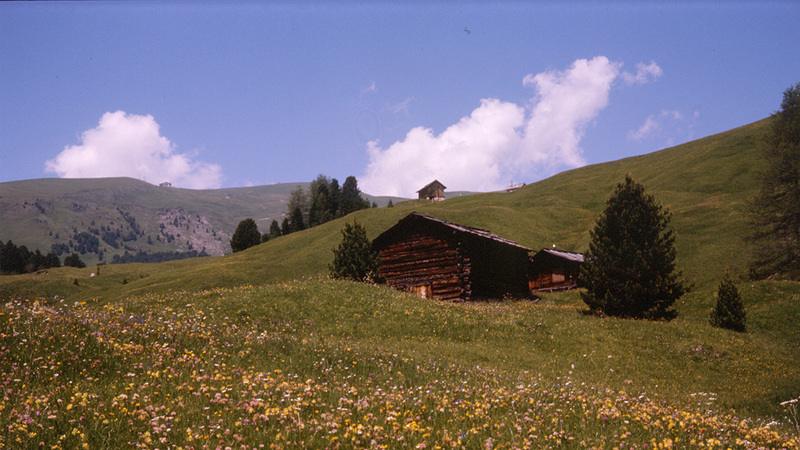 Even today, large areas of the mountain sides are covered by woods, above all in the municipality of Ortisei. 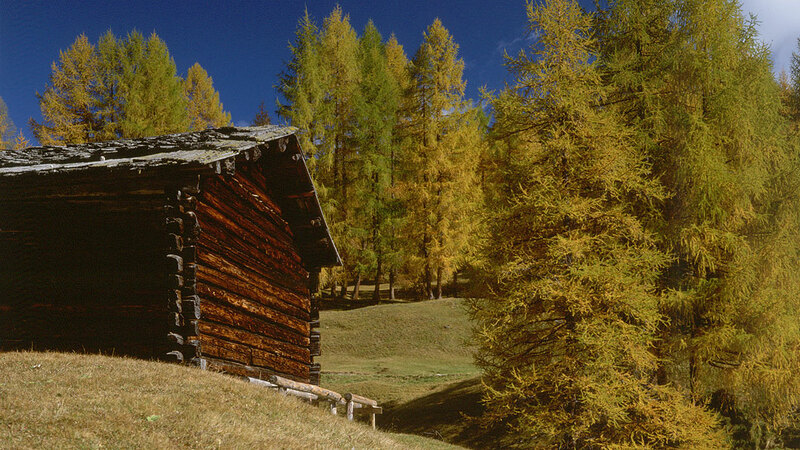 The forests are made up of conifers, as it is the case also in the rest of South Tyrol. Leaf trees are rather rare and the few which grow in the valley are to be found close to the Rio Gardena. The tree line is at about 2150 m, whereas at an altitude of about 2300 m only small trees grow. The woods are composed mainly of spruces and larches but also firs and pines can be found. Painting with oil-based paints. Everything is painstakingly added, down to the smallest of details. 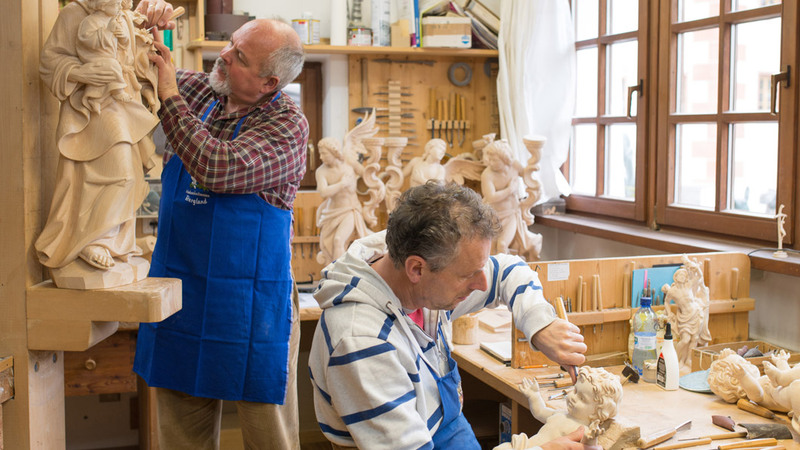 The most important economic sector in Val Gardena is tourisms, but traditional handcraft follows right behind it. 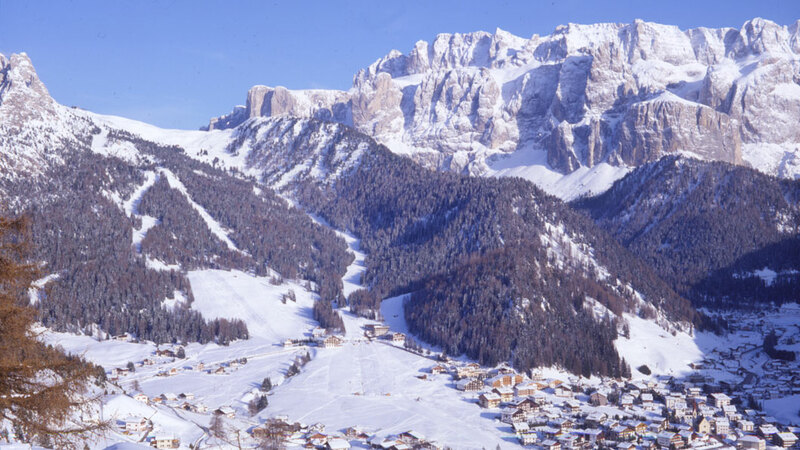 It is those two economic sectors which have made Val Gardena known worldwide. The beauty of the mountains and the excellent tourist infrastructure make it possible to spend unforgettable summer and winter holidays in the valley, doing sports and enjoying being in close touch with nature. 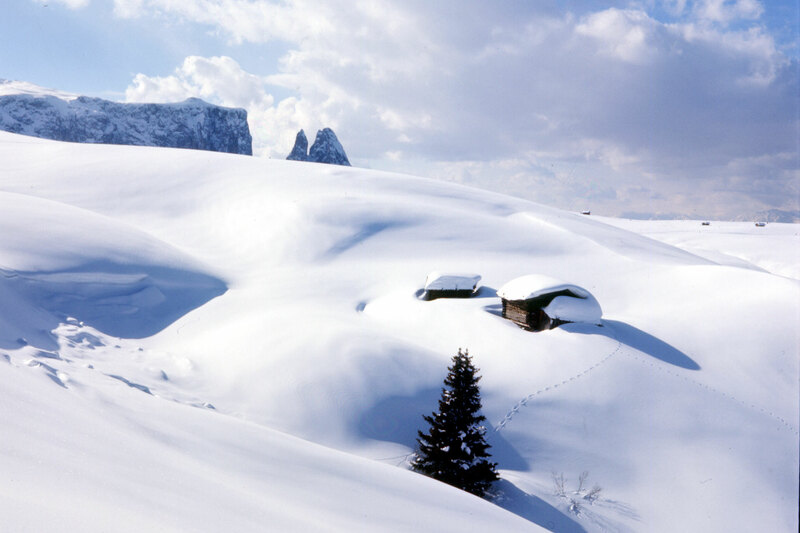 In the winter months, Val Gardena offers numerous lifts and cableways for the skiing enthusiasts and many kilometres of cross-country ski runs. 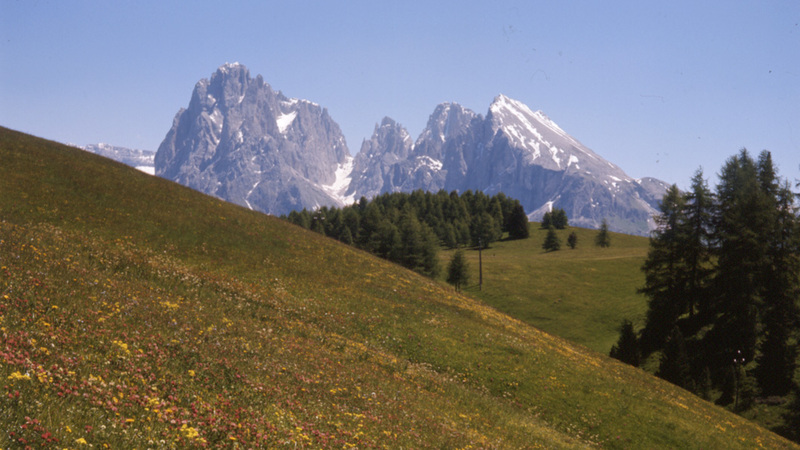 In the summer, the breathtaking alpine landscape is the perfect setting for walking, hiking, climbing and mountain biking. 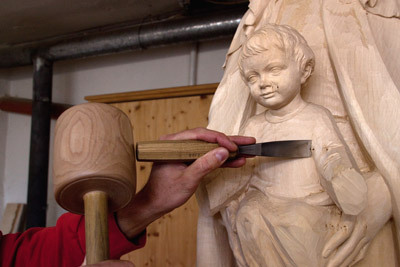 However, seen from a historical perspective, the basis for Val Gardena’s economic boom are sculpting and wood carving. Over many centuries, this economic sector has employed many families of the valley. 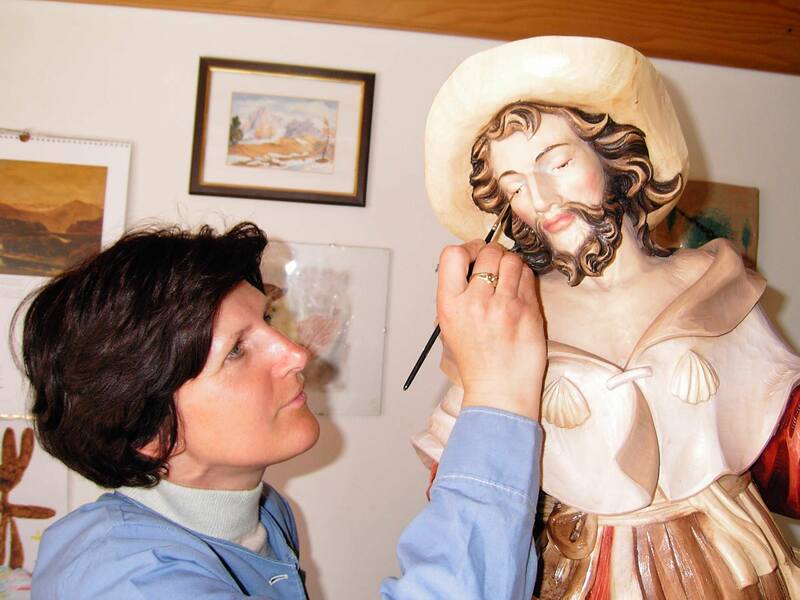 Still nowadays there are numerous firms, independent sculptors and art as well as vocational schools which still perform this activity and which are the pride of the people of Val Gardena. 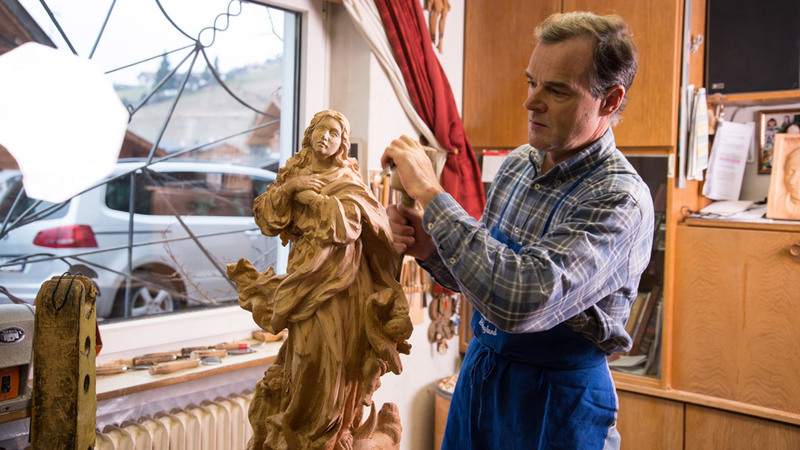 The wooden works of art of Val Gardena are known all over the world. It is in fact unthinkable not to mention Val Gardena when talking of wooden sculptures. The beauty and the uniqueness of the products of Val Gardena proof that a cultivated tradition can become a synonym for quality. 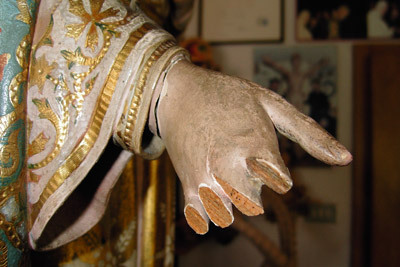 Many wooden articles are produced in the valley: religious figures such as Madonnas, crucifixes, nativity scenes, saints, angels and holy water receptacles, secular figures such as animals, skiers, masks, clowns, historic or famous personalities and also design objects such as chairs, tables, mirrors, lamps, nutcracker and many more articles. As already mentioned, Ladin is the oldest language in the Alpine region: it emerged in the 1st century AD from the fusion of the Celtic culture of the Rhaetic people and the Roman one. The various migrations were a strong threat for this language. 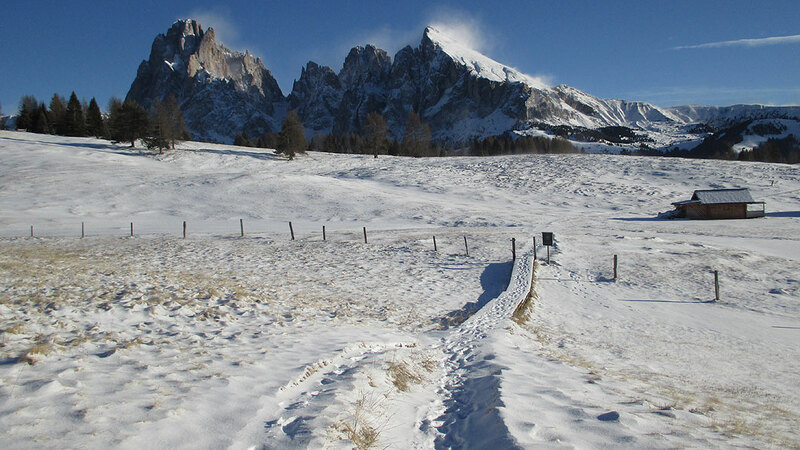 Luckily, is survived in some tributary valleys: in Val Gardena, Val Badia, Val di Fassa, Livinallongo, in the area around Cortina d’Ampezzo as well as in the Italian Autonomous Region Friuli-Venezia Giulia and in the Grisons in Switzerland. 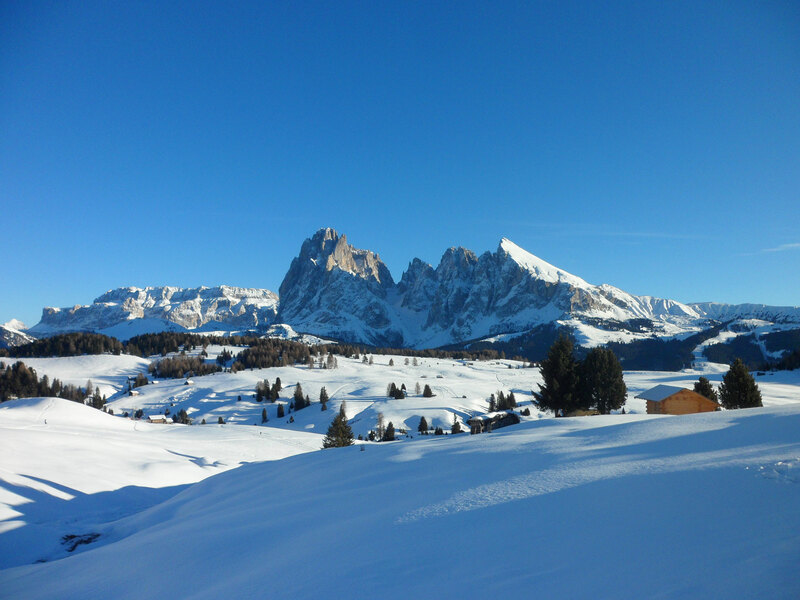 The Ladin language is one of the most outstanding characteristic of Val Gardena and has attracted the interest of many linguists. Although it has some similarities with Italian, its orthography, vocabulary and pronunciation are yet very different. In addition, Ladin was born one thousand years before the Italian language, and it is not a dialect as many people erroneously still believe. Unfortunately, the modern technological progress has forced the people of Val Gardena to use words of other languages in order to describe new concepts and objects which are not present in the original language. The majority of the assimilated words comes from German, Italian or English, what inevitably brings an impoverishment of the language with it. 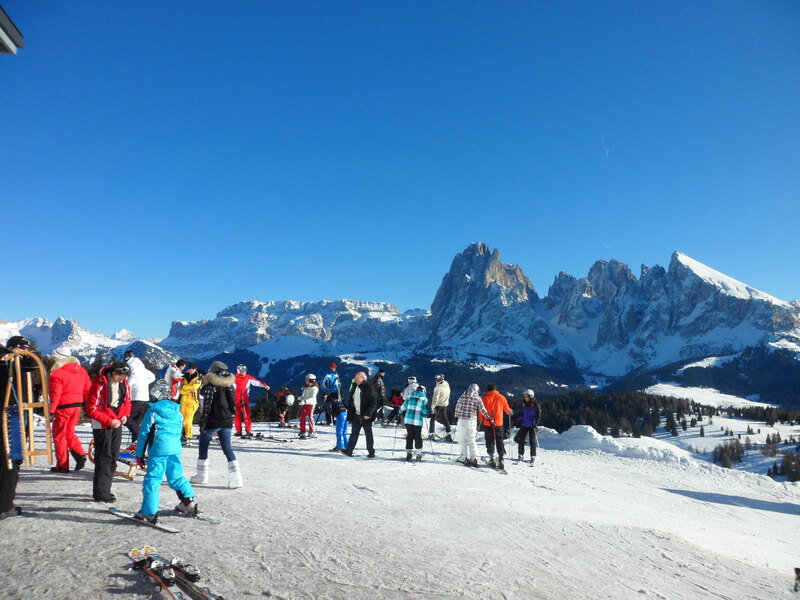 An interesting fact is that knowing Ladin makes it easier for the people of Val Gardena to learn other languages. 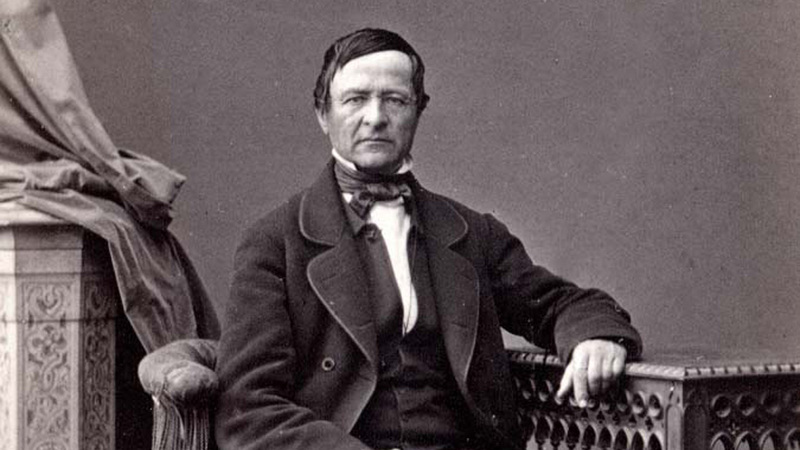 One of the first ones to show this phenomenon was the famous minnesinger Oswald von Wolkenstein, who on his numerous journeys confirmed that his knowledge of the Ladin language helped him a lot in learning other Romance languages. 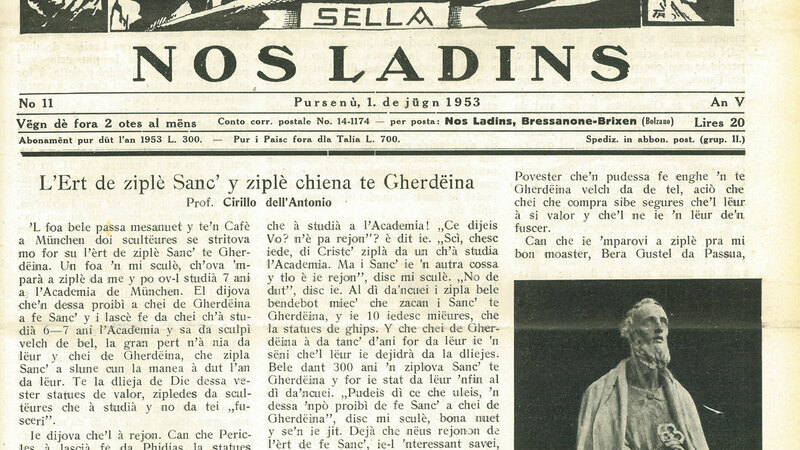 The first one showing interest for the Ladin language from a philological point of view was the priest J. 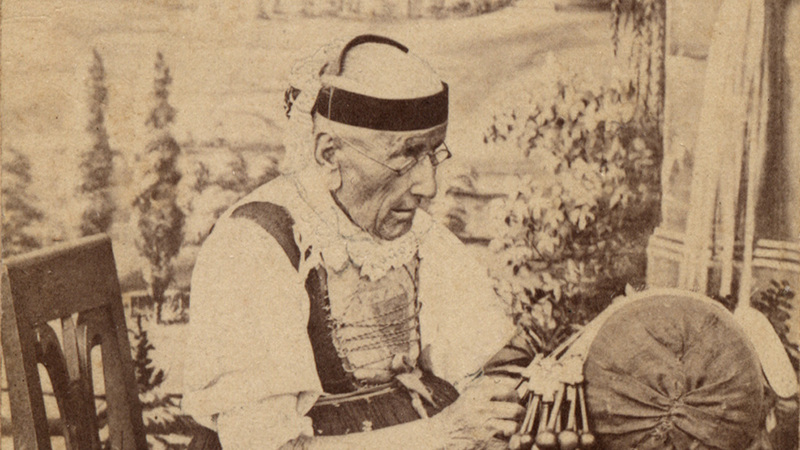 A. Vian of the municipality of Ortisei, who was from Val di Fassa. He analyzed thoroughly the Ladin grammar and vocabulary and collected the idiomatic forms of this language in a book. This study was the basis for the work of many other scholars. Nowadays, Ladin is officially recognized as a language and thousands of lemmata have been integrated with their translation and description in dictionaries. 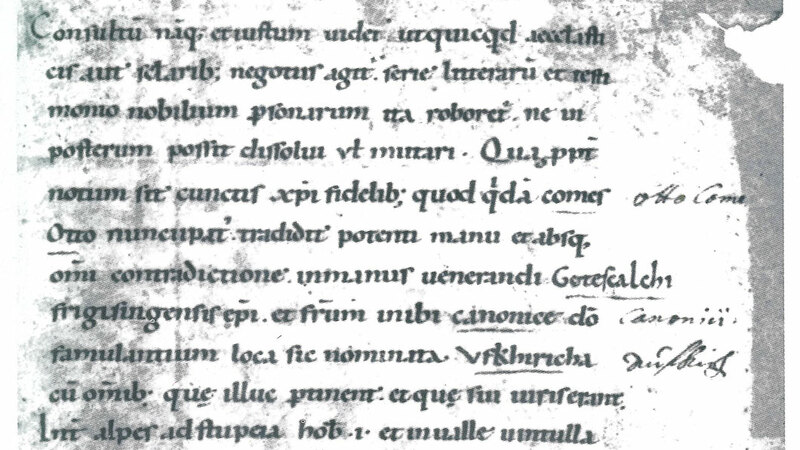 Some linguists estimate, that 80 % of the Ladin words originate from Vulgar Latin, 15 % from Germanic and the rest from the ancient language of the Rhaetic people. 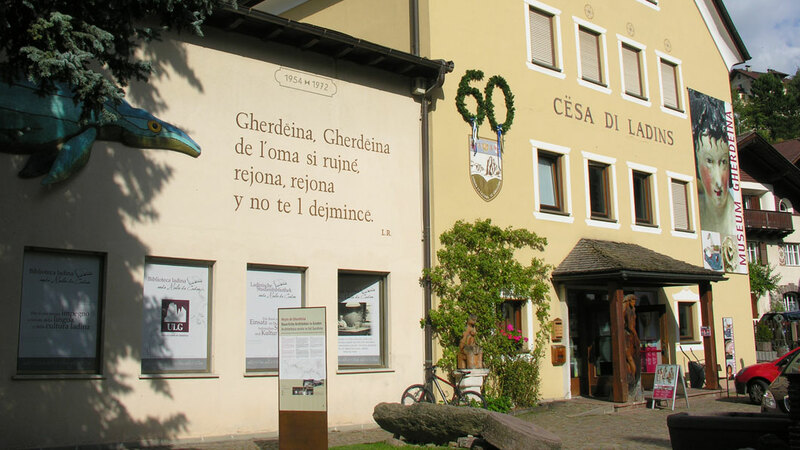 In the Museum de Gherdëina in Ortisei, founded in 1960, many testimonials of the Ladin culture and tradition can be visited. 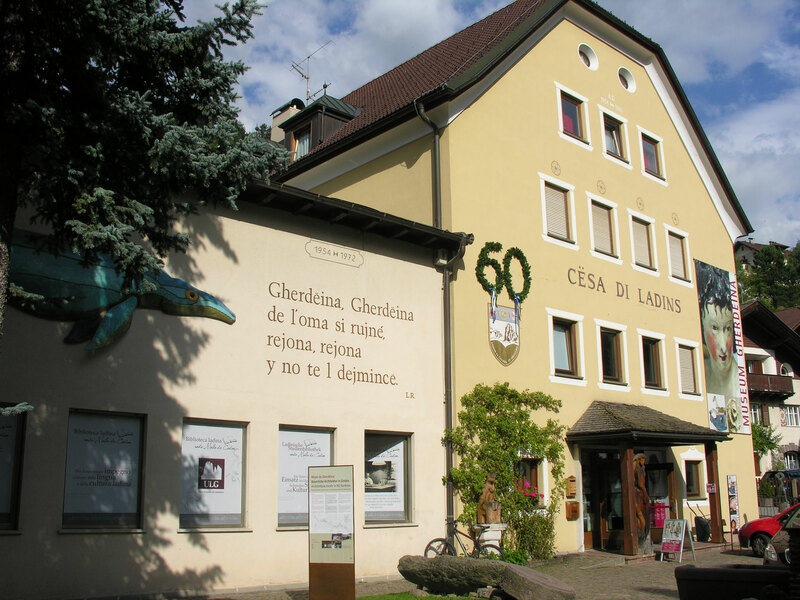 The museum is located in the Cësa di Ladins (“House of the Ladins”) and hosts interesting collections documenting the wood carving evolution from the 16th century until today as well as geological and archaeological discoveries of the Dolomite area. 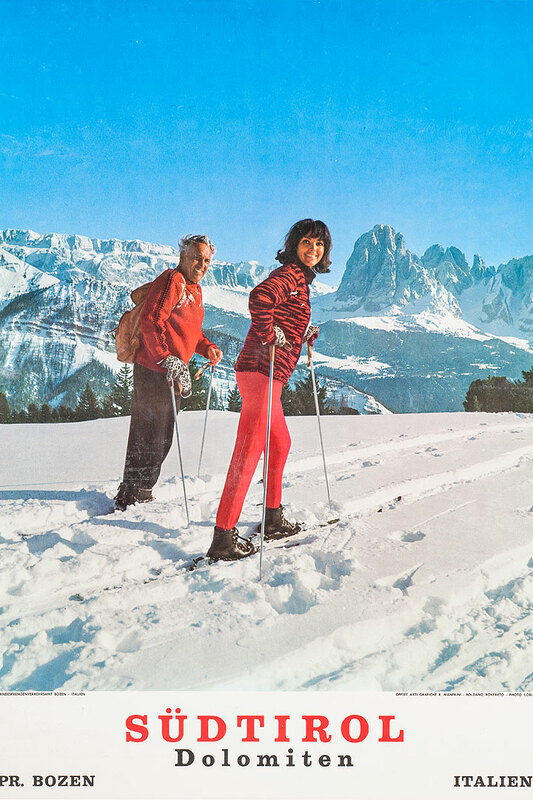 A permanent exposition illustrates and commemorates the adventurous life of the famous film maker and mountaineer of Val Gardena Luis Trenker (1892-1990). 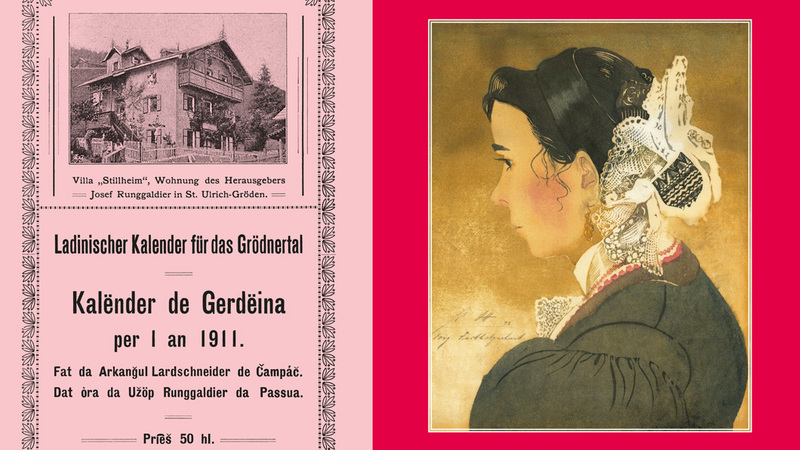 The museum and its activity such as the organisation of numerous cultural events as well as the promotion of historic and scientific research would not exist without the Union di Ladins de Gherdëina. 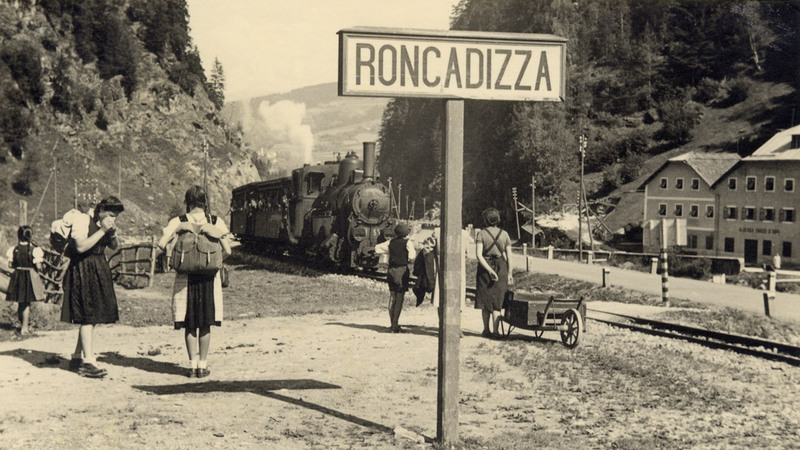 This non-profit association was founded in 1946 and is part of the Union Generela di Ladins dla Dolomites, the most important cultural association of the Dolomite Ladin area. 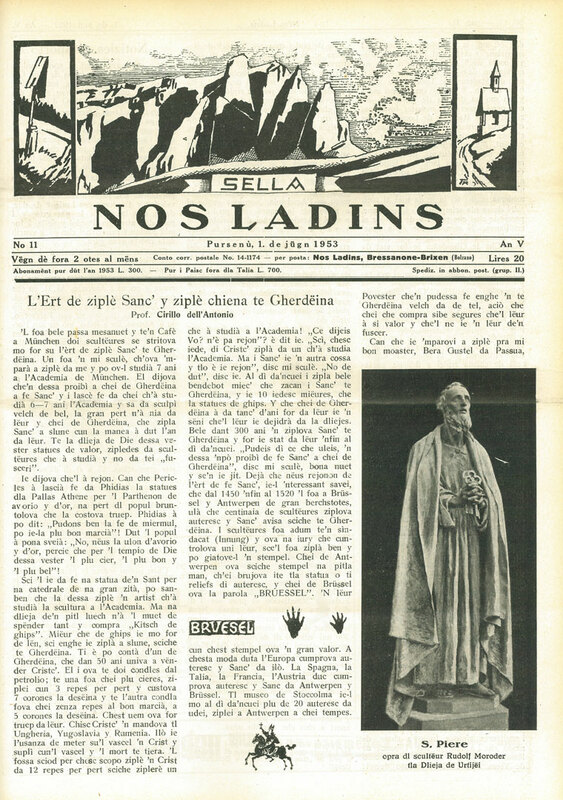 The Union di Ladins de Gherdëina promotes the Ladin language and culture through television and radio programmes as well as through publications, expositions, concerts and theatrical productions. 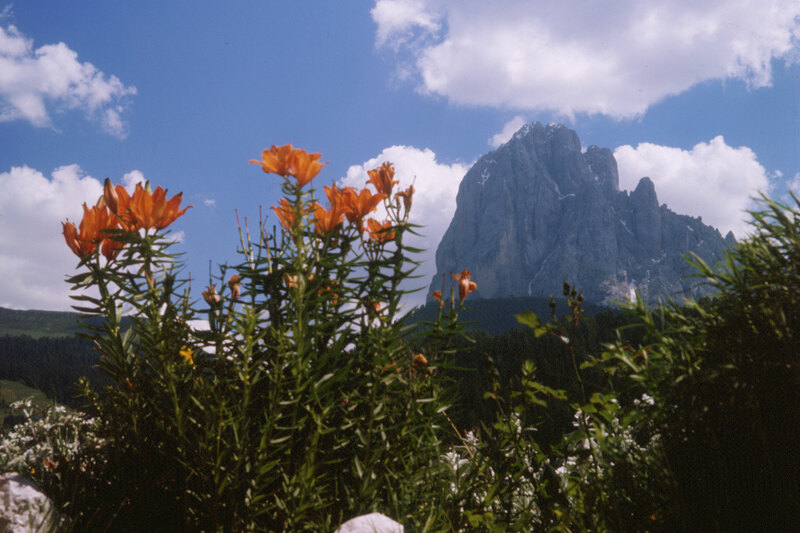 In order to understand the nature and the character of Val Gardena’s handcraft, it is indispensable to know this fascinating valley with its wide woods and its breathtaking dolomite rock formations. 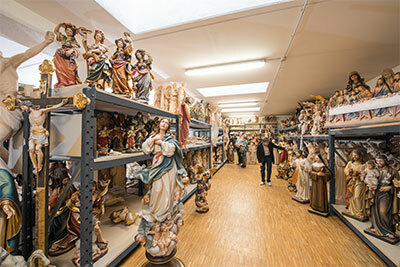 The valley has brought into being a prosperous cottage industry based on the production of wooden toys as well as of religious and secular art, which crossed Italy’s and Europe’s border and became world-renowned. The wood carving sector originated thanks to the creativity of the locals and the stringent necessity to find an occupation for the winter months in order to be able to compensate as well as possible the low fertility of the fields and the insufficient productivity of the farms. 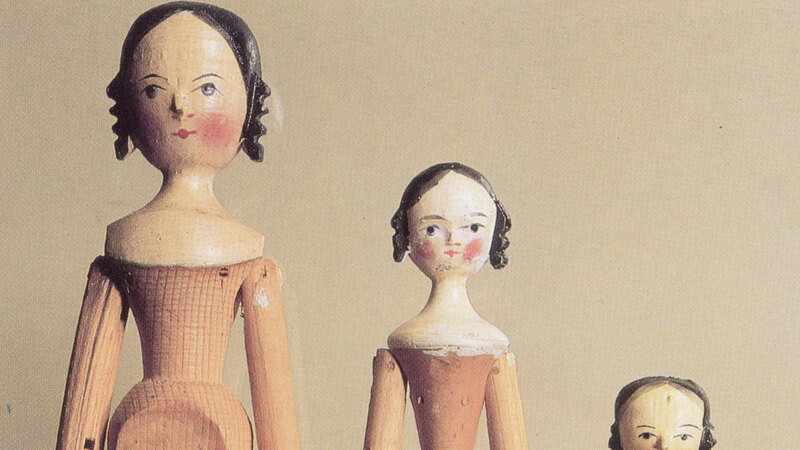 The manufacture of wooden figures started in the 17th century and evolved over time from a simple cottage industry to an industrial series production. However, during this process of development, the search for originality and highest quality of the handmade article was never neglected as this activity was passed on from one artisan generation to the next. 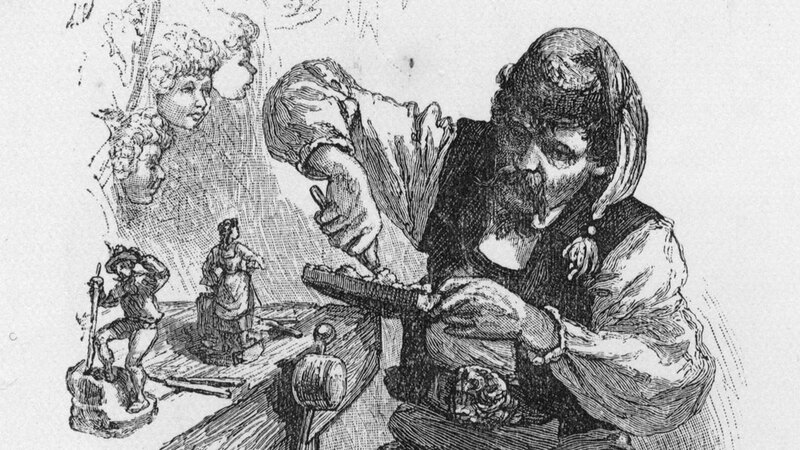 Traditional print showing (bottom left), a carver and a woman working with a bobbin. 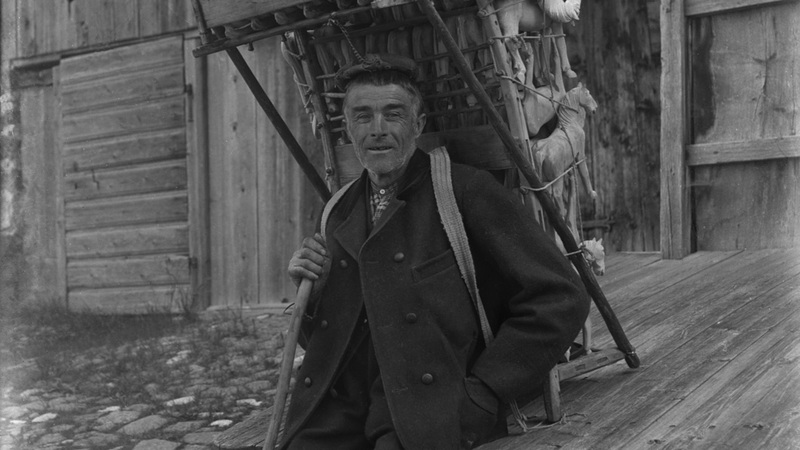 Until the 19th century, in some cases even until the 20th century, the surviving of Val Gardena’s people was based on the self-subsistence of the mountain farms. 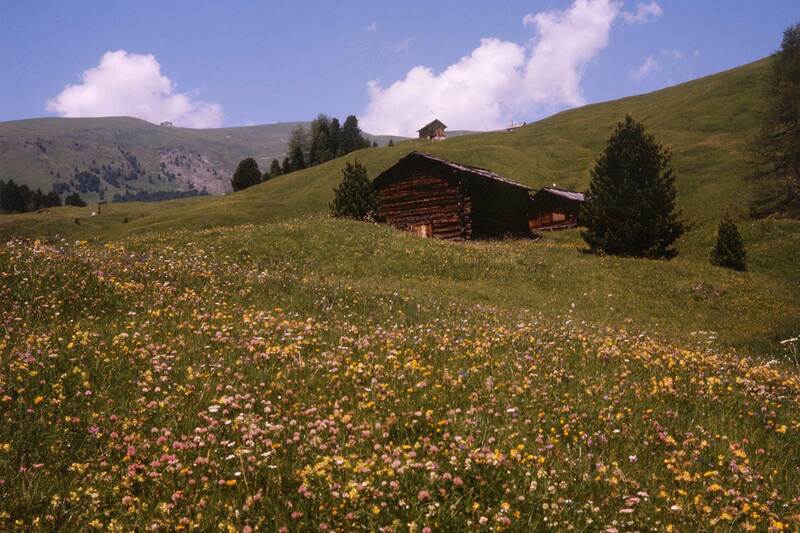 The soil in Val Garden is not especially fertile, as the valley is set at 1150 m in Ortisei and reaches 1700/1800 m in Selva Gardena. Moreover, the period in which the soil can be cultivated is relatively short, and the winters are very cold. In bad years, the farmers had to extract the potatoes and turnips even with a pick under the snow. Furthermore, the conditions in this valley are not suitable either for cereal or vine or other fruit cropping. 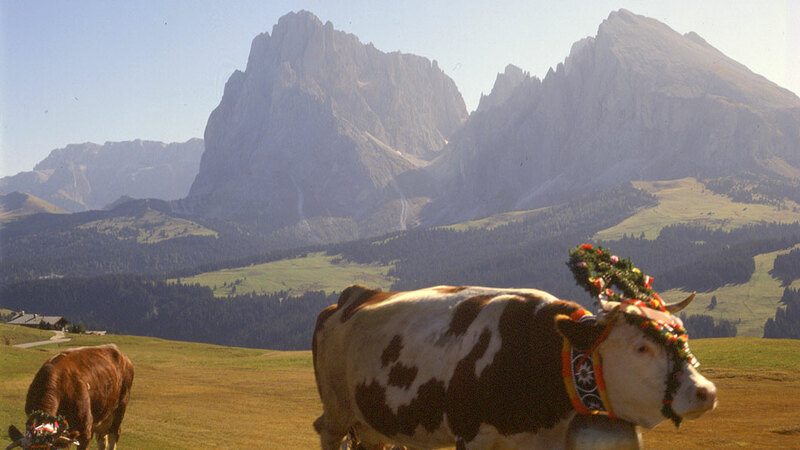 Therefore, until the middle of the 19th century, the livestock production was the main economic sector for the majority of the people of Val Gardena. This activity is typical in mountain valleys. Initially, the handcraft cottage industry represented only a very small part of the income of the families, and the work on the fields was not particularly fruitful, so that is was practised almost exclusively for the own requirements. Normally, people reared milk cows, oxen and sometimes also pigs. 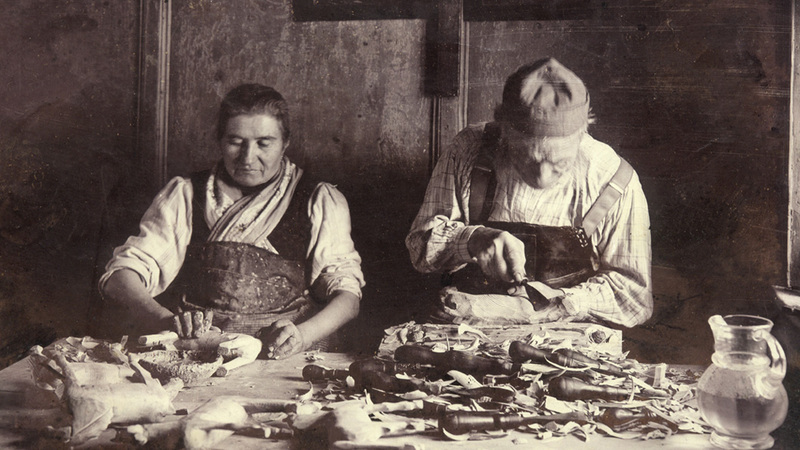 Although thanks to the handcraft the people of Val Gardena led a better life than the people of the neighbouring valleys, they were quite poor. The products manufactured by the farmers were sold or exchanged in order to buy food or tools. 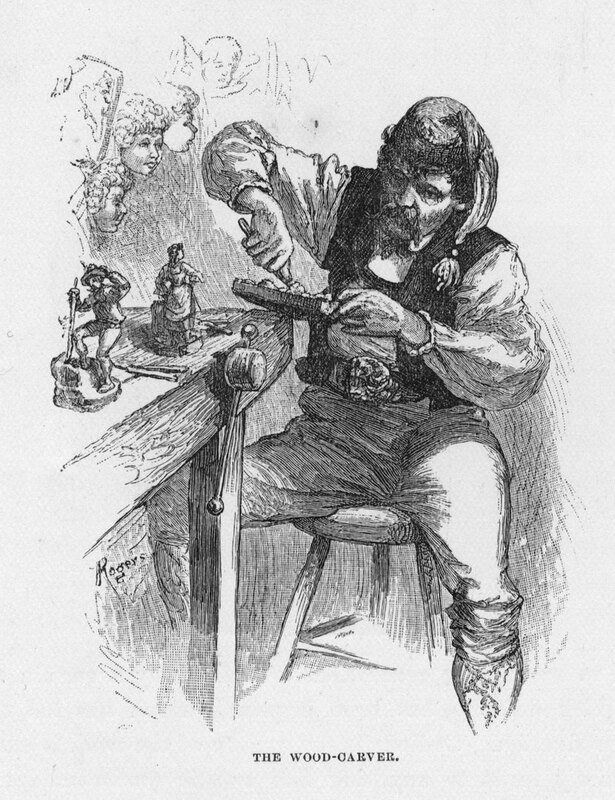 The shortage of cash, a typical situation for mountain villages, was a further cause for the necessity to fabricate handcraft products to be sold on the market. 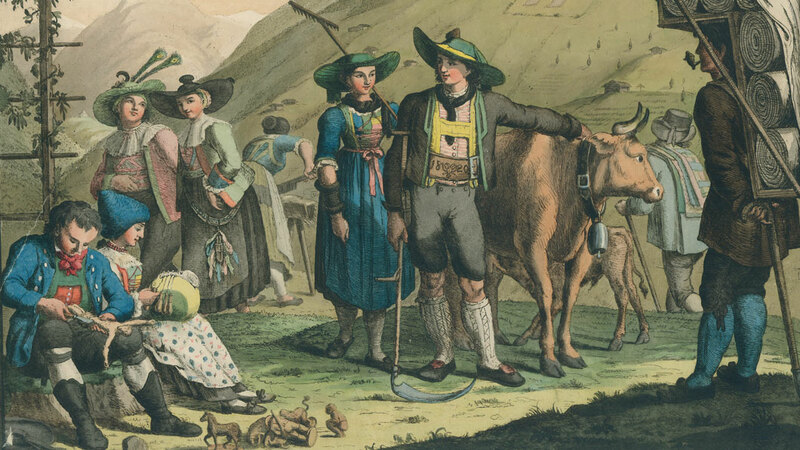 One of these products was the loden, a special type of felt used for making the typical clothes of the Bavarian-Tyrolean culture. 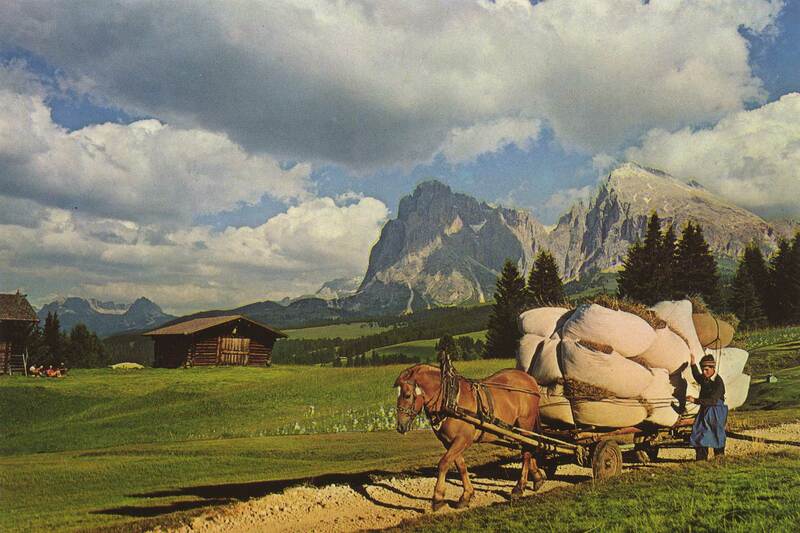 In the 16th century, the loden of Val Gardena was the most valuable and most diffused in Tyrol. Only in the 17th century, the women and the girls of the valley started with the lace-making, and the men with the wood carving. 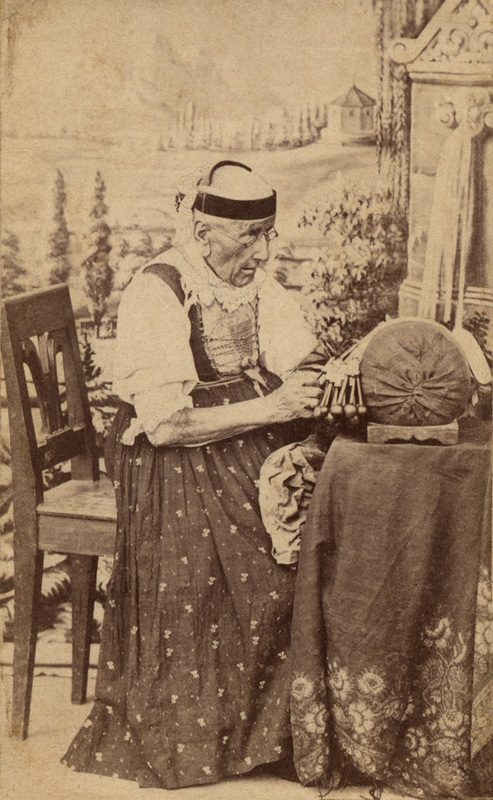 Until the beginning of the 19th century, lace-making was very important for the economy of the valley. The whole female population, from the 7-year-old girls to the 80-year-old women, practiced this profession. 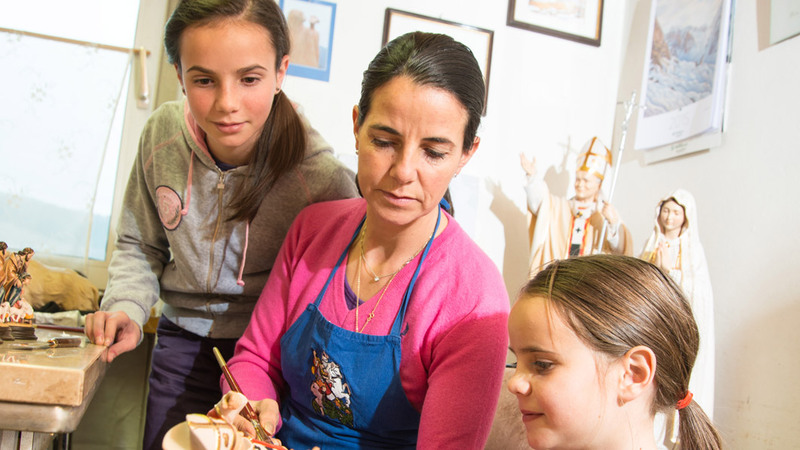 Their great skill in lace-making explains why the traditional costumes of Val Gardena are so richly decorated and elaborated down to the smallest detail. 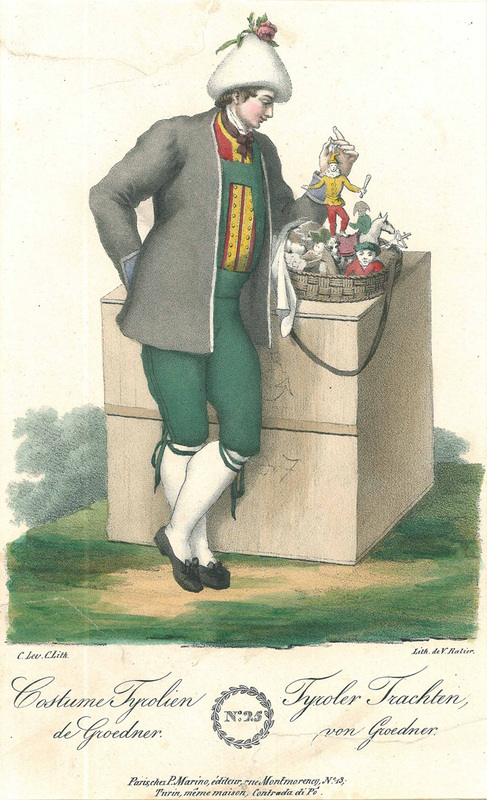 For two centuries, the production of laces represented a considerable additional income for the families. But already around 1830, only the older women continued practicing this art. The reasons for the decrease of this activity were the growing competition of more economic laces from other areas, the segregation from Tyrol in 1810 and the consequent difficulty in finding new markets, and above all the exponential growth of the export of handmade wood carvings. 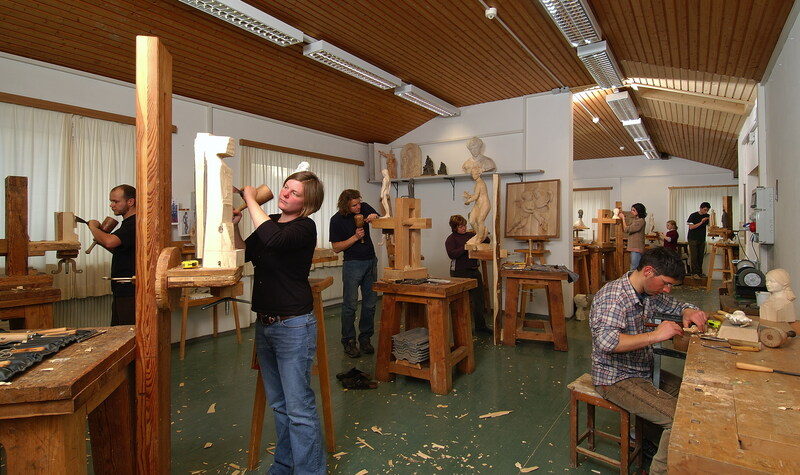 It is very difficult to exactly determine when the wood carving activity in Val Gardena started. It is a process which probably started at the beginning of the 17th century. The first documentation dates back to 1625 and refers to the sculptor Christian Trebinger, who, together with his brothers Bartolomeo, Domenico and Antonio, specialized in the manufacture of carved ornamental objects, picture frames as well as clock and console stands. This is how the famous Trebinger dynasty in Ortisei came into being. In S. Cristina it was Melchiorre Vinazer to mark the beginning of the Vinazer dynasty. 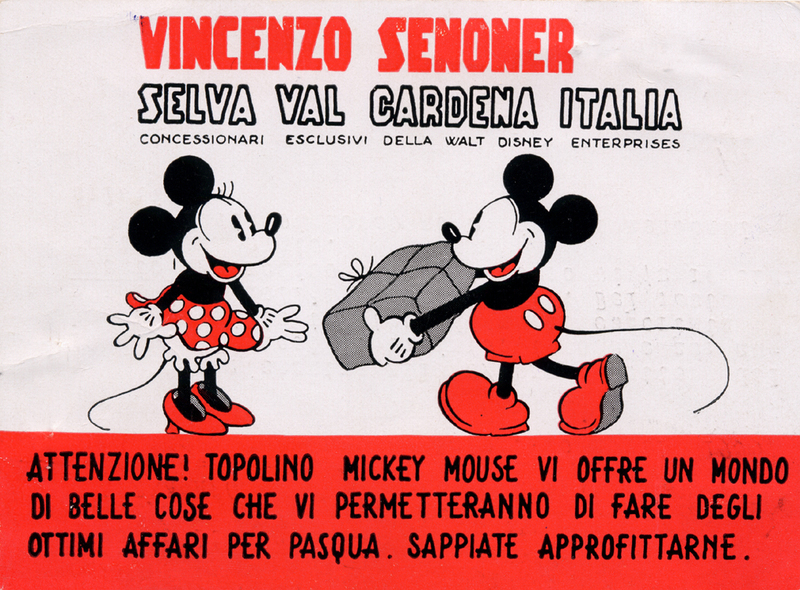 Melchiorre Vinazer was born on 11th September 1622. He learned sculpting under Master Rafael Barath near Bressanone and received his diploma in 1650. 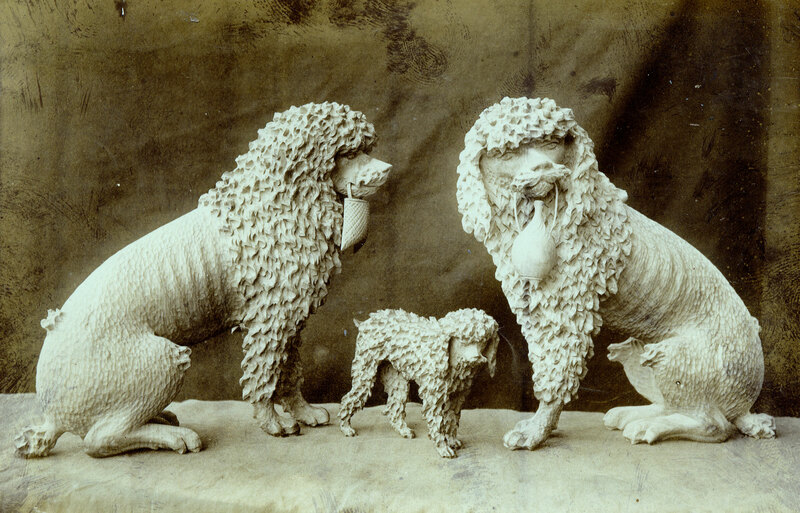 Six of Melchiorre’s children became sculptors; some of them perfected their technique in cities like Rome, Venice and Vienna. 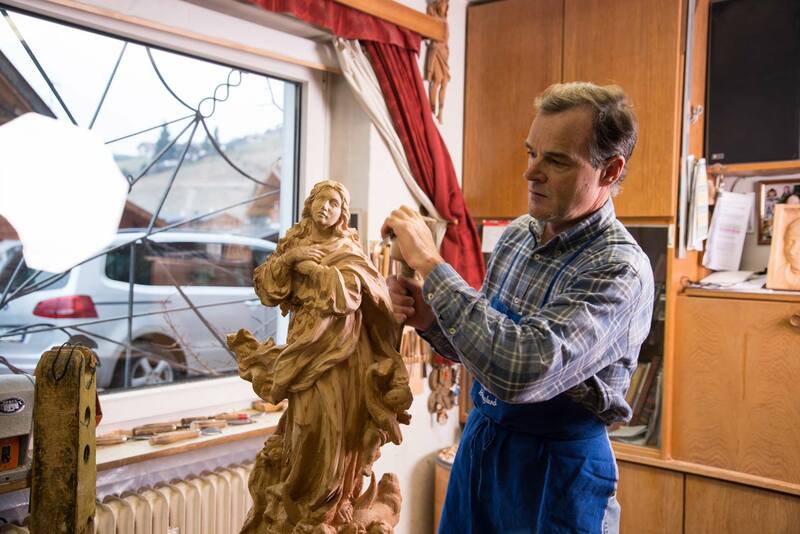 At this time, wood carving was not yet widely diffused in Val Gardena. Thus the coming up and the evolution of this traditional handcraft of the valley is the merit of these two families. 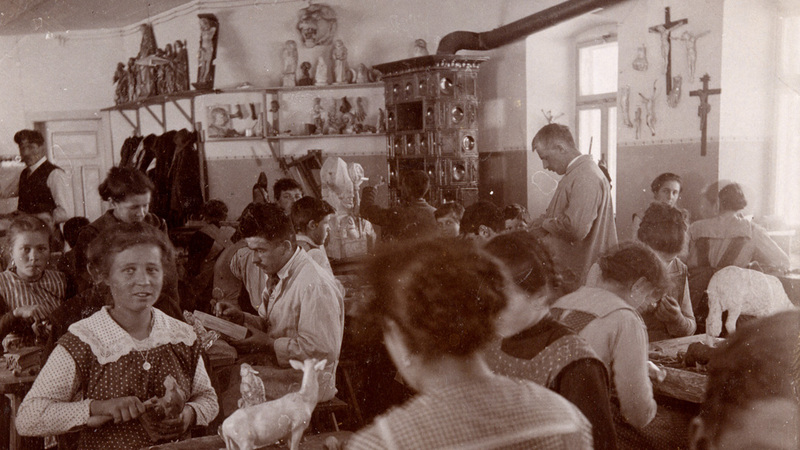 Their striving for perfection as well as their studies at the side of sculptor masters and at art academies were decisive to define the cultural identity of Val Gardena’s handcraft. In the course of years the number of sculptors rose, and in the second half of the 17th century there were already 50 sculptors in the valley. They created real masterpieces, which were above all intended for the churches. 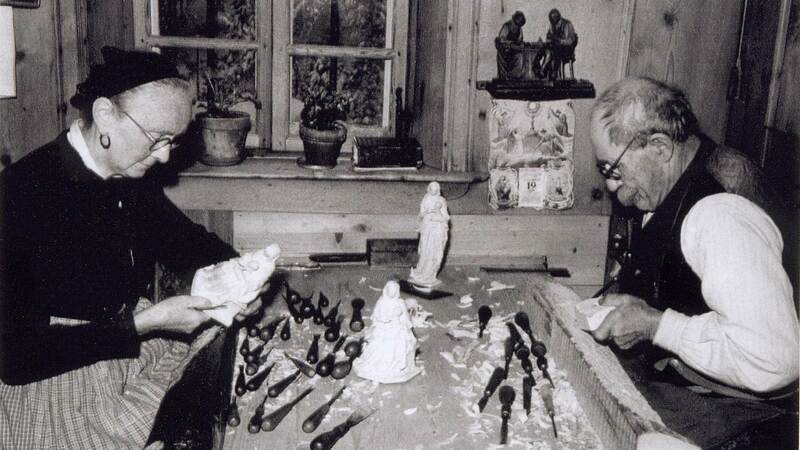 As the inhabitants of the valley realized that wood carving could become an important source of income, many farmer families decided to manufacture wooden figures in series, both religious and sacral ones. 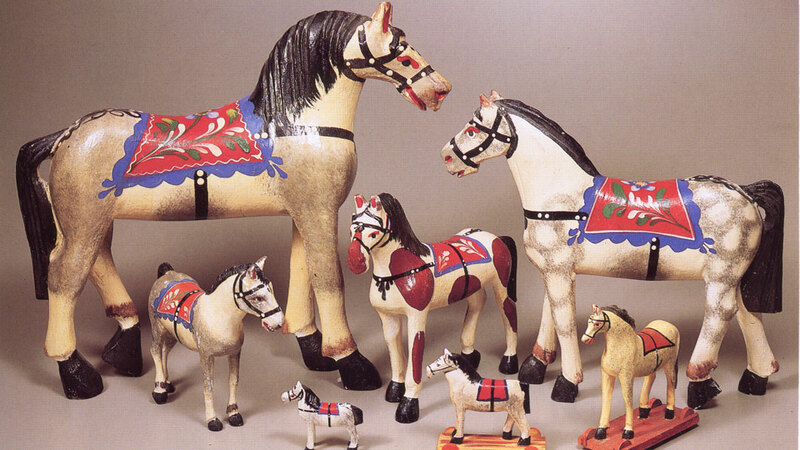 As they did not possess a title of master craftsman, they specialized in the manufacture of toys or crib figurines. But then the sale of art works on order stalled, while the export of wooden figures and toys spread also over Tyrol’s boundaries. 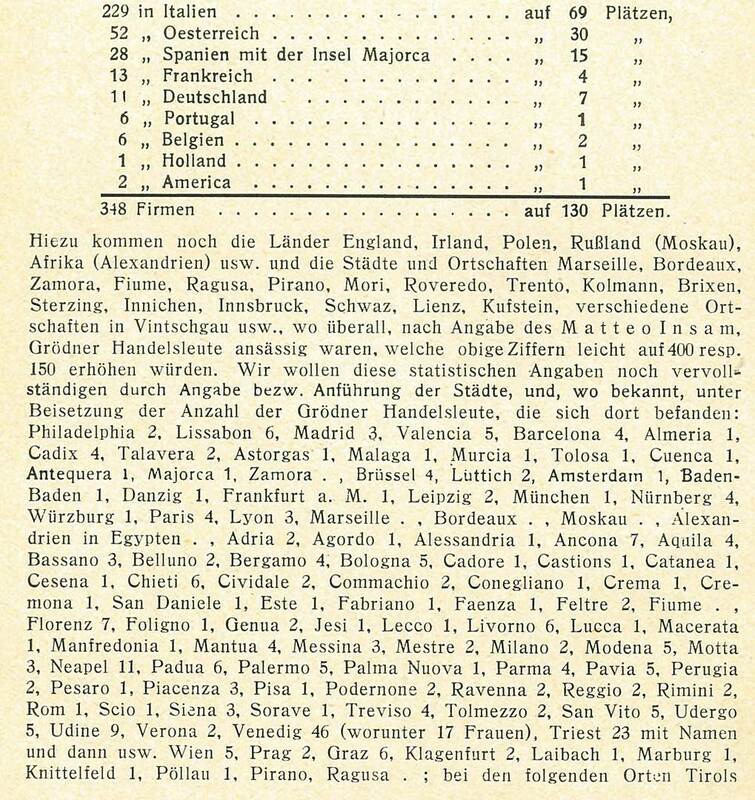 In 1680, the exports went to Venice, Genoa, Lisbon, Vienna, Graz, Stuttgart, Düsseldorf, Cologne, Frankfurt and in other large European cities. 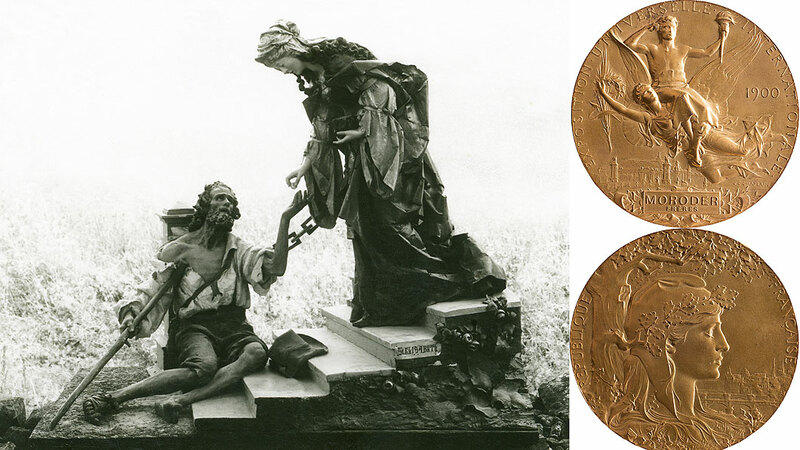 In 1788 there was a short crisis triggered by the Austrian government: a decree of Innsbruck imposed the reduction of the number of sculptors from 300 to 150, in order to protect the woods on Mount Rasciesa which had been randomly deforested in the previous years. The people of Val Gardena were surprised and indignant. 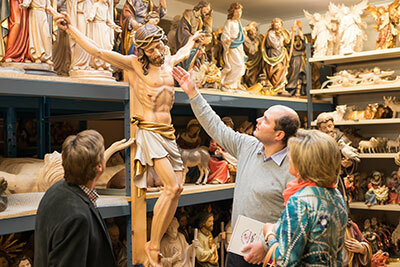 The municipality Ortisei reacted to it with the proposal, that the sculptors would pay the wood they need for their work themselves and that the decree should be withdrawn. The government supported the idea and withdraw the decree. 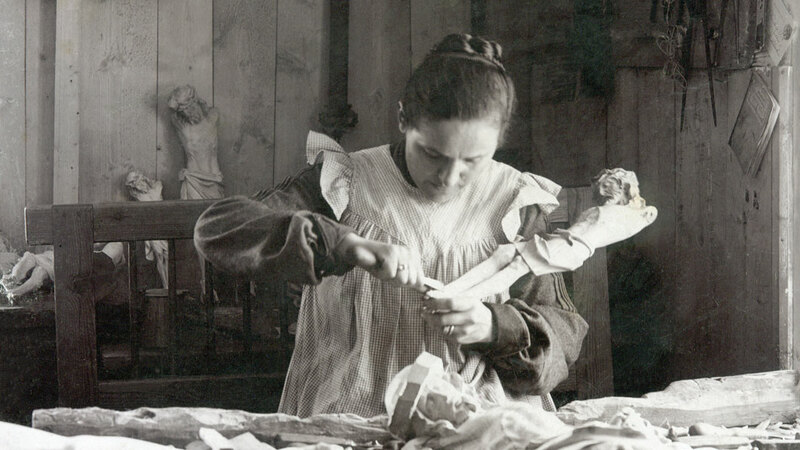 At the end of the 18th century, the manufacture of wooden toys, called chiena in Ladin, was the most important economic activity of the area. 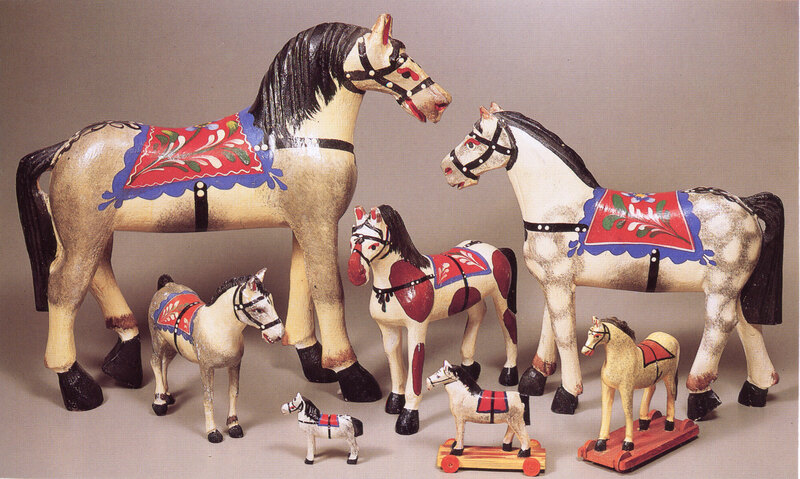 Unfortunately, there are just a few documents of this time to help understand how the idea to produce toys was born. 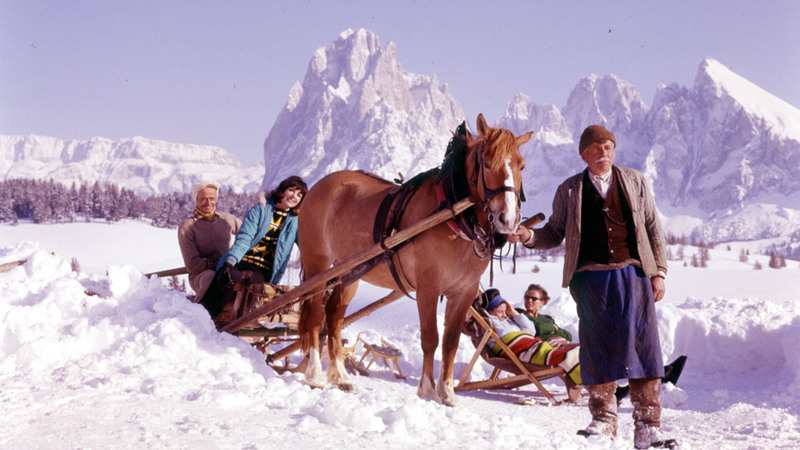 A possible answer could be that the people of Val Gardena had the possibility to get to know the toys manufactured in the neighbouring regions through the continuous migrations. 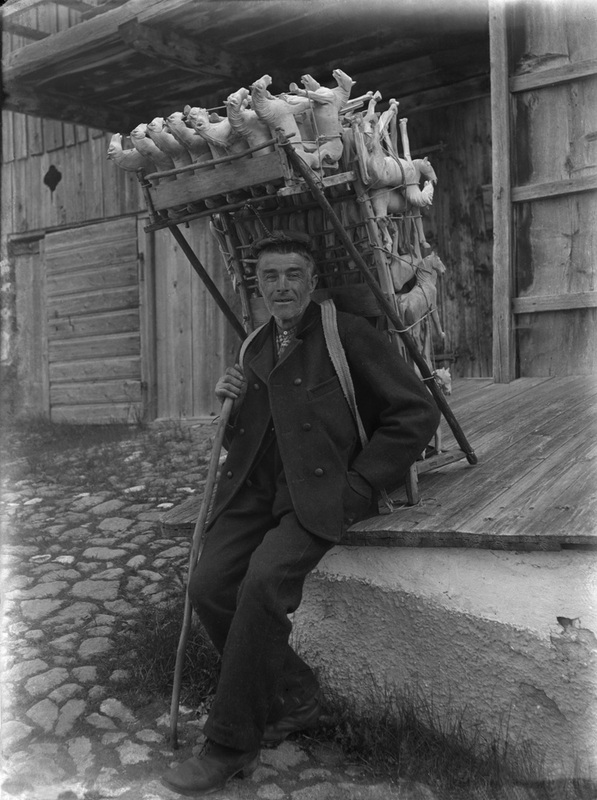 In this period a very important figure for the sale of Val Gardena’s products was born: the peddler. These merchants didn’t have a permanent seat but roamed from market to market. 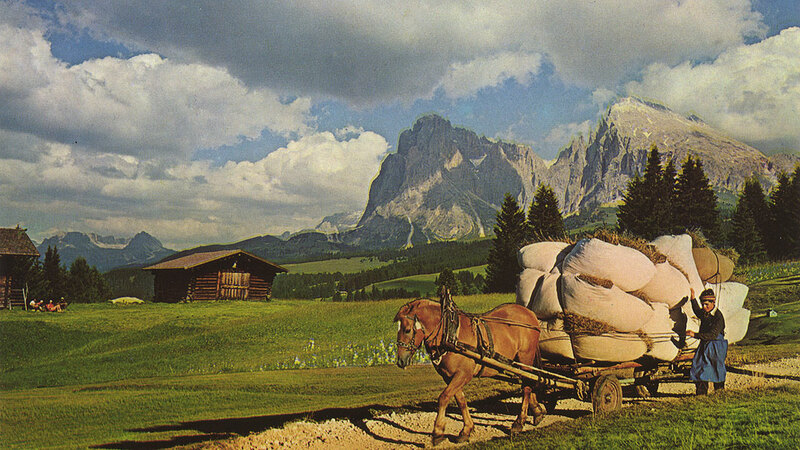 They left Val Gardena in spring with a basket full of wooden toys on their back and returned only in autumn. 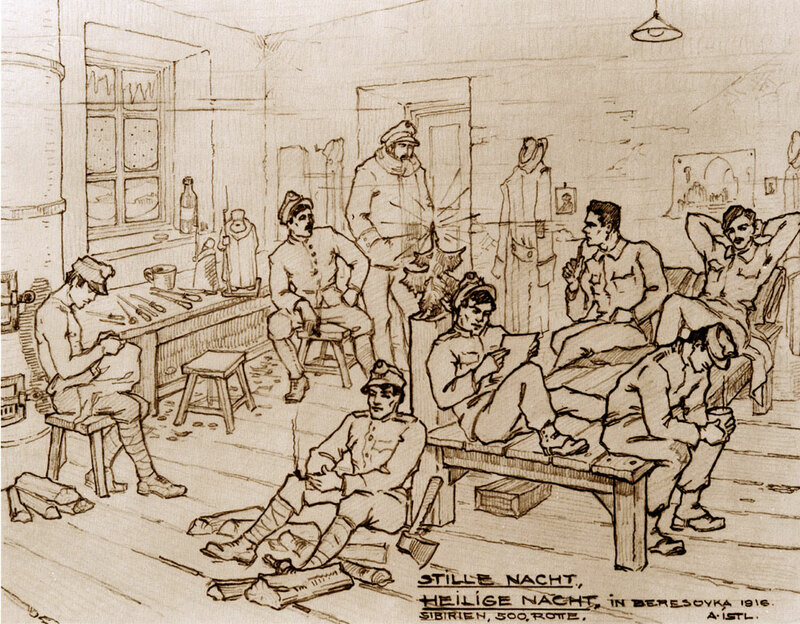 In winter they retreated in their houses in order to manufacture new merchandise for the upcoming spring. Over time, their journeys became longer. Thus the merchandise a single peddler could carry wasn’t sufficient anymore. Those who were able to put some money aside settled abroad from where they could sell more easily the articles they bought in the valley. 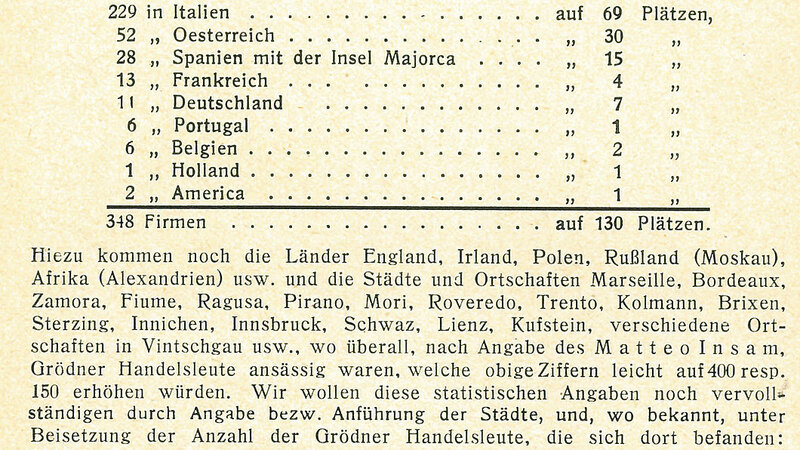 The majority established themselves in large German, Austrian, Italian, Spanish and Portuguese cities. 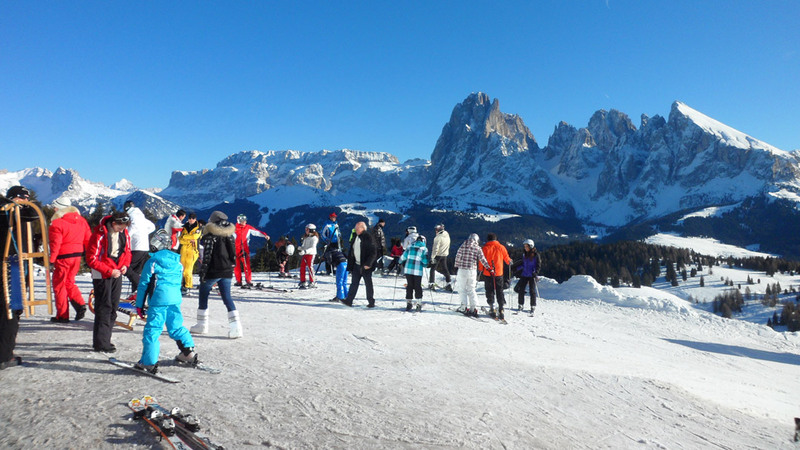 The close economic connections with these countries and the ability of the people of Val Gardena to learn fast new languages helped to pave their way. Some of these merchants didn’t limit themselves to selling handmade products of Val Gardena but worked also as agent, antique dealer and money changer, whereat they took the maximum advantage of their trading skills. 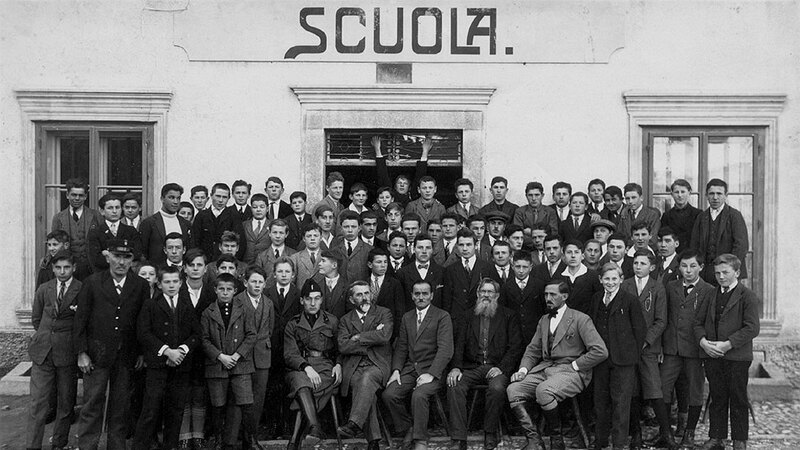 As the emigrated merchants of Val Gardena needed back staff, the families of the valley sent their fourteen- to sixteen-year-old children to the relatives abroad in order to enable them to pursuit a commercial education. 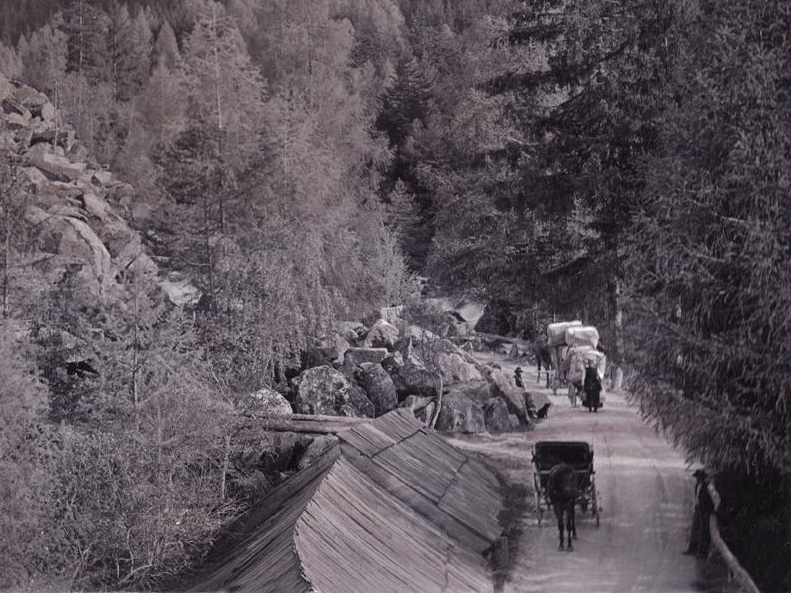 It is estimated that in 1800 the peddlers settled abroad had employed 2/3 of the valley’s population, that is to say approximately 1200 people. Many of them achieved great economic prosperity such as Melchiorre Ortner, who lived in Cuenca (Spain) and financed about 300 men during the first Spanish colonial war. 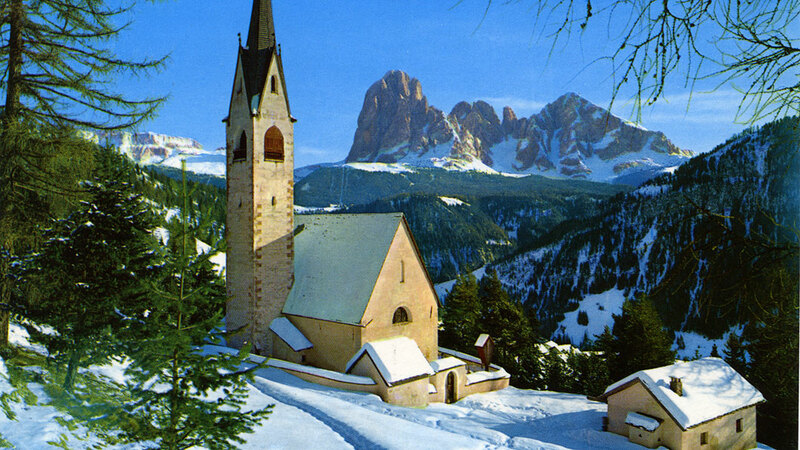 But Val Gardena couldn’t really benefit from it, except in case of bereavement, when the relatives left back in the valley received the heritage. 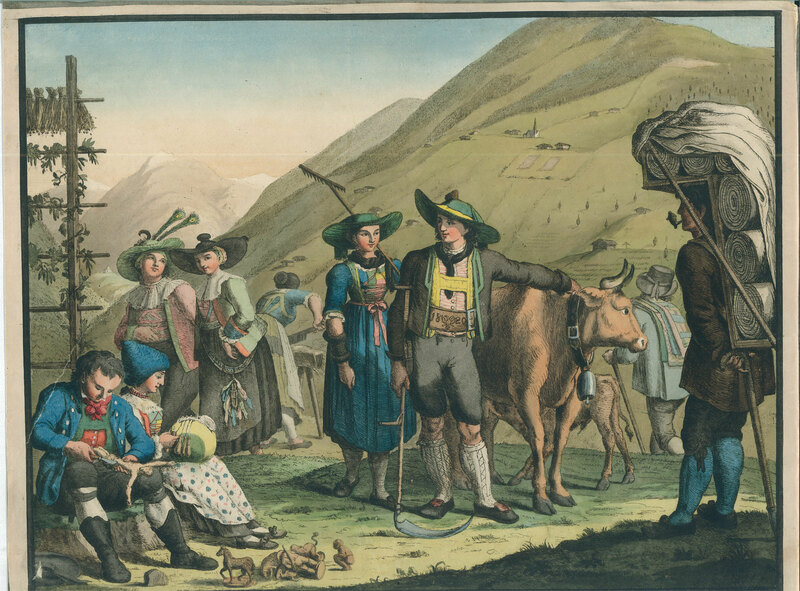 In France, which could have become one of the most profit-yielding markets, just a few merchants of Val Gardena settled, as many of them had to give up their job during the French Revolution. 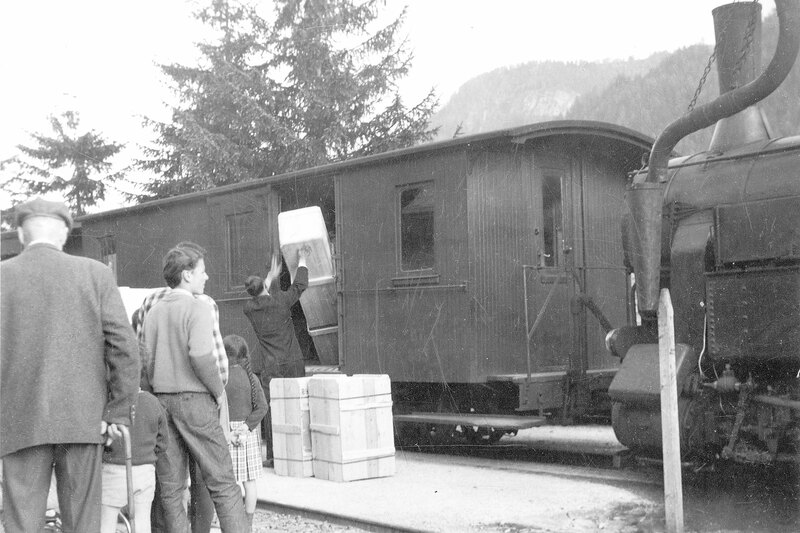 The migration movement in the search of fortune and success outside Val Gardena ended finally in the first half of the 19th century, mainly because of the changes of the trading conditions, from the expansion of the routes to new transport possibilities, and the introduction of the mandatory military service which prohibited the young men to leave the valley for a longer period. 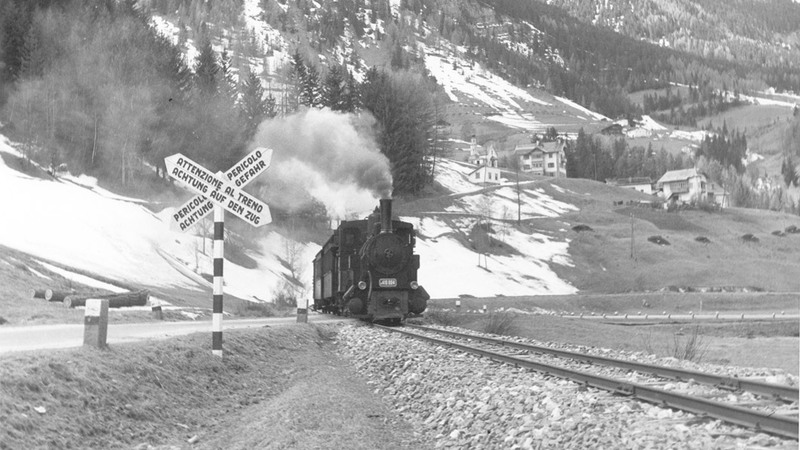 Other reasons were the construction of the street which connected the valley with the Brenner road in 1856, and the construction of the Val Gardena train in 1915. 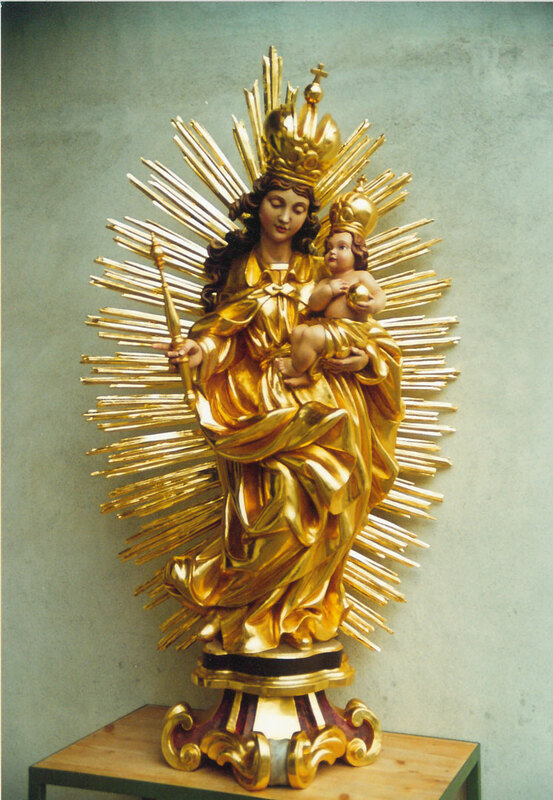 The painting and the gilding industry of the carved objects emerged gradually between the 17th and the 18th century. 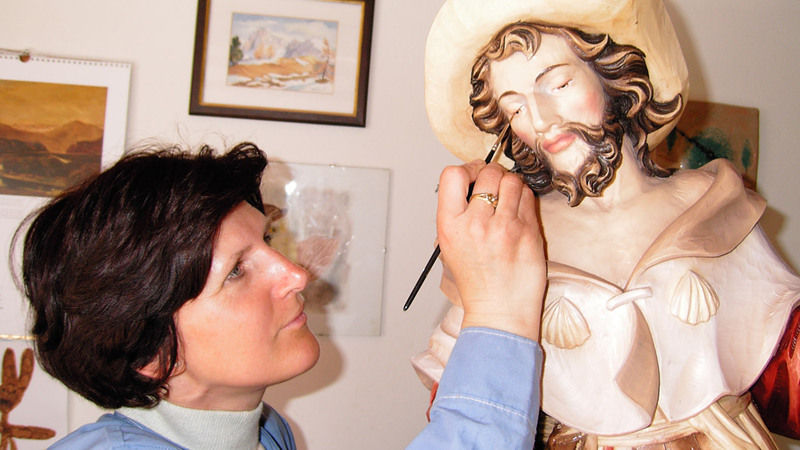 Many figures were painted by the sculptors themselves, but the big statues and the altars were painted and completed in Castelrotto, Funes, Bolzano or Bressanone. 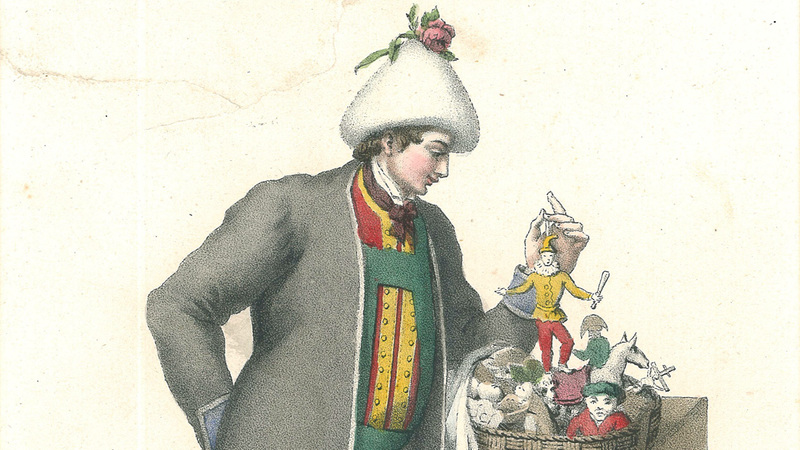 The more delicate toys were even dispatched to Bavaria. 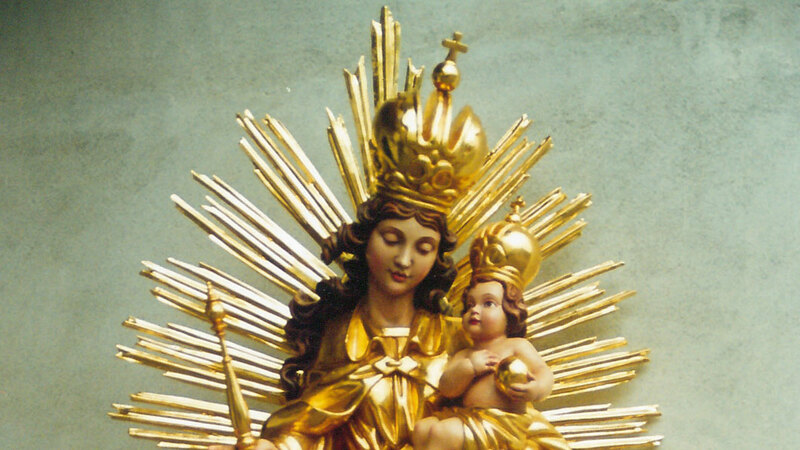 Only at the end of the 18th century, some families of the valley decided to dedicate themselves to the painting and the gilding of the wooden figures. 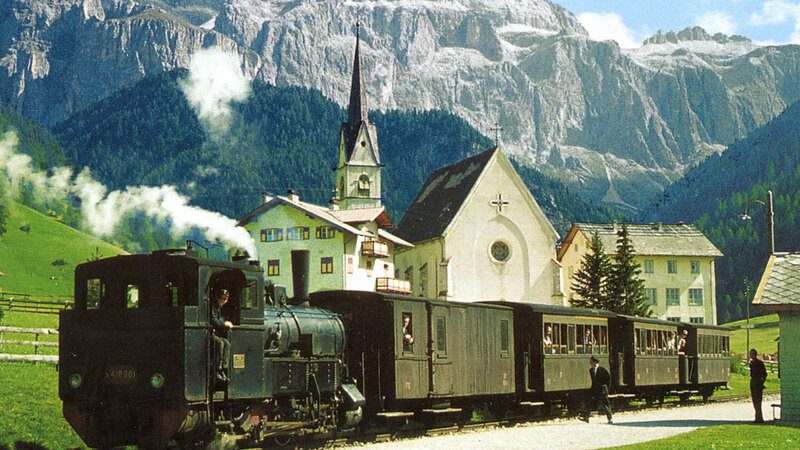 Thenceforth Val Gardena’s industry has reached the high perfection and originality which still characterizes it today. In order to expedite the production to the maximum and to increase the profit, the painting process was divided into various phases: at first the big surfaces were painted and then one after the other all the details – the eyes, the hair, the lips, the buttons, the shoes etc. The simplest tasks were performed by the children. Between the various phases, the sculptures were put on the bench around the oven for drying. Finally, so as to avoid the bleaching of the colours on the carvings, a kind of varnish was put on them, which was produced by blending pure alcohol with fir and larch resin. This process was quite dangerous as it was necessary to heat the alcohol, and the risk that the house caught fire was not to be underestimated. 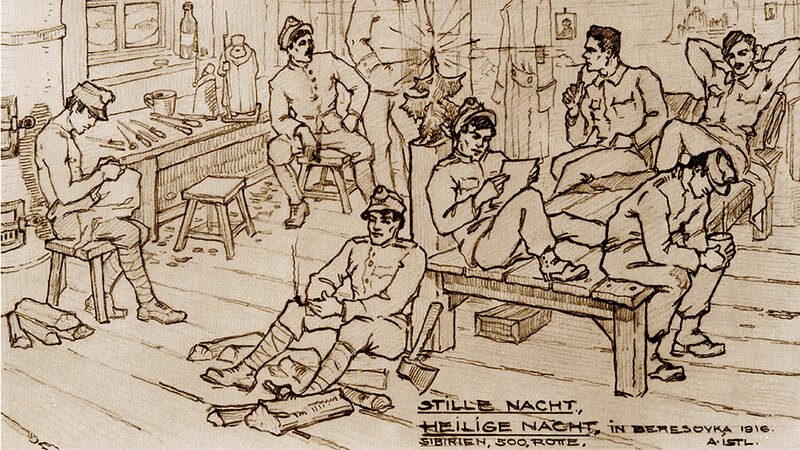 The first gilders in Ortisei were Joachim Unterplatzer, Thaddeo Oberbacher and Josef Großrubatscher. 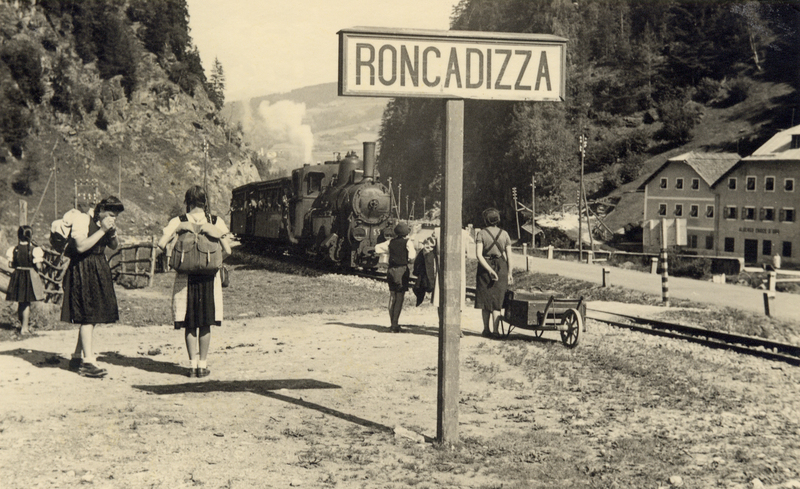 The road between Ortisei and Ponte Gardena,, where goods were loaded onto trains to be exported all over the world, was built at the initiative of shopkeeper J. 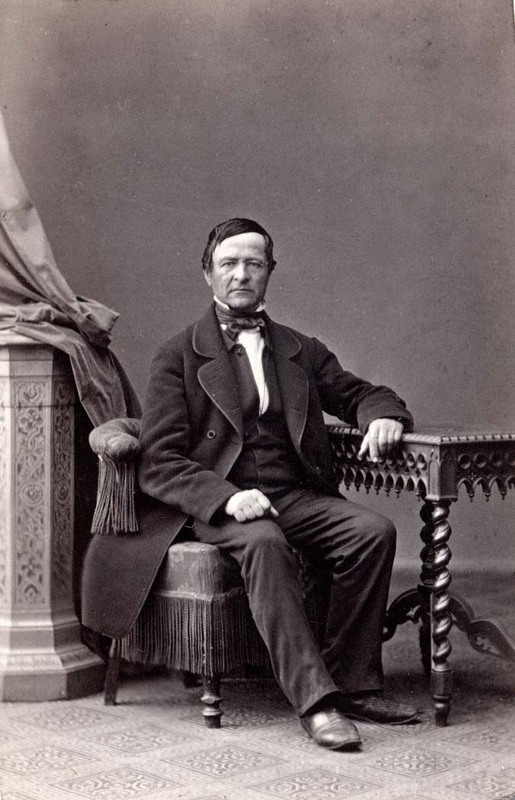 B. Purger and inaugurated in 1856. It gave a great boost to economic development in the valley. 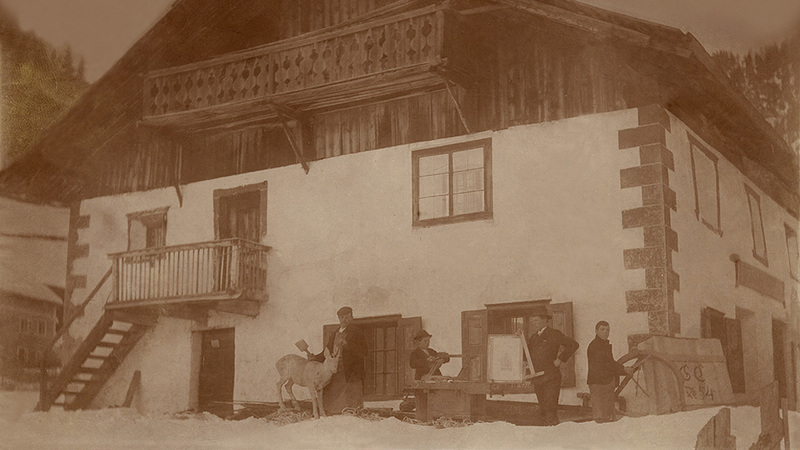 In the middle of the 19th century, the production model of the putting-out system, which had already reached excellent results in the German and Austrian cities, came to Val Gardena. Within this system, the new social class of the wholesalers commissioned orders to the artisans and then sold the products above all abroad. 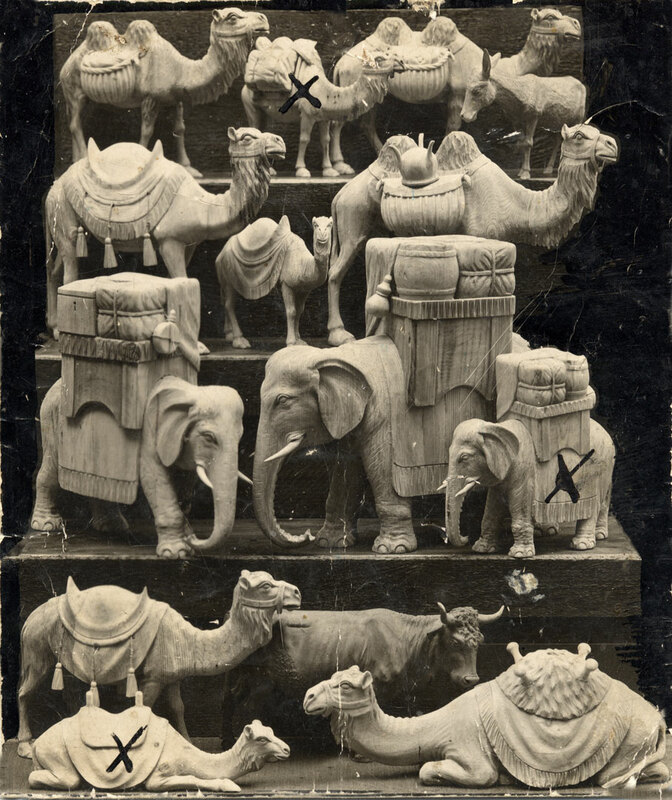 Thus in a short time the majority of the wooden figures passed to the property of these merchants, who simplified the sales logistics and at the same time provided the homeworker with the raw materials saving them a lot of time. In other words, the workers kept the responsibility for the production with all its risks, but it was the wholesaler who was in charge of the promotion of the articles and who had to find sellers. 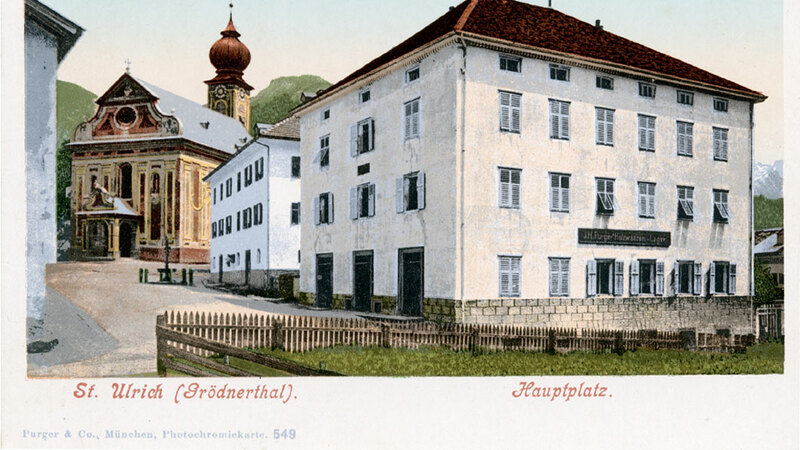 The first wholesalers were the sacristan Johann Dominik Moroder and the saddler Josef Purger, both from Ortisei. Soon they were joined by other wholesalers from Ortisei, S. Cristina and Selva Gardena. Initially, the wholesalers were not given much importance as they received only a small premium for their shipping service and as they worked above all as intermediary for relatives living abroad. 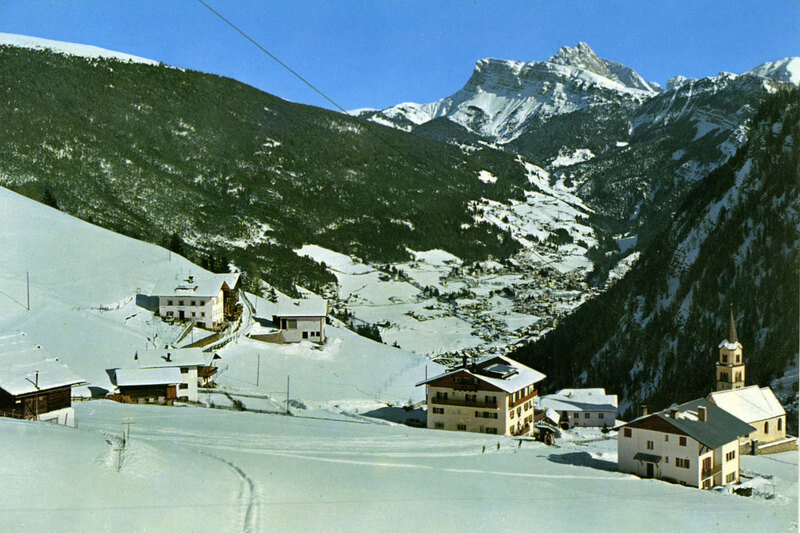 Soon the merchants of Val Gardena realized that in order to increase the exports better connections with the valley were necessary. 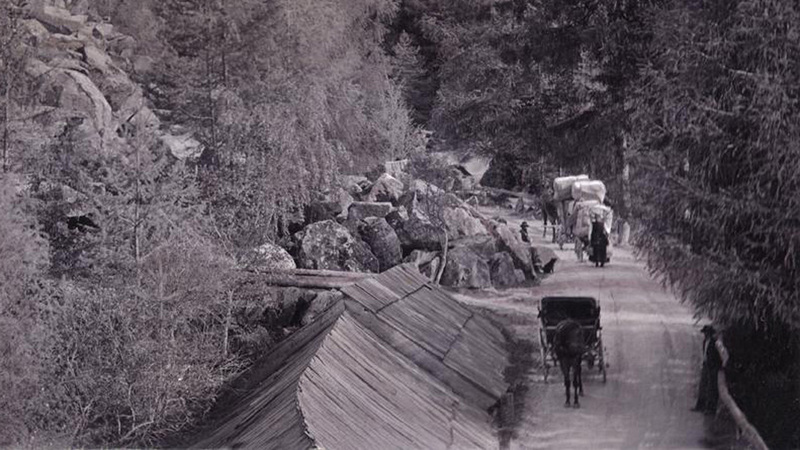 The streets leading to the neighbouring countries were steep and narrow, and a horse could only transport 100 kg of merchandise. 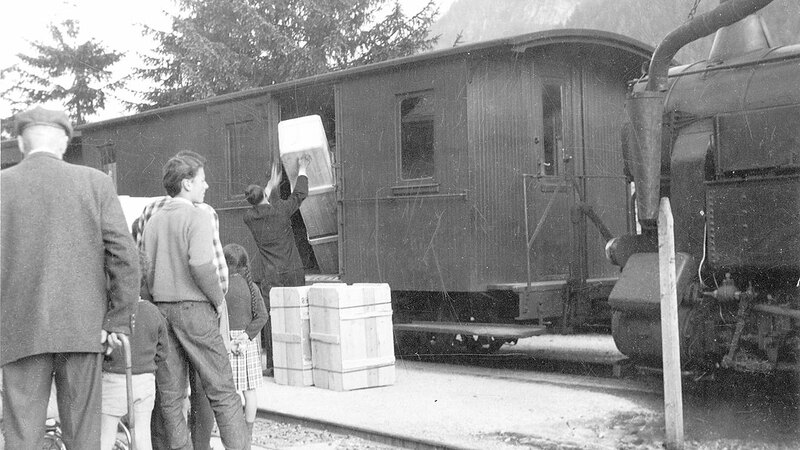 These were the conditions for the transport of food and handcraft products until the middle of the 19th century. The decisive turn took place in 1856 as under the direction of Johann Baptist Purger the road which connected Ponte Gardena with Ortisei and later on also with Plan was built. 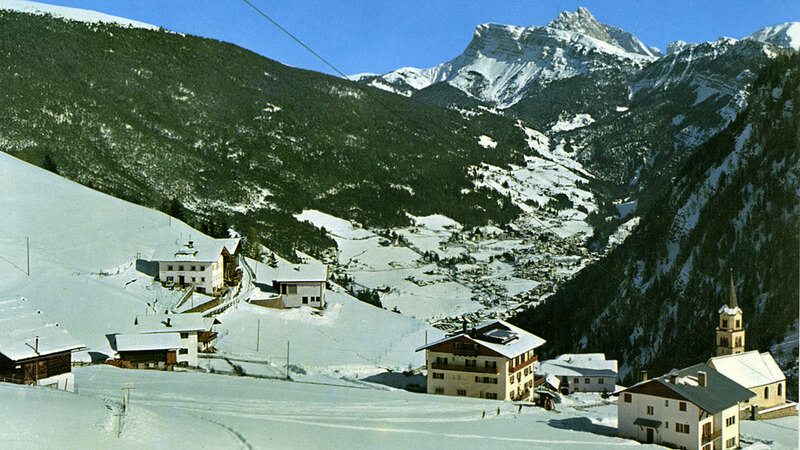 The whole population of Val Gardena was aware of this private initiative and approved it unconditionally. The debts caused by this construction were made square within 26 years thanks to the introduction of a toll, which proved beneficial also for the maintenance of the road. It has to be mentioned that the construction of a road enabling the communication between a mountain valley and its neighbouring localities and countries was something really unusual for that time. 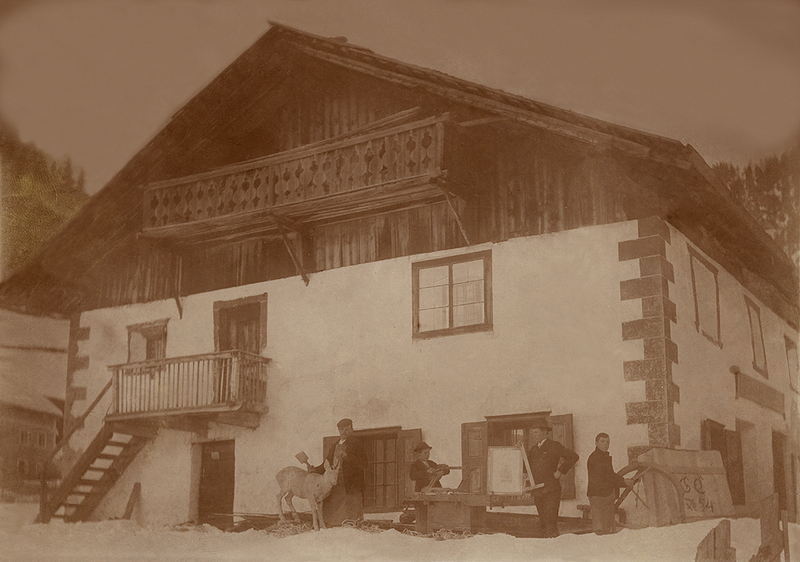 But thanks to the wholesaler Johann Baptist Purger, Val Gardena was connected with the outside world decades before the other mountain valleys. While the financial situation of the wholesalers was often very good, the home workers didn’t enjoy such a wealth. 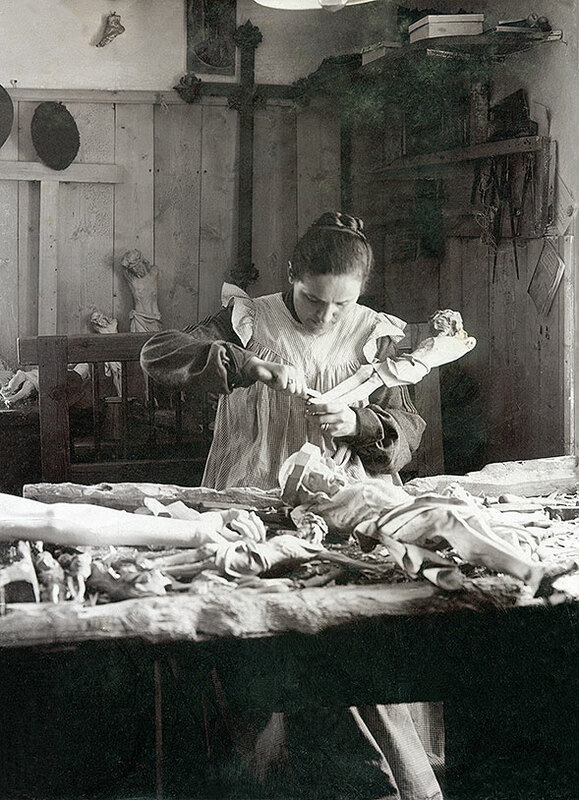 The wood carvers were underpaid and had to work from dawn till dusk in order to maintain their families. Those were often very large and helped with the orders according to their capabilities. Even the 6-years-old children helped with the work. There were families who interrupted the wood carving work only in the field work and the hay making periods. 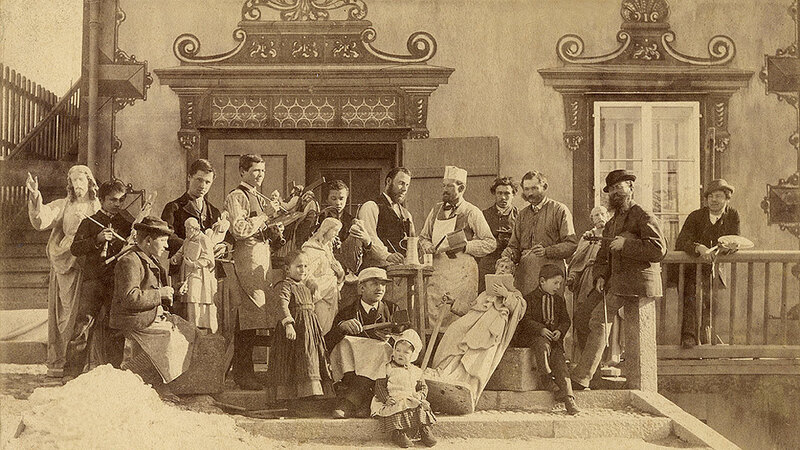 During winter, all family members – old and young, men and women – spent the whole day in the stua (Ladin for “living room”), at the penic (Ladin for “carving table”) and worked the wood with their scarpieis (Ladin for “wood carving knives”). 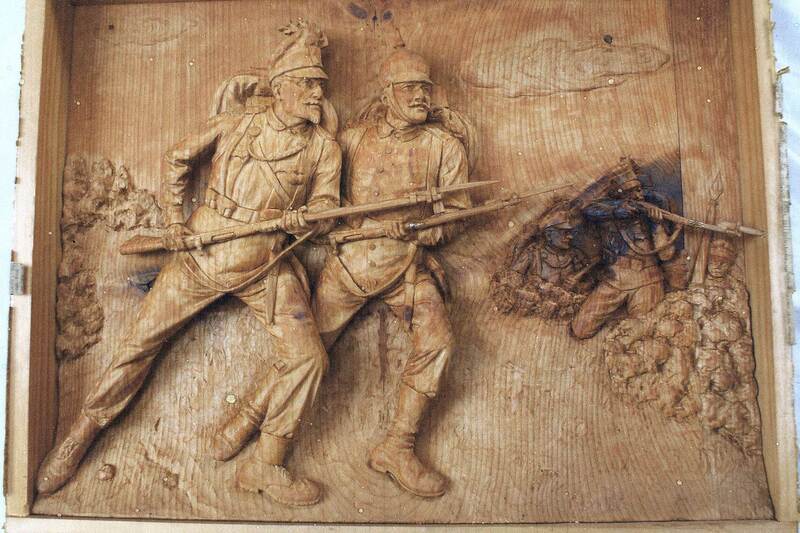 The wood carvers depended completely on their commissioners and had little power as for the contractual negotiations. Moreover, even if they were many, they didn’t have a corporation which stood up for their rights. 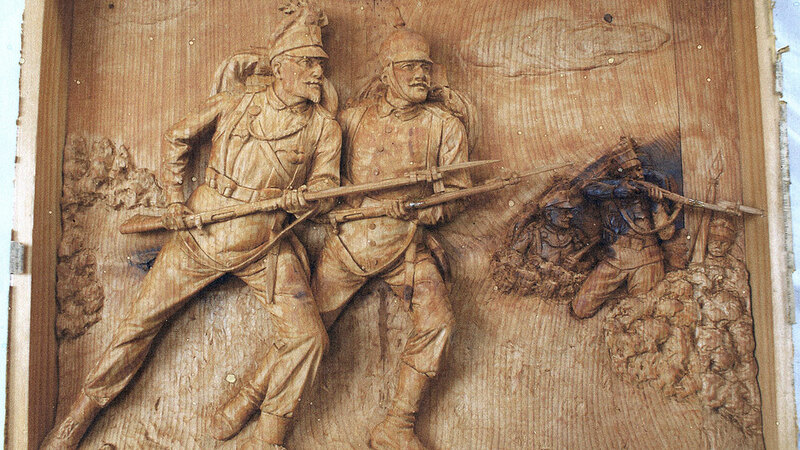 Until the middle of the 19th century, the learning of the wood carving craft was passed on from generation to generation without any external help. 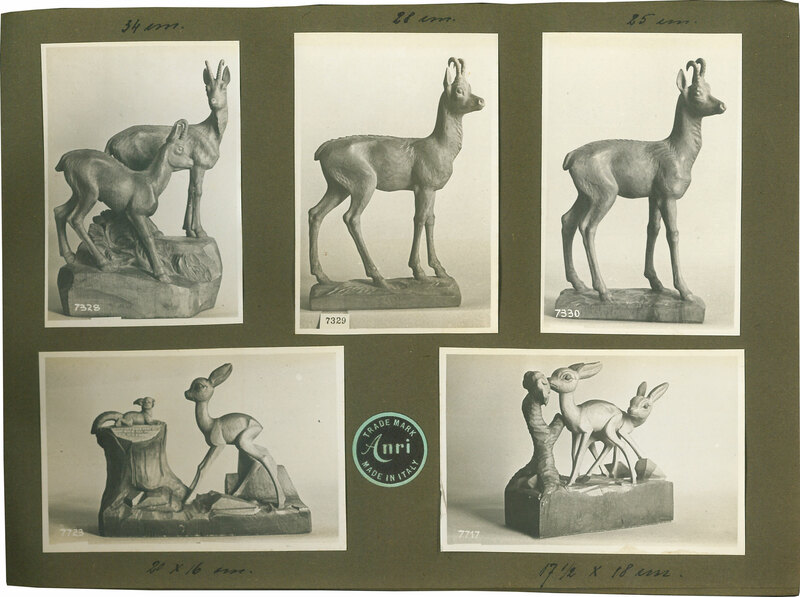 The idea to carve various models came exclusively from the wholesalers, who could best interpret the demand on the market. But neither them nor the sculptors considered the necessity to manufacture with a more precise and refined technique. 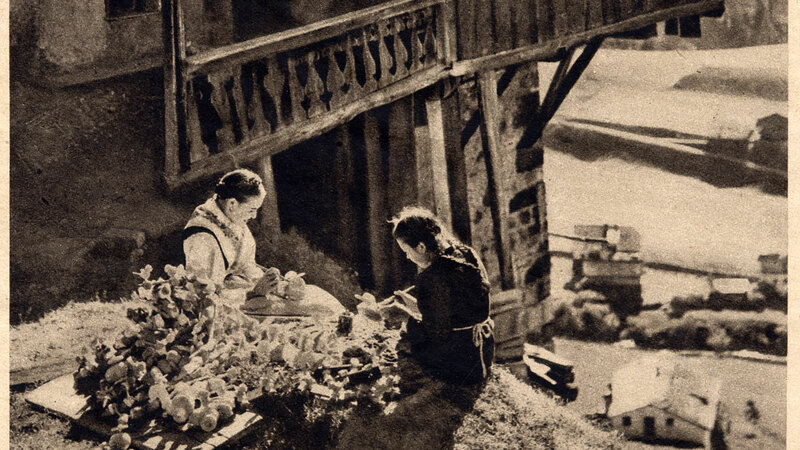 The production came mainly from the cottage industry, which was subordinated to the main economic sector of agriculture. 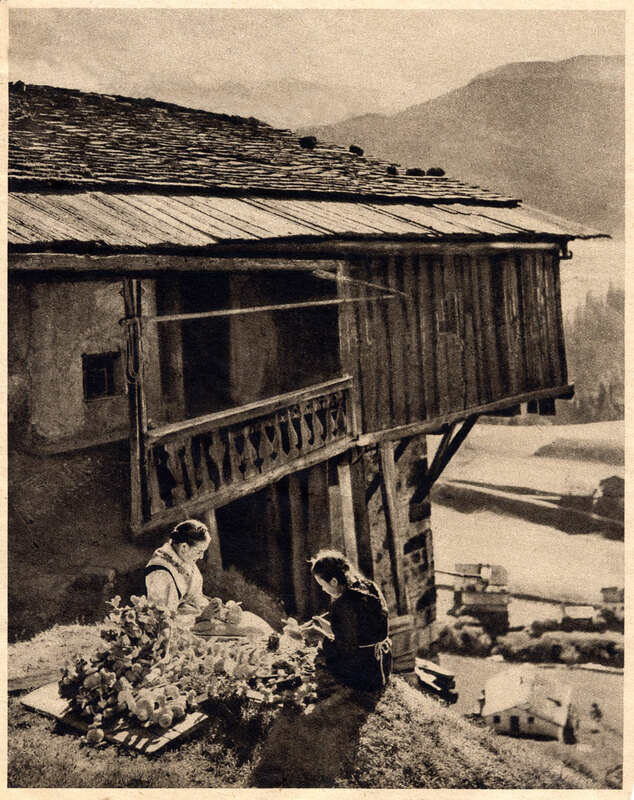 The products of Val Gardena sold well, but the profit of the home workers was often beneath the dignity of man and their dependence on the wholesalers was strong. The latter had to make sure that the prices remained as low as possible as the merchandise was exported in more and more remote countries – from Russia to America –, what brought an increase of the transportation costs with it. 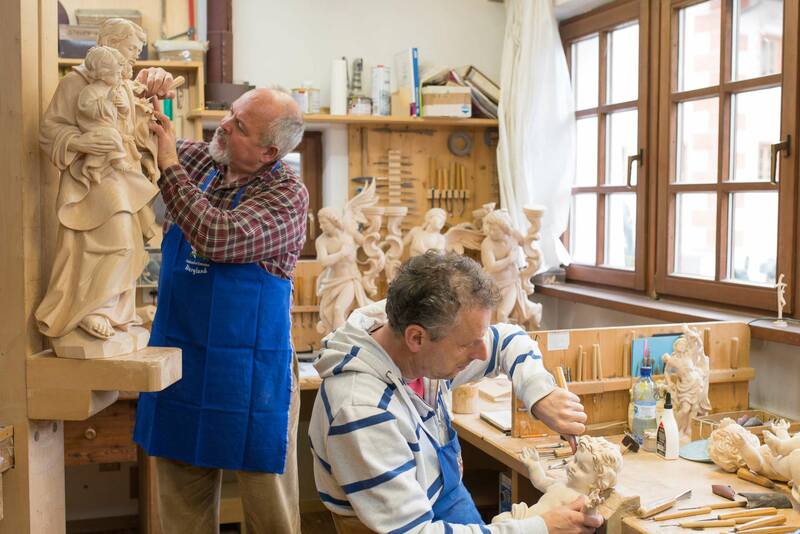 The situation of Val Gardena’s handcraft experienced a considerable improvement thanks to the establishment of a sculpture school following the far-sighted idea of Rudolf Eitelberger. This development didn’t please either the wholesalers or the municipal council, which was presided by the former, as they feared a reduction of their income through the construction of such school. 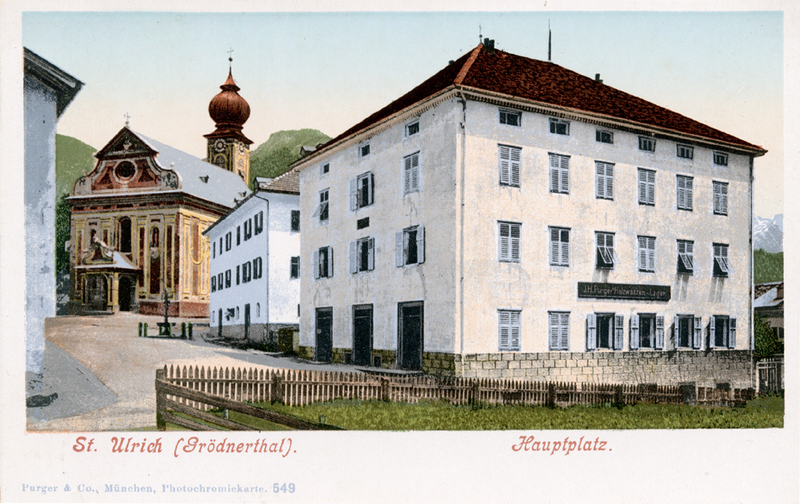 This problem was solved by the Austrian government, who showed an interest in this project and thus subsidised the foundation of a vocational school by Ferdinand Demetz in Ortisei in 1872. Afterwards, the school passed into private hands. It brought great technical and artistic improvement with it and indirectly also a positive development of the sculptors’ economic situation. Over the course of a few years, various new laboratories for sculptors and carpenters were built, and also the number of painters increased. 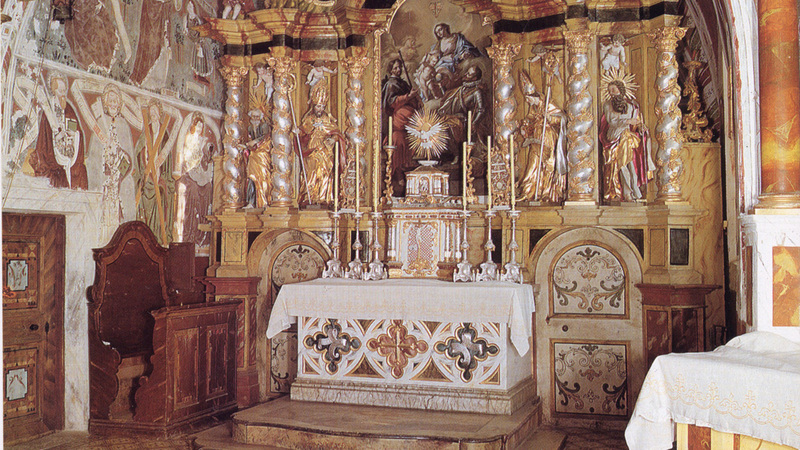 The manufacture of altars, which in the first half of the 19th century was neglected, was reassumed, and some wood carvers specialized in the furnishing of entire churches. 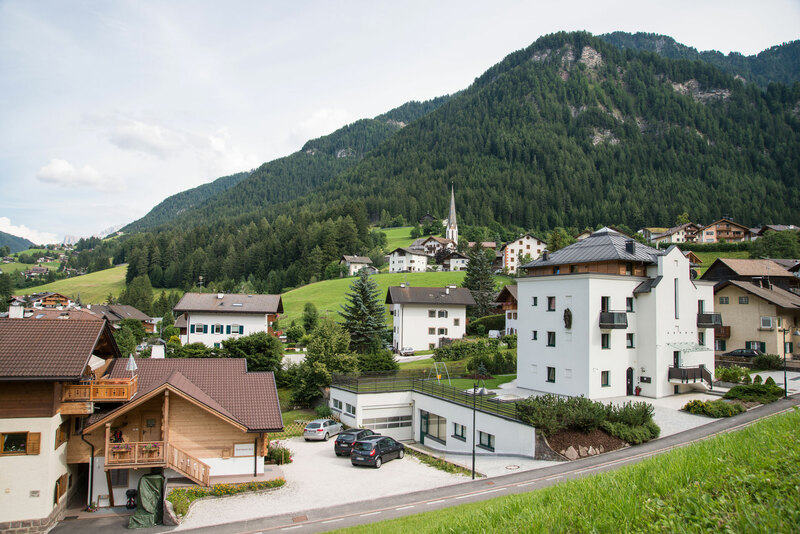 As to the volume and the profit, Val Gardena outdistanced the other localities which traditionally dedicated themselves to wood carving such as Oberammergau, Berchtesgaden and Munich. In 1894 a private school was established also in S. Cristina. 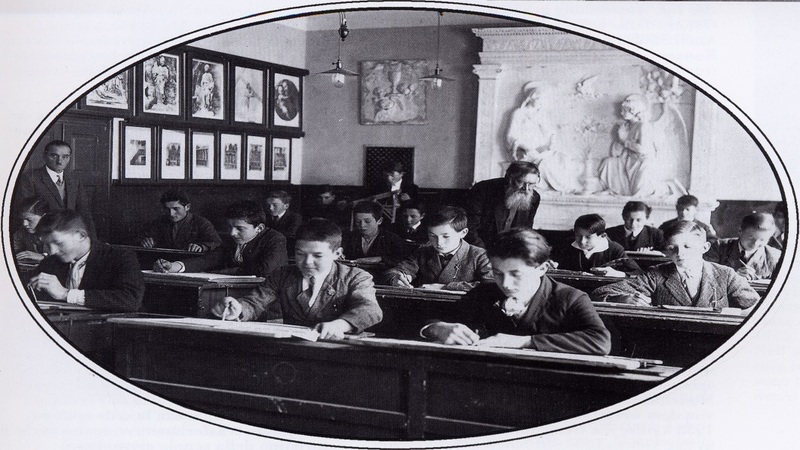 It was headed by the director of the school in Ortisei, whereas a certain Professor Raske taught a class of 12 scholars in drawing and wood carving. The manufactured sculptures were exported and the scholars received a minimal remuneration per day. But this school closed down after only four years because of the negative propaganda of the wholesalers, who saw only a danger for their interests in it. 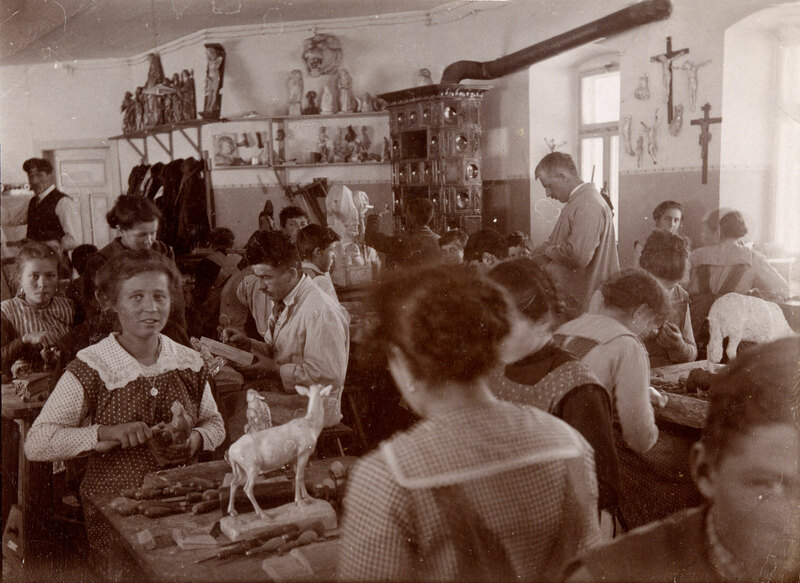 Thereupon, thanks to the commitment of the municipality Selva Gardena and the support of the Austrian government, a further sculpture school was built in Selva Gardena. This time the population themselves were the ones insisting on the necessity of such a school. 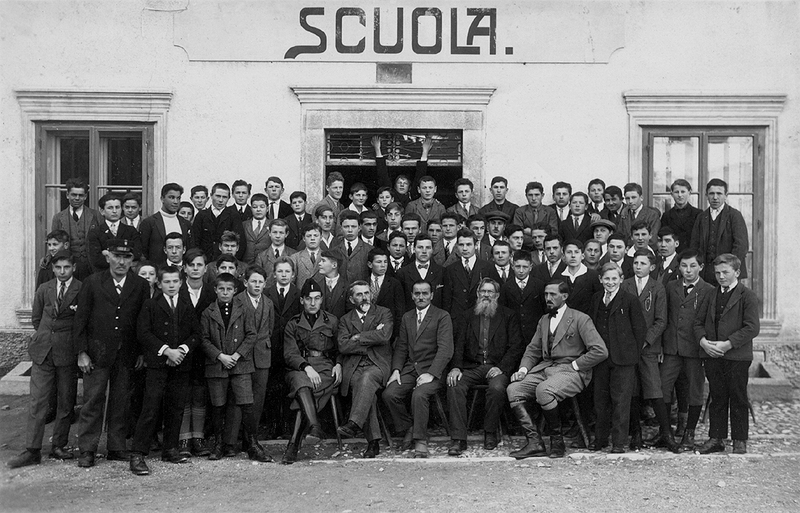 The building was finished in 1908 and named Scuola Professionale Imperatore Francesco Giuseppe in honour of the Austrian Emperor Francis Joseph. In contrast to the handcraft which continued to expand, the agriculture dropped behind more and more and lost its role as main source of income of the valley. 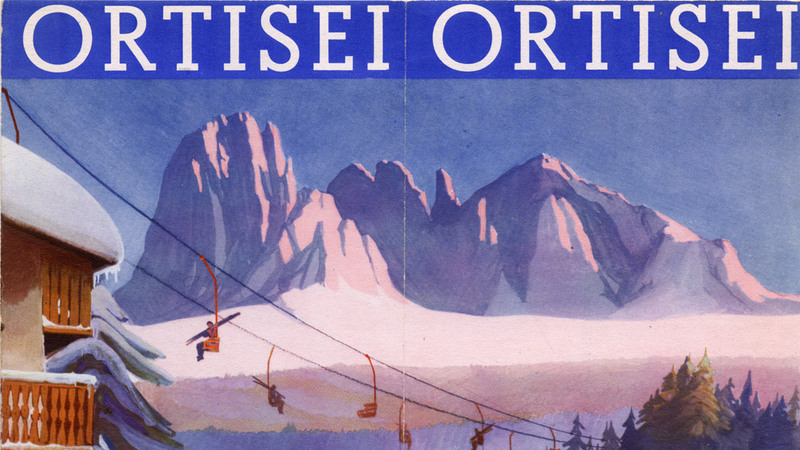 However, the wood carving industry evolved only in Ortisei, which had always been the commercial centre of Val Gardena. In the other municipalities, S. Cristina and Selva Gardena, as well as in the localities Bulla, Roncadizza and Oltretorrente, the situation didn’t change: the home workers specialized in the toys manufacture continued to depend on their wholesalers. 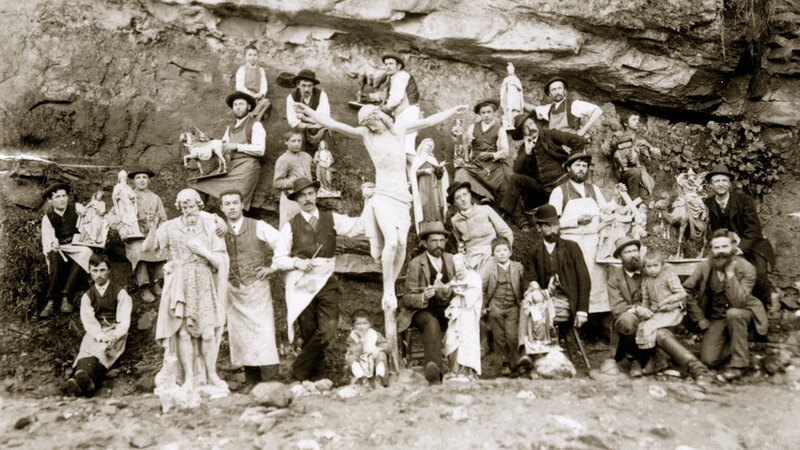 The numerous sculpture laboratories emerging in Val Gardena triggered a considerable migration movement towards the valley. 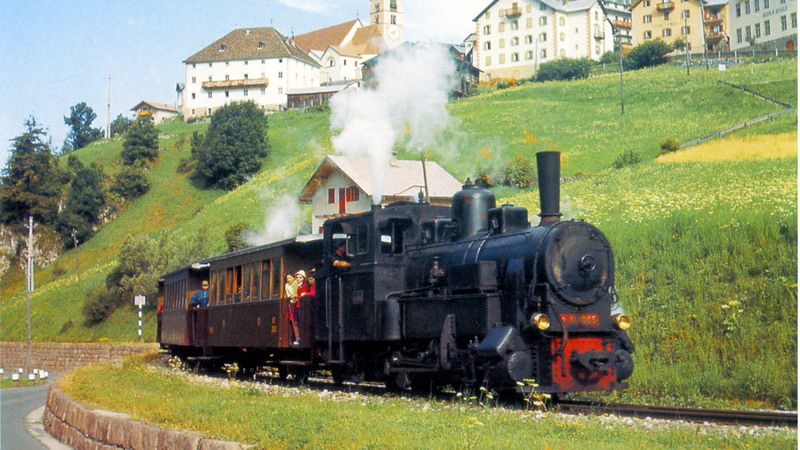 People came from neighbouring places such as Val Badia and Arabba, but also from other countries such us Bavaria and Austria-Hungary. 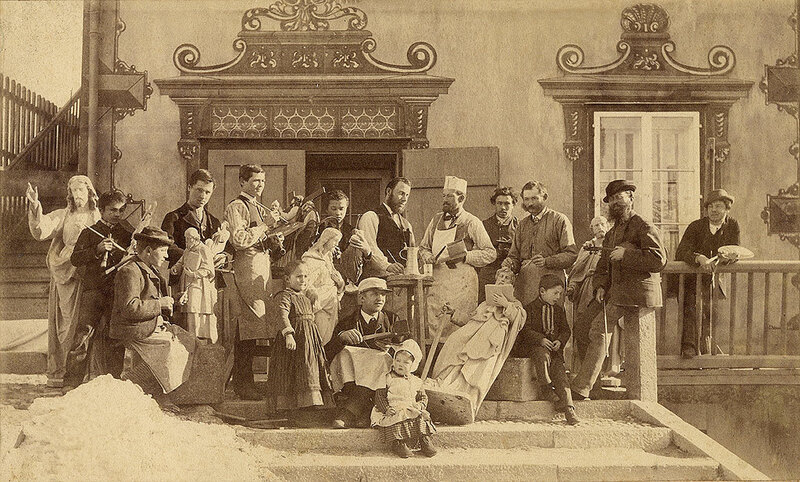 The immigrants found quickly a job as sculptors, painters, gilders and carpenters, and contributed to the economic boom of Ortisei. 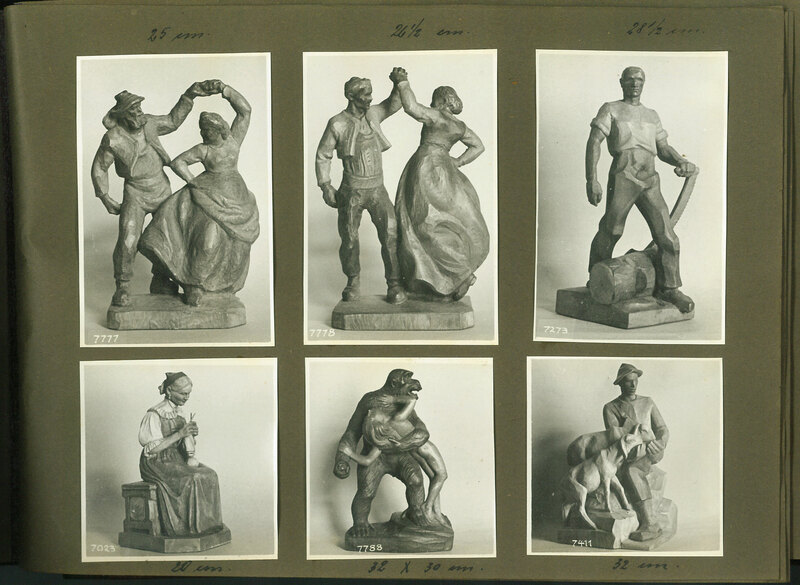 Until 1914, that is to say in less than 50 years, the number of sculptors, including masters and scholars, had increased from approximately 20 to 260. Also the number of painters rose significantly from approximately 4 to 85. Moreover, a new carpenter sector emerged which was specialized in the manufacture of altars and the interior decoration of churches. In those days, the products were exported around the world, above all to Great Britain and the British colonies, to Germany, Russia, Japan, China and Australia, whereas the exports to Italy and France stalled because of the high customs duty. 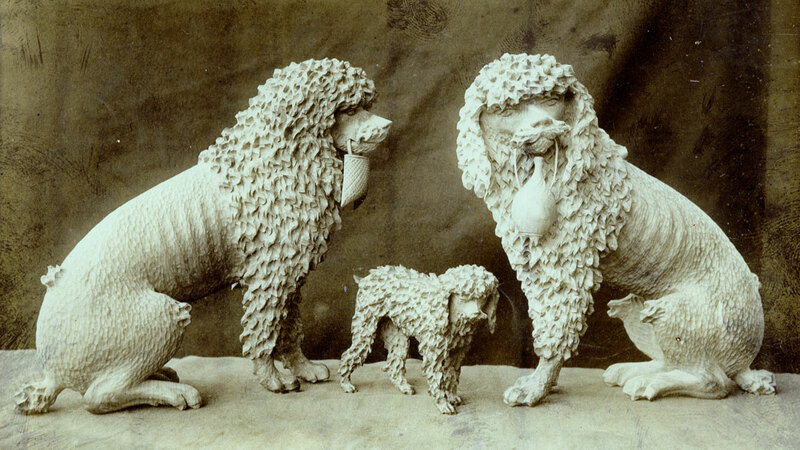 Due to the outbreak of the First World War, many sculpture laboratories had to close down and the cottage industry suffered severely. 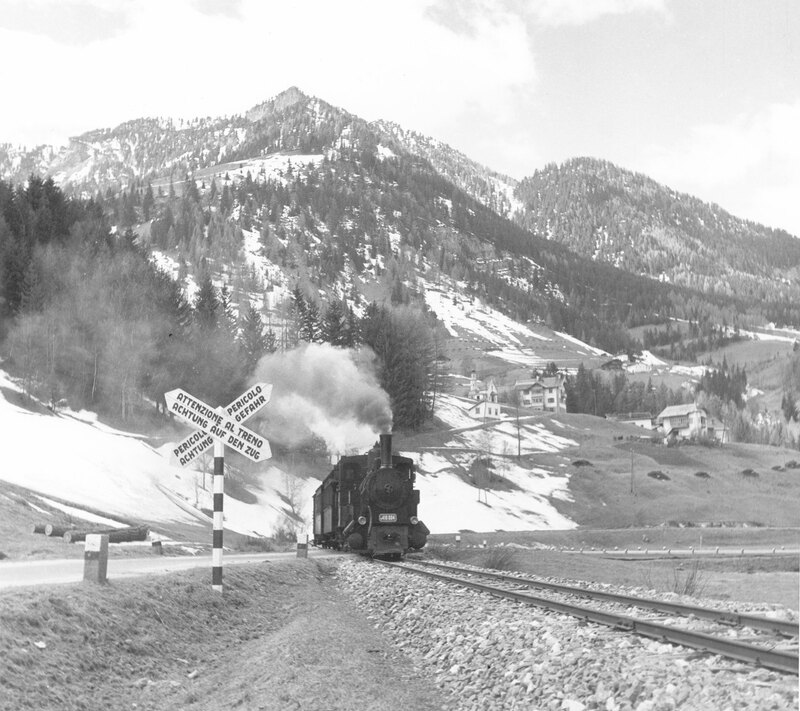 But this period featured also a positive effect: the construction of a narrow-gauge railway which connected Chiusa with Plan over a distance of 31 km and an altitude difference of 1072 m. The construction was decreed by the Austrian government, above all in order to supply the artillery at the Dolomite front who fought for the alliance Germany-Austria against Italy. 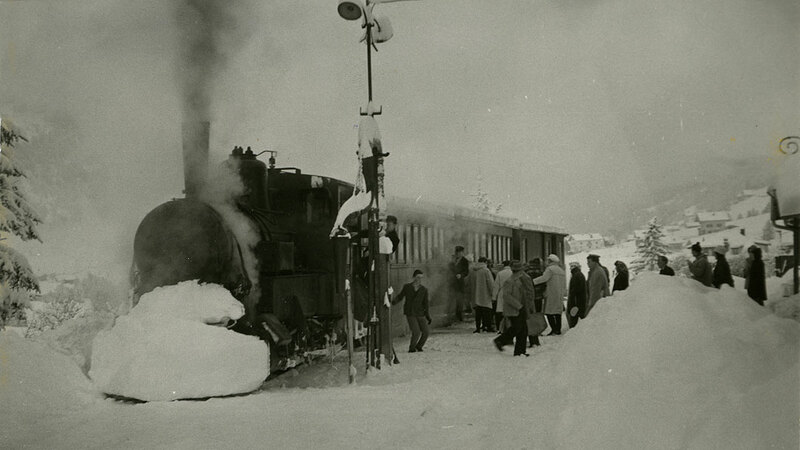 The rail route was finished in record time after only four months by Russian prisoners in 1915. In order to cut down additionally the construction time, the bridges and the crossovers were built provisionally in wood and only later on in stone. 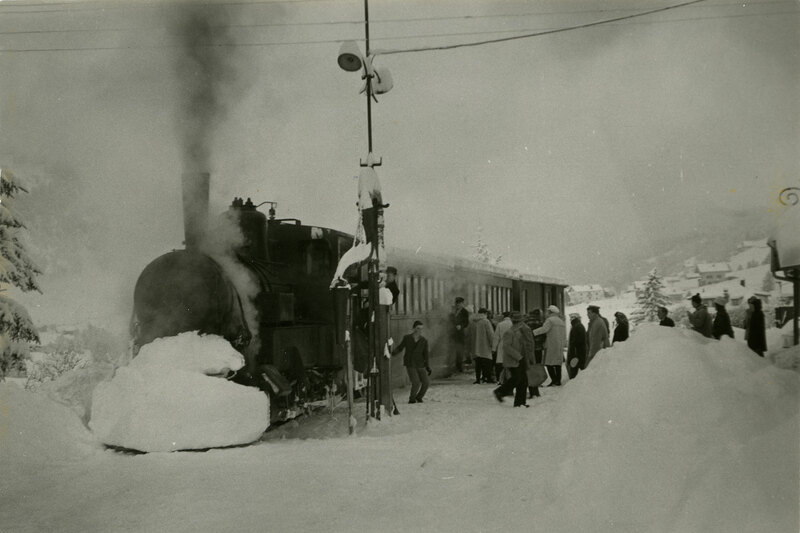 For many years the train of Val Gardena was a precious means of transportation for the valley and benefited moreover the development of the tourism as well as the sale of wooden products. But with the triumph of the car, the loud and slow train was soon shut down. 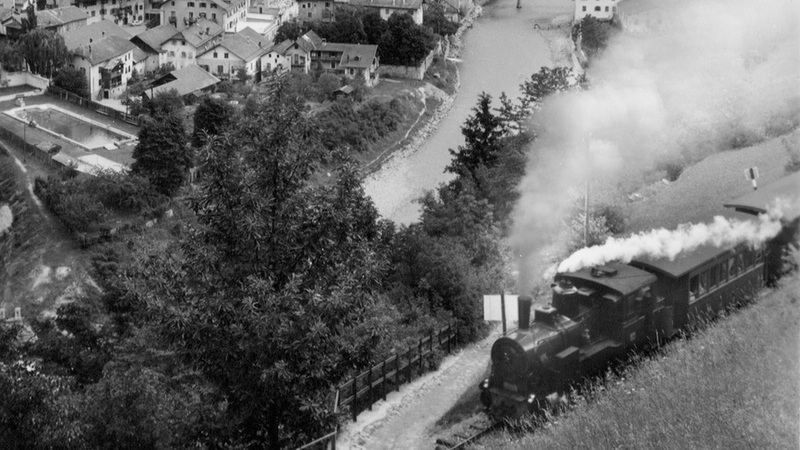 One part of the route was turned into a road, while the part in the upper valley was converted into a walkway connecting Ortisei with S. Cristina and Selva Gardena. 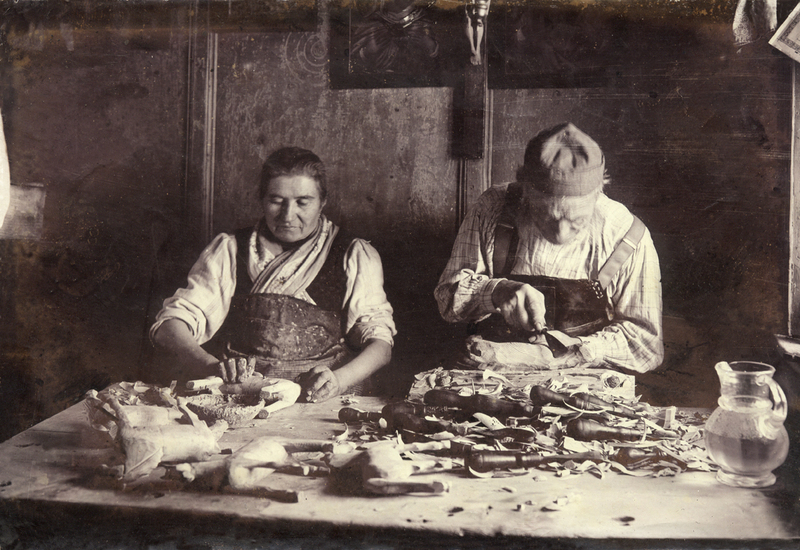 After the catastrophic consequences of the First World War, the recovery of the woodworking industry of Val Gardena was very sluggish. 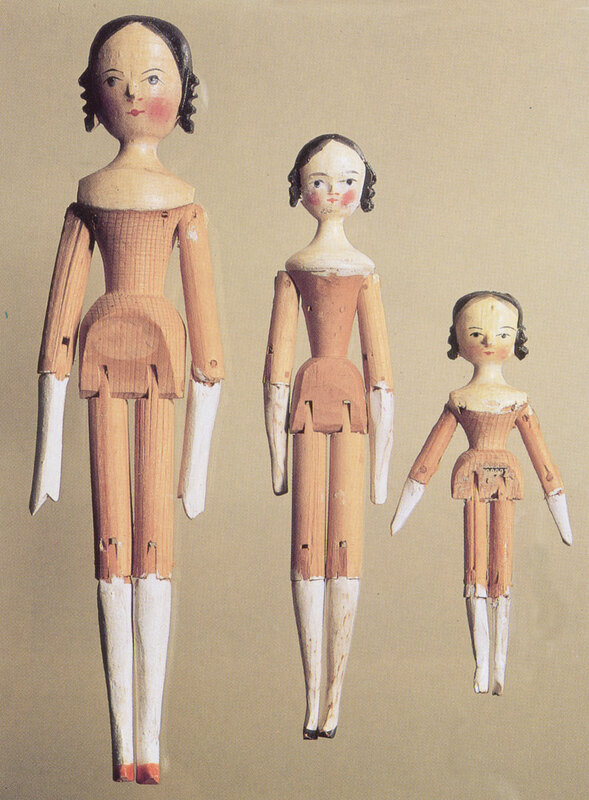 Many markets had been lost and the demand for wooden handcraft products remained for many years on a historical low. Besides the general economic problems, the people of the valley had to cope with the loss of many men who fall in battle. 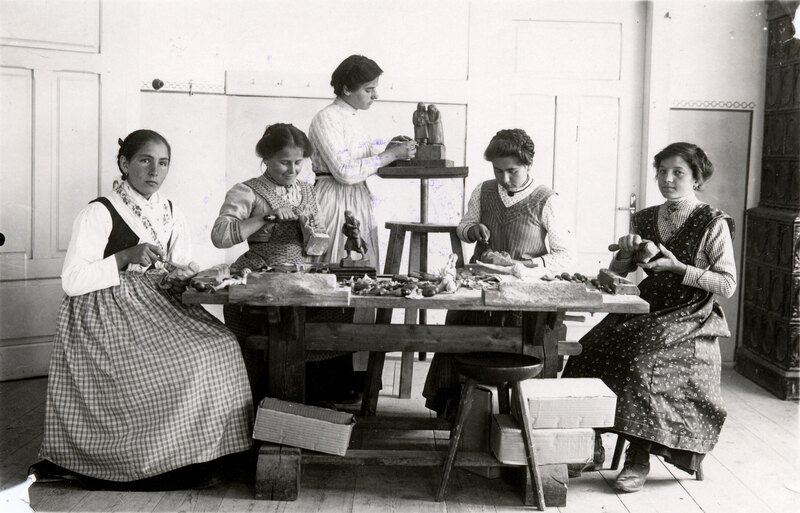 As many of them were qualified sculptors or excellent wood carvers, their absence was heavily felt during the reconstruction period. The uncertainty and the lack of perspective induced many wood carvers to look for a job in the neighbouring valleys or even in other countries around the world as for example in Argentina. 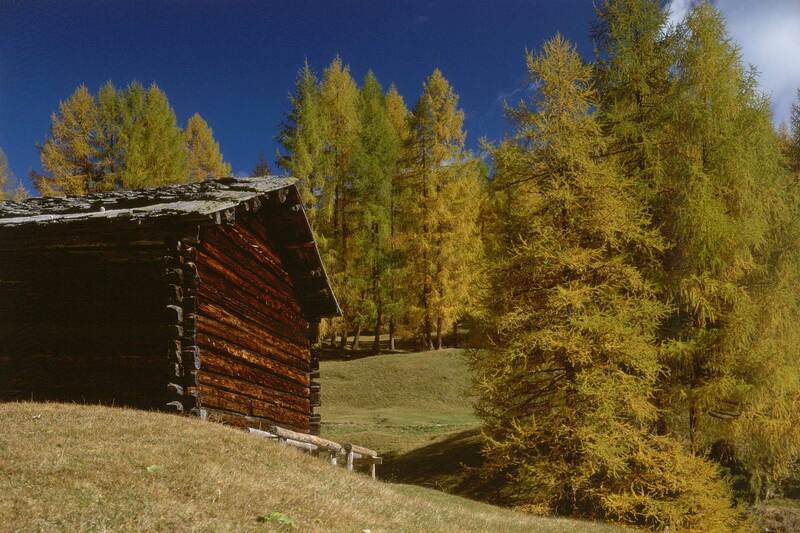 In addition, because of the annexation of South Tyrol to Italy, wood diminished dramatically in value. In the first post-war years, for some wholesalers it was more profitable to sell the wood as firewood than to use it as raw material for the woodworking industry. The only positive consequence of the war was that people began to attach much more importance to the quality of the finished products. In 1926 the exports started to rose again and the economic situation of the valley improved increasingly until the outbreak of the Second World War. 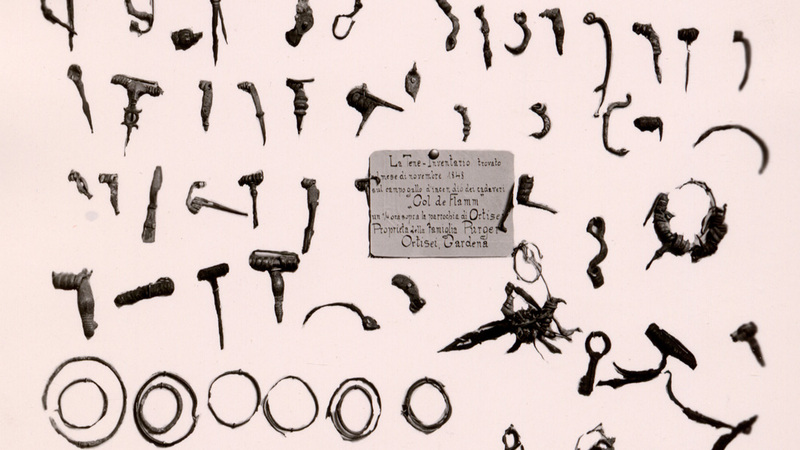 Also the sector of the small wooden objects experienced an upturn thanks to the ready sale of articles of daily use and ornamental objects such as corkscrews, pen-cases, ashtrays, chess pieces, small Madonnas, stylized crucifixes and other souvenir articles. 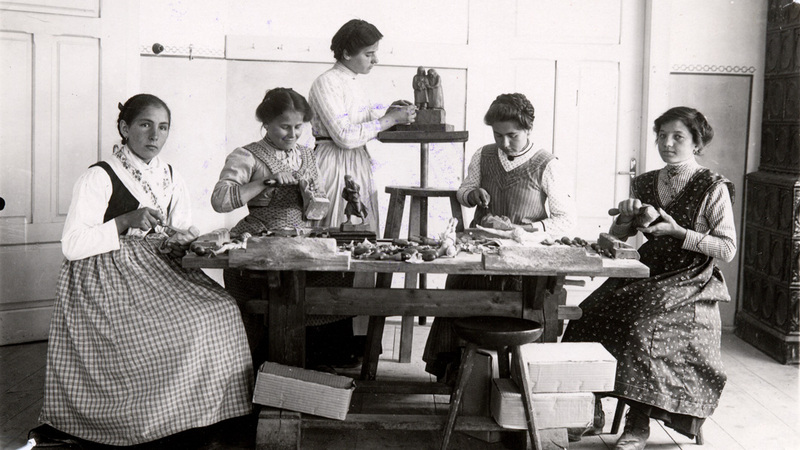 Before the First World War, half of the handcraft production consisted of altars and statues. 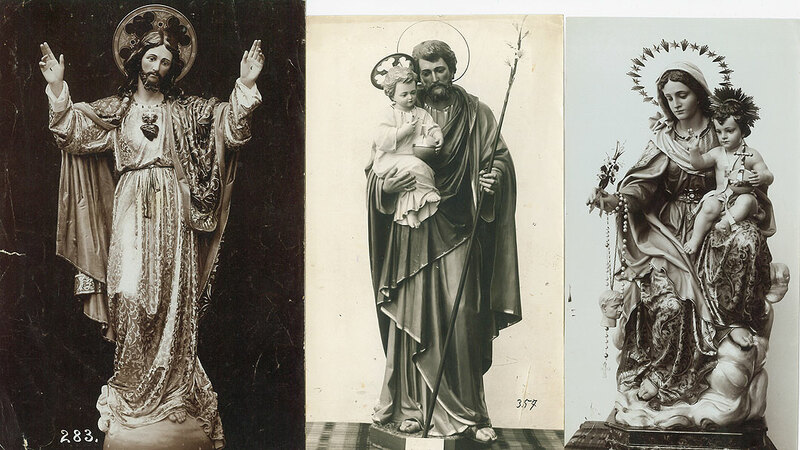 Whereas the production and sale of the latter continued, the construction of altars ceased almost completely. The downfall of Austria-Hungary played also a part in this development, as important markets within the federation broke away. 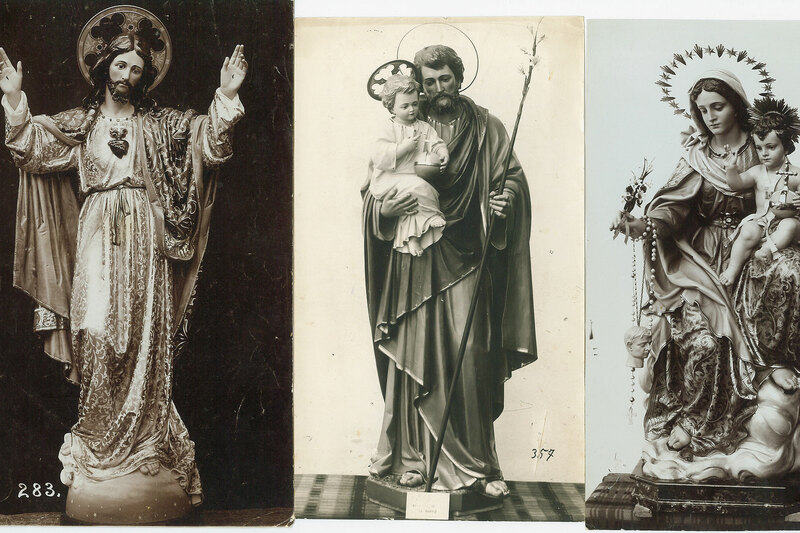 Moreover, the Italian market was more competitive because of the importance of marble as substitute raw material for the manufacture of altars and religious sculptures for the churches. A further production sector which in this period became less important was the toy sector. The wholesalers were not able to interpret and satisfy the new requirements of the clients, and were also faced with the strong competition from the businesses producing toys of other materials. 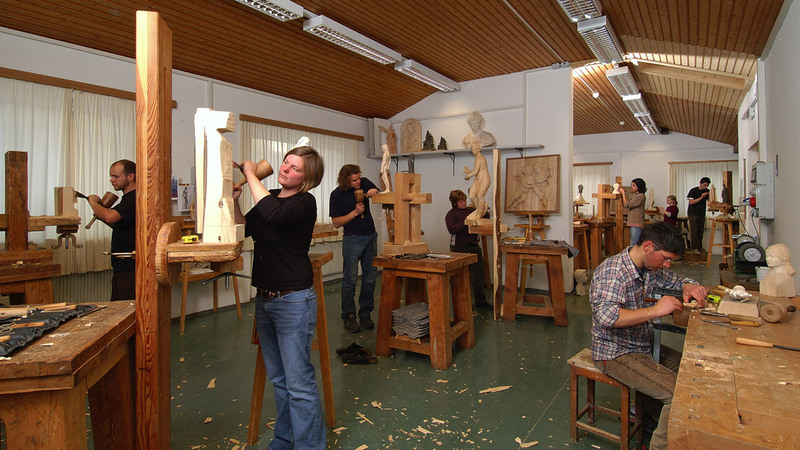 But thanks to the two vocational schools in Ortisei and Selva Gardena, the wood carving industry of Val Gardena improved substantially through original and creative solutions and a higher technical perfection. Hence all the efforts of the two municipalities for the erection of the schools were rewarded. 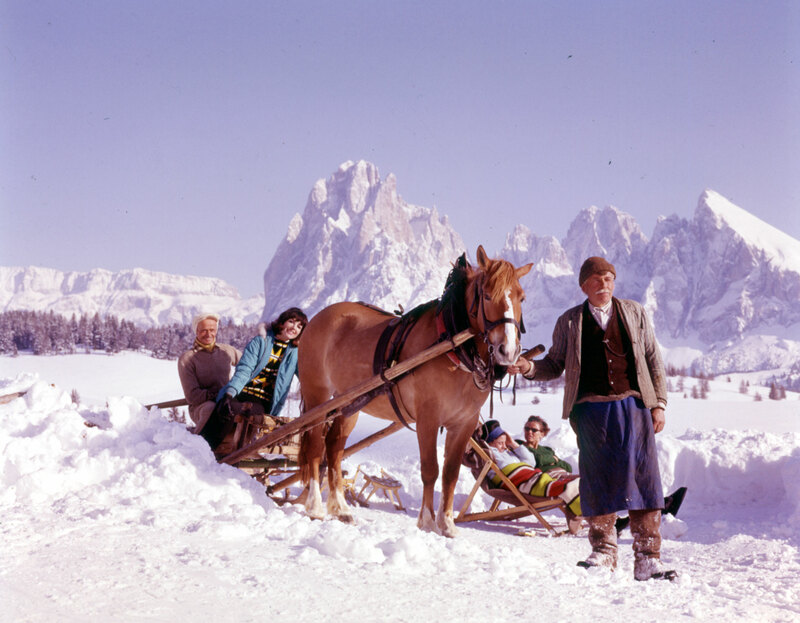 Unfortunately, the high artistic quality in the woodworking sector wasn’t sufficient to front the worldwide economic crisis of the 30s, and Val Gardena experienced again a period of severe economic difficulties. Right before the outbreak of the Second World War, half of the production was exported to the United States, followed by Germany and Great Britain, whereas only 5 % of the products were intended for the national market. 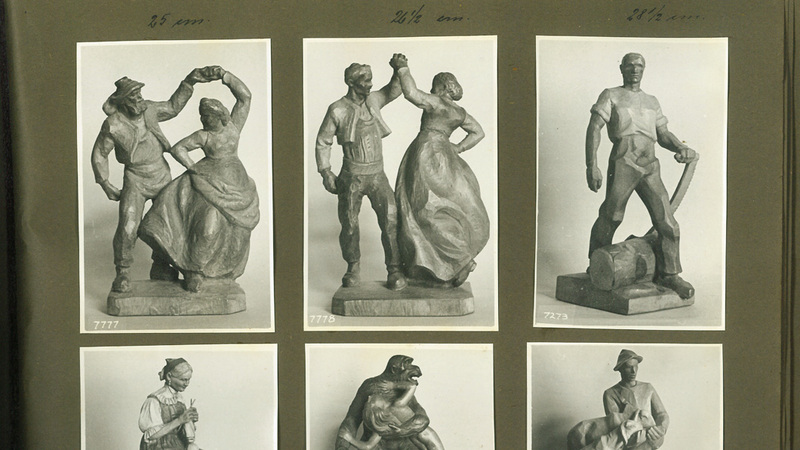 The consequences of the Second World War were far less serious than the ones of the first one, and towards the end of the conflict, some influential members of the American troops campaigned for the rebound in the demand for sculptures of Val Gardena. The remainders of stock were sold out and in a short time the contacts with the American market were restored. 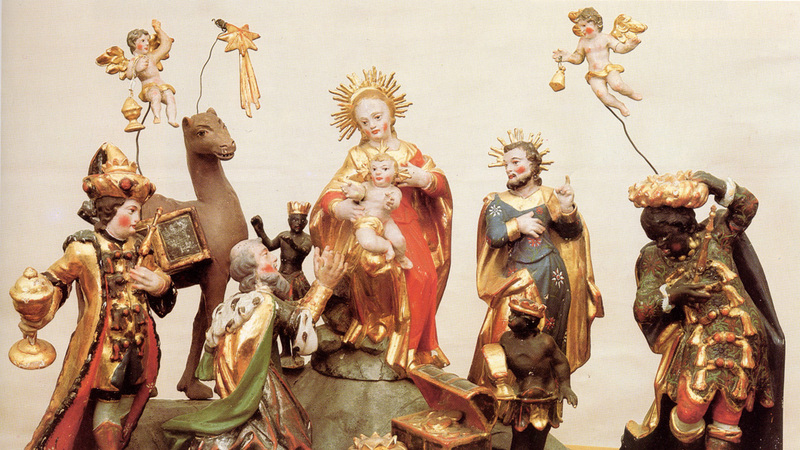 Also the demand for religious sculptures rose again. 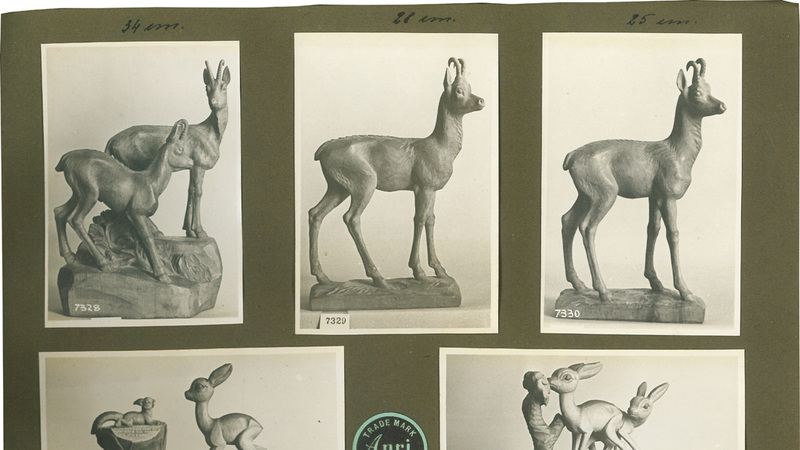 At the beginning of the 60s, at least 2/3 of the manufactured sculptures were exported; between 75 and 80 % of this amount went to the United States. 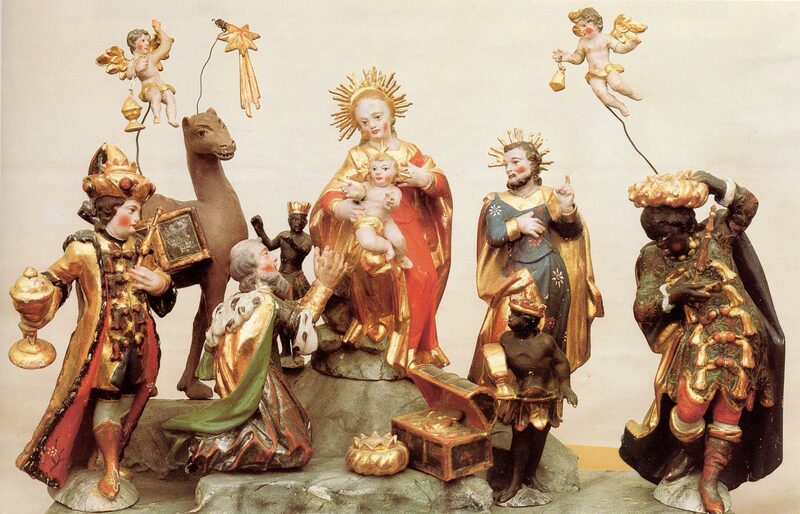 The North American market was especially attractive due to the widespread Catholicism and the tendency of the Church to prefer a simple liturgic decoration. The exports to South America outranged the ones to European countries too, inclusive Germany, which in the meanwhile had lost its importance as business partner, above all in the first post-war years. The succeeding Vatican II reforms (1962-’65) including even soberer statutes, led for several years to a complete stall of demand on the market. 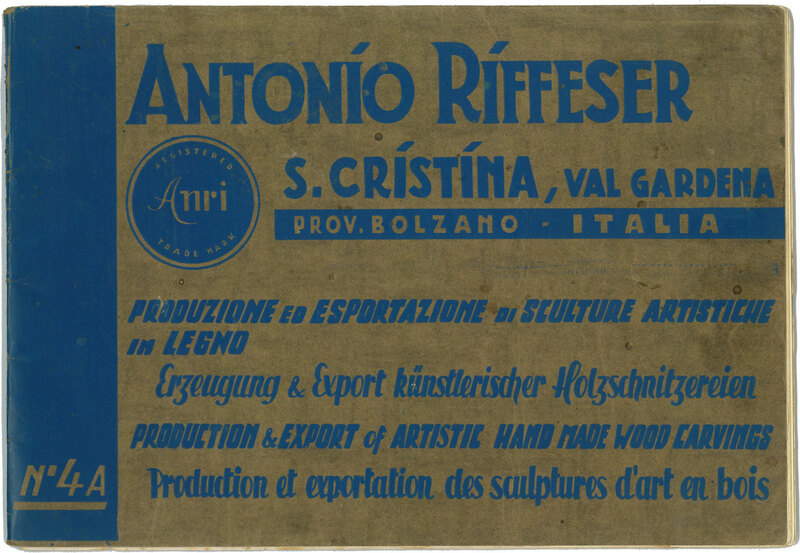 What continued to work well was the business with the small wooden figures with countries such as the United States, Germany, Switzerland and Italy. In contrast to the pre-war period, the sale of small products on the national market increased until representing 25 %. 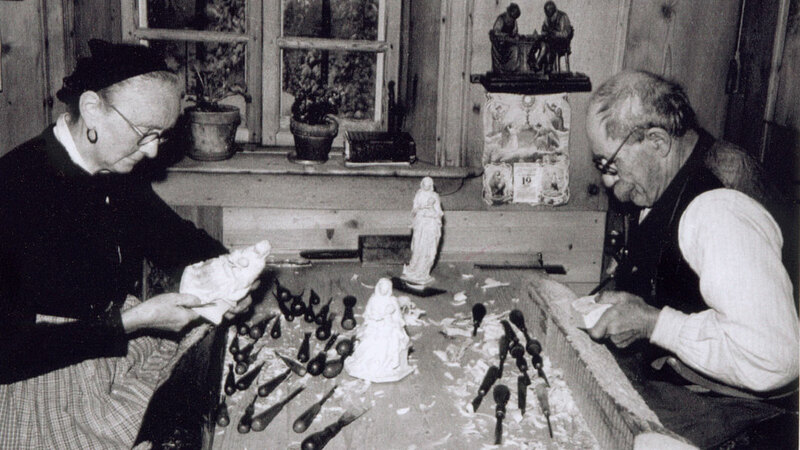 Val Garden’s wood handcraft had reached such a dimension that there were no family left in the valley which wasn’t in possess of the necessary tools to carve a statue. 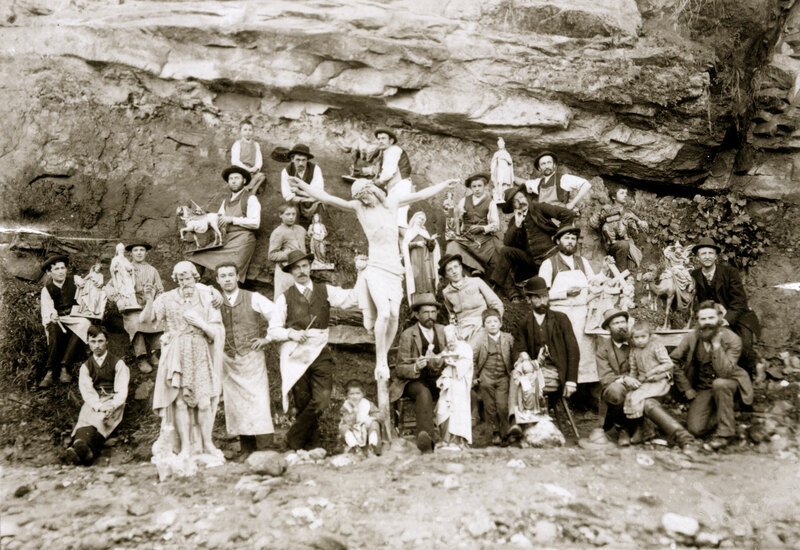 In 1965 approximately 2000 people were employed in the sculpture sector, which corresponds to 1/3 of the entire valleys’ population. As regards the organization of the handcraft, two tendencies could be made out: while the wood carvers joint forces, the sculptors and the painters preferred to have a more individual work status. Therefore, the big sculpture laboratories employing between 15 and 20 scholars, which had characterized Ortisei until 1900, disappeared. 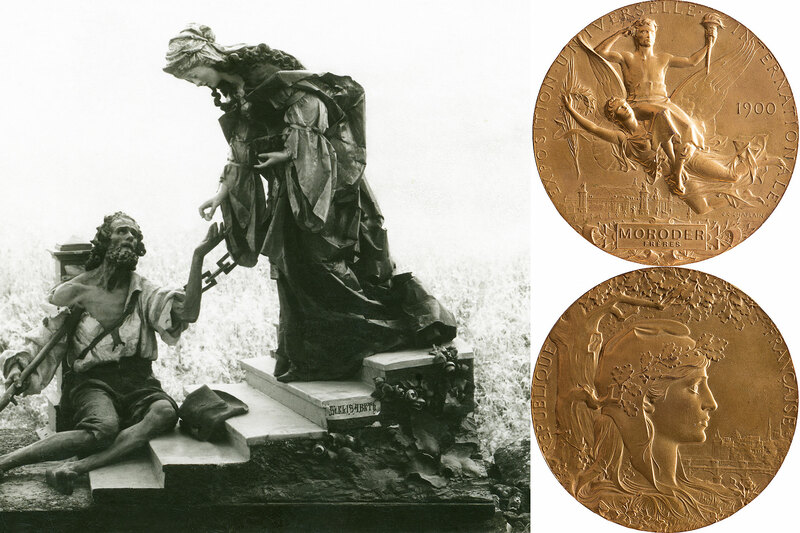 This change is to attribute to three factors: the desire of the sculptors to free themselves from the dependence of the wholesalers, a continuous increasing demand for wooden figures, which also became more and more challenging, and fiscal reasons. 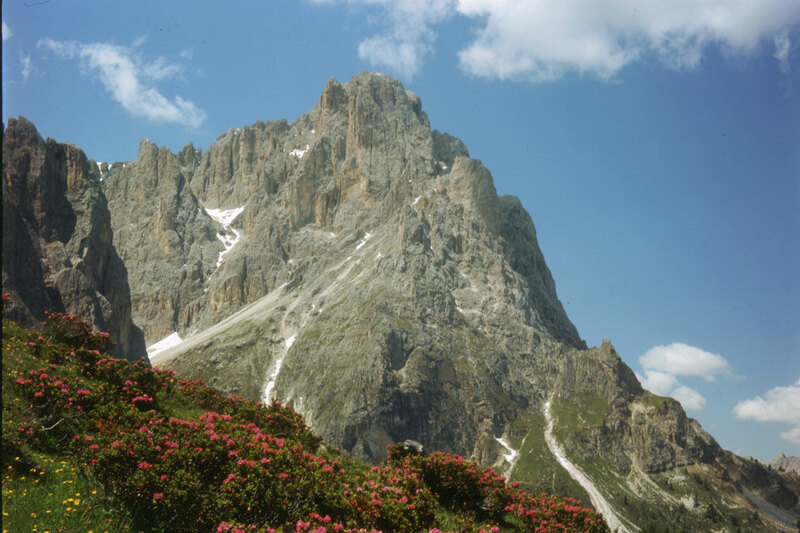 Through the strong demand for sculptures of Val Gardena after the Second World War, the limits of the valley’s production system came to light. With the putting-out system the people of Val Gardena couldn’t keep up with the more and more competitive world market. The old system made it impossible for the wholesalers to control the quality and the delivery time of the sculptures by the home workers, as those not always were able to manage all the requests coming in from several wholesalers. Moreover, neither the artisans nor the wholesalers were interested in modernizing the production process as the new models were regularly copied by the competition. Consequently, they risked not to meet the requirements of the clients or of the new market, which in the meanwhile had developed and on which excellently worked merchandise as well as fast and secure delivery times were asked for. This new situation made the wholesalers take in hand themselves the production of the sculptures. The use of modern machines enabled a significant increase in the production, a greater precision and thus higher profits. In addition, a punctual delivery of the orders could be guaranteed. Among the new businessmen, Anton Riffeser stands out because of his very special “nose” for business issues. His story shows once again that individual initiative is often pivotal for the development of a century-old handcraft tradition. 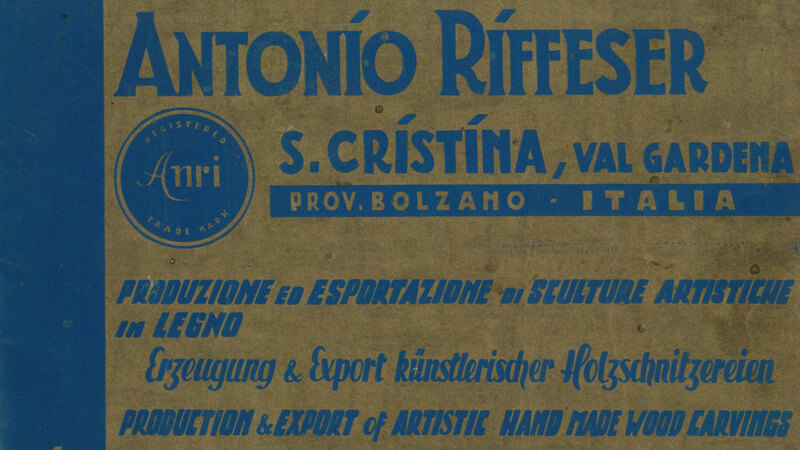 Hence the firm ANRI (ANton RIffeser), founded already in 1925, was the first factory which attacked with courage challenges in the production management unknown until then. 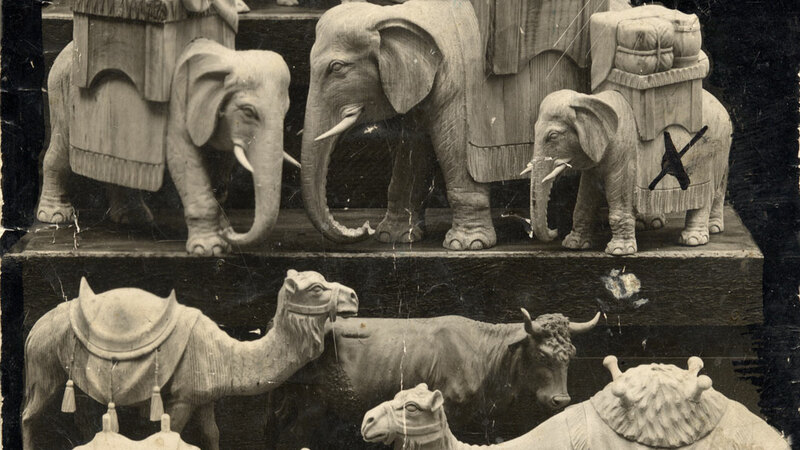 After the Second World War, the factory was enlarged and equipped with the first machines such as wood carving machines for the first rough handling of the sculptures. This firm was also the first one in the valley in possession of a wood drying plant and to open a branch in Germany. For many years the firm was of fundamental importance for the economy of the valley, as it offered jobs for numerous people: in 1952 the firm had 50 employees, three years later the number increased to 150, two more years later the employees were 230 and in 1965 280. The firm ANRI still exists, but its importance within the social order for the valley has diminished, among other things because of aspiring family businesses such as the firm BERGLAND. 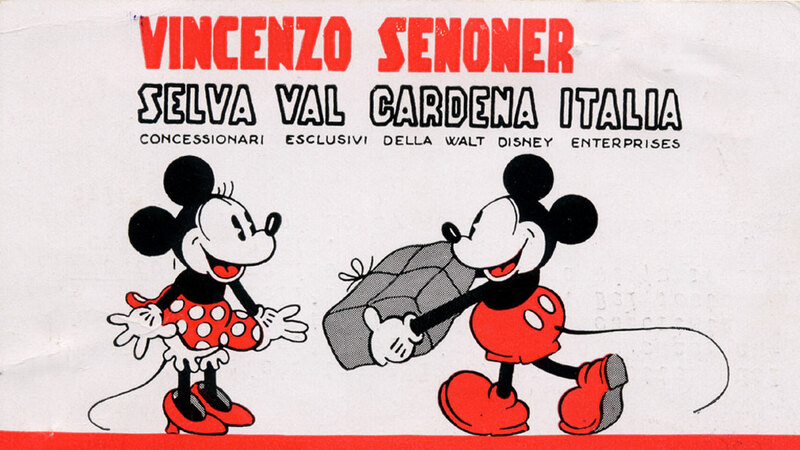 A further example for the industrialization is the firm SEVI (SEnoner VInzenz), which was specialized in the wooden toys production. 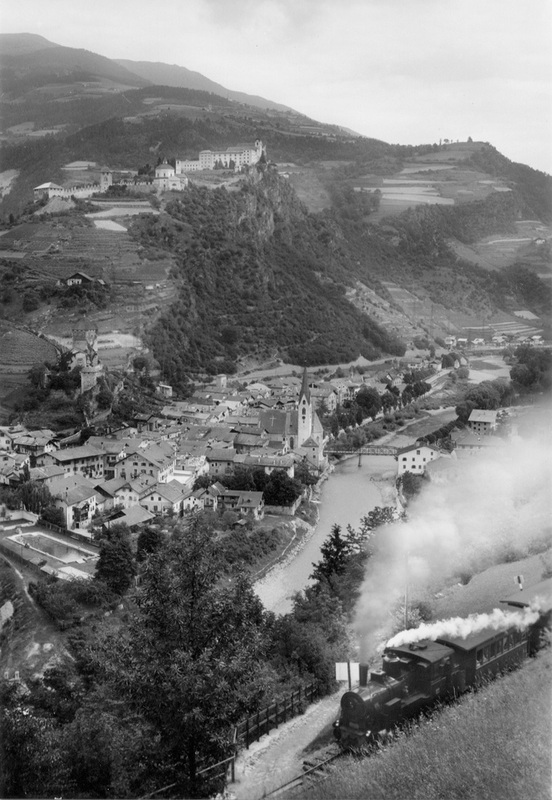 The seat of the management was in S. Cristina, whereas the works were erected in Pontives, at the entrance to the valley. In this type of factory, for example ANRI and SEVI, both carvers and painters worked in the same plant. New was the fact that the various tools and machines were put at disposal by the employer, who also paid the employees a monthly salary. Initially, these factories were heavily criticized by the population, but with time passing they realized the advantages of the activity as an employed person: you had a fix salary, were medically and accident insured, received bonuses, family allowances and a pension, and you could exercise your job in comfortable and spacious rooms. Up to that point in time, such working conditions were unknown to the carvers and the painters. But in the last years it can be noticed a clear countertendency, as the large industrial companies have to cope with more and more difficulties. 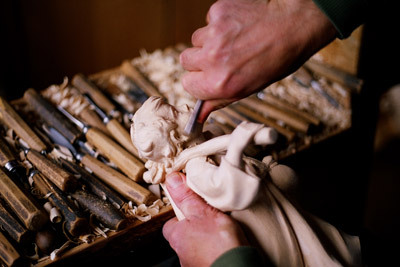 The delicate work phases such as the final processing of the figures, the assembling of the various pieces and the painting of the sculptures have necessarily to be made by hand. For that reason, the large firms have a high fixed cost and less flexibility in the management, and therefore struggle in periods of crisis. If a firm is not able to reach the planned sales volume, it is forced to dismiss personnel and, in extreme cases, to shut down, as it happened with the firm SEVI. On this account, lately small family businesses came out on top because they can back on a higher flexibility, a greater originality and quality of the products, an excellent relationship with the clients and above all on a considerable cost containment. Hence we could almost talk about a return of the putting-out system: the firms commission orders to the home workers and sell the articles manufactured for them under their own brand.